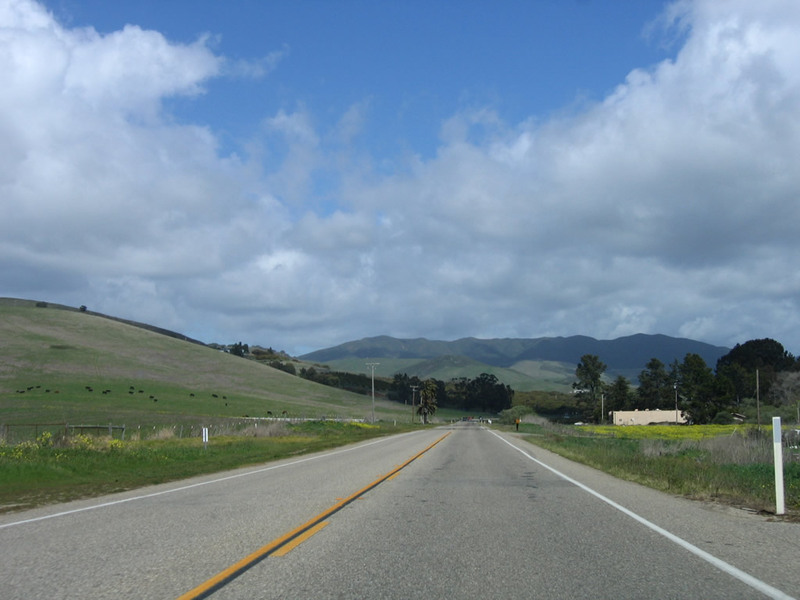 California 41 is a north-south state route that starts at California 1 in Morro Bay, travels east to U.S. 101 in Atascadero, then proceeds northeast through the Central Valley toward Fresno. 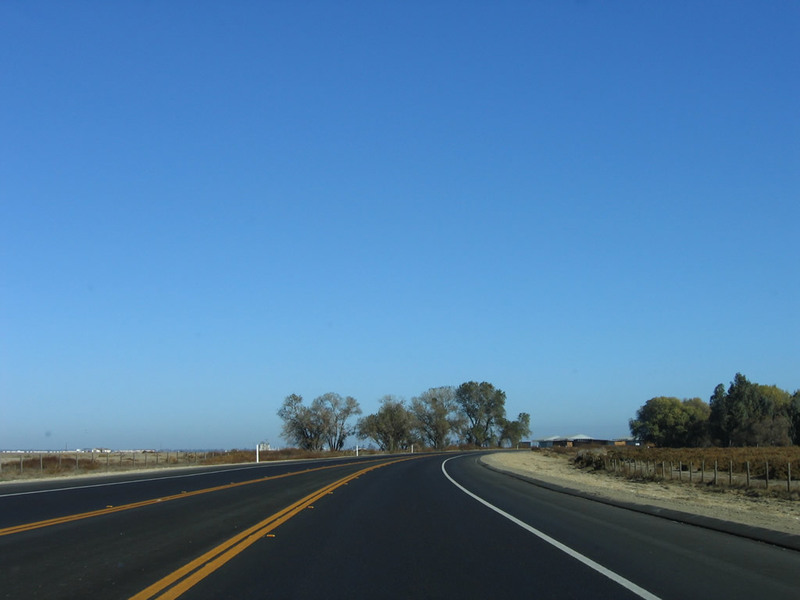 The highway changes into a freeway as it passes through Fresno, then culminates its journey at the southern entrance to one of the crown jewels of the National Park System, Yosemite National Park. 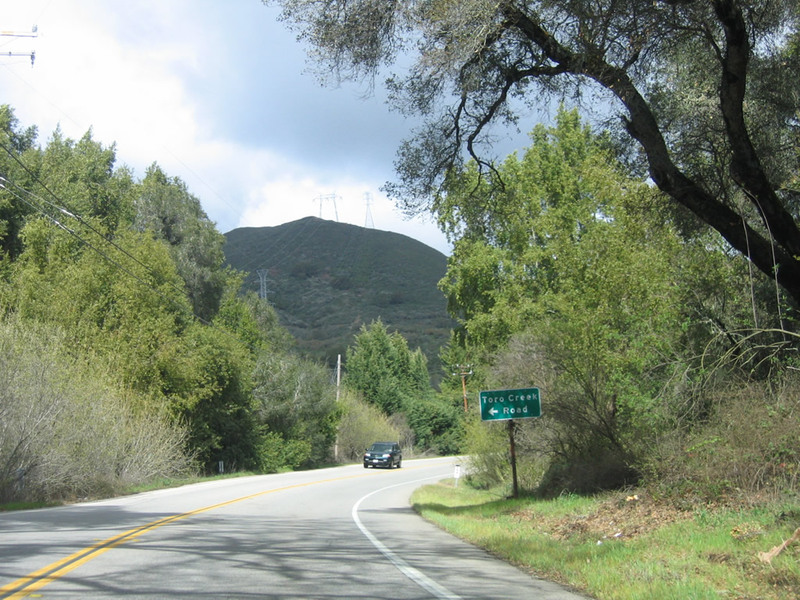 After separating from California 1 (Cabrillo Highway) in the city of Morro Bay (population 10,350 as of the 2000 Census), this reassurance shield for California 41 east is posted along Atascadero Road, which becomes the E.G. Lewis Highway. Photo taken 03/18/06. 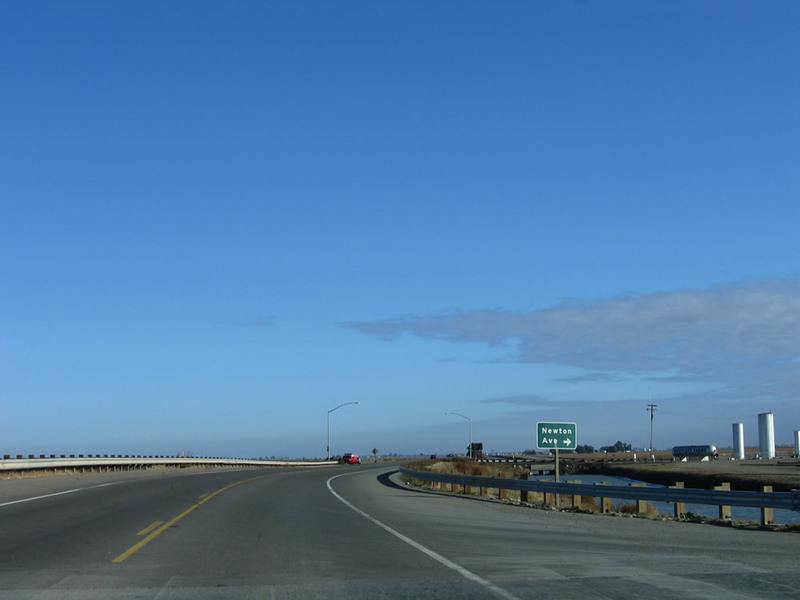 Leaving Morro Bay, California 41 travels northeast along a two-lane alignment toward Atascadero and generally follows Morro Creek through Devils Gap, then follows Atascadero Creek for the final distance into downtown Atascadero. Photo taken 03/18/06. 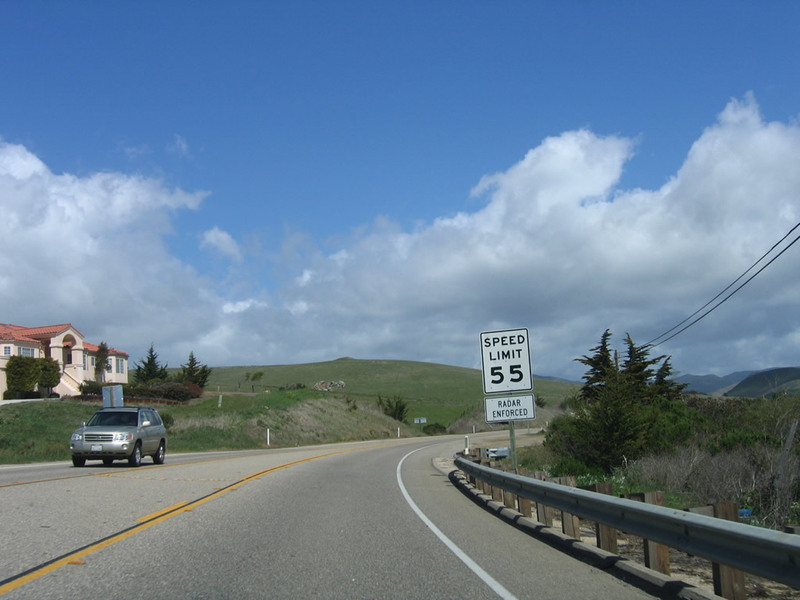 The speed limit of California 41 remains 55 miles per hour for this stretch of highway. Photo taken 03/18/06. An E.G. 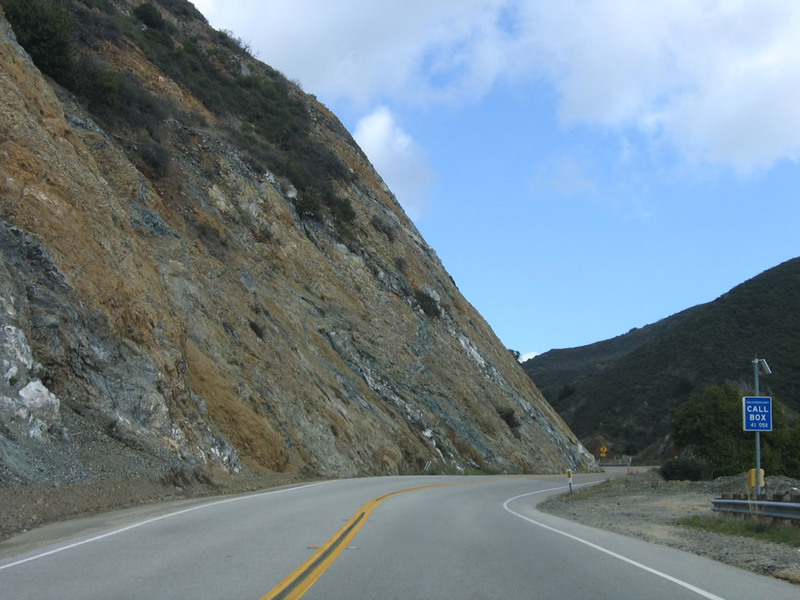 Lewis Highway trailblazer is posted as California 41 narrows somewhat. 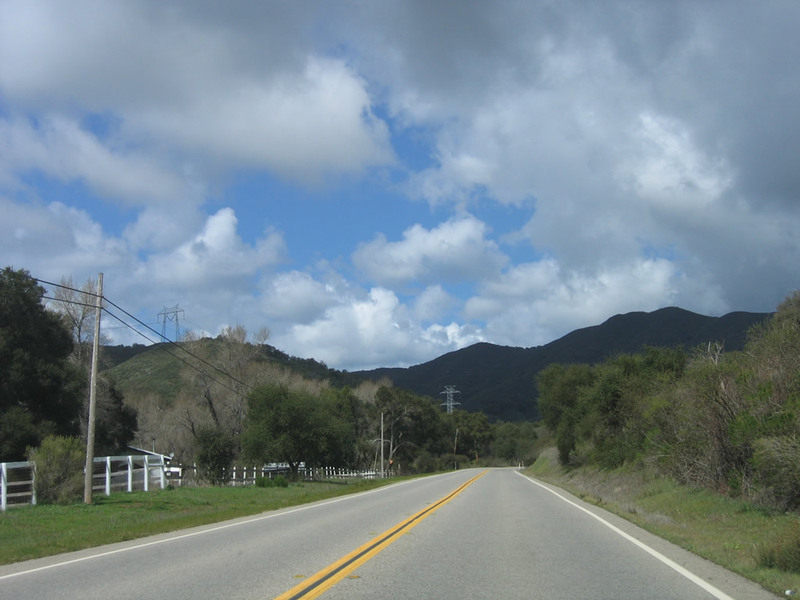 Edward Gardner Lewis founded Atascadero as a utopian colony staring in 1915, and he built what is now California 41 (former U.S. 466) between Atascadero and Morro Bay. Photo taken 03/18/06. 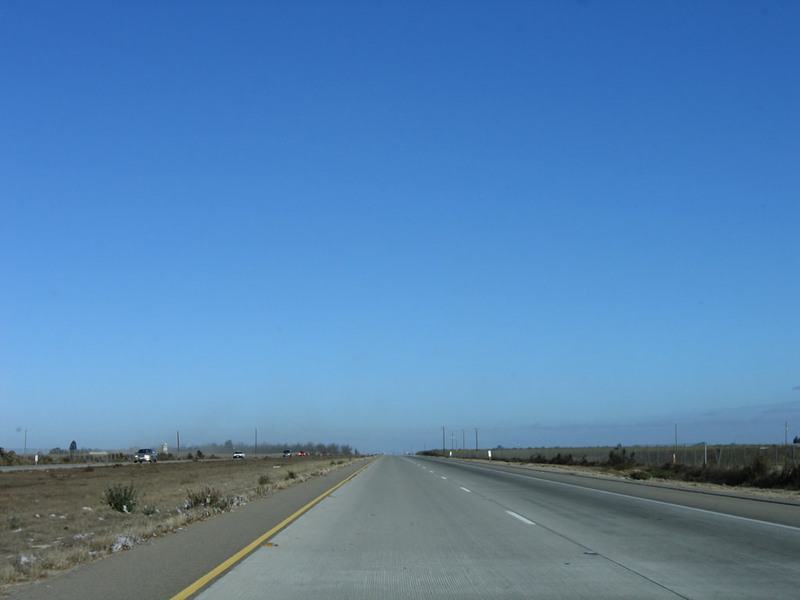 The first several miles of eastbound California 41 (E.G. 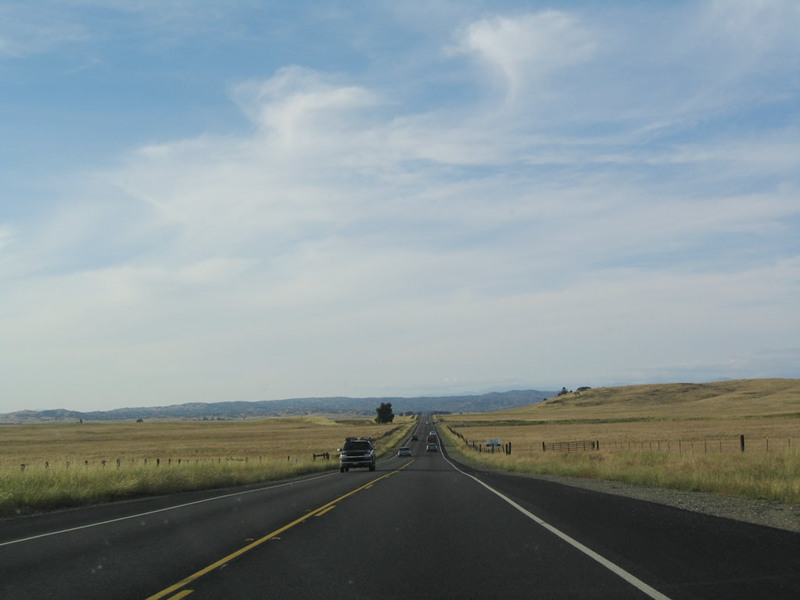 Lewis Highway) passes through rolling hills and serves local farms and ranches along the way. 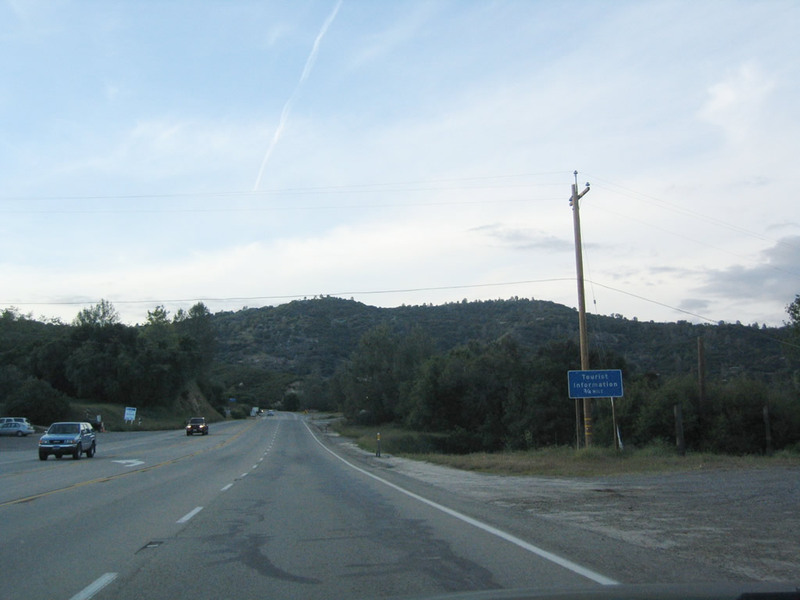 However, the highway eventually must pass through Devils Gap to make the connection to Atascadero. Photos taken 03/18/06. 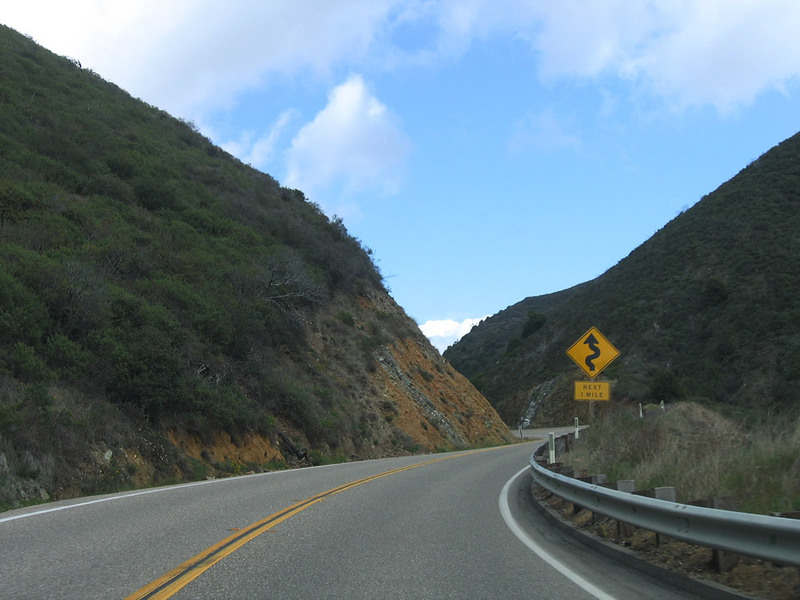 California 41 passes through Devils Gap; the road features several sharp turns and a steep slope alongside portions of the roadway (watch for potential rock slides). 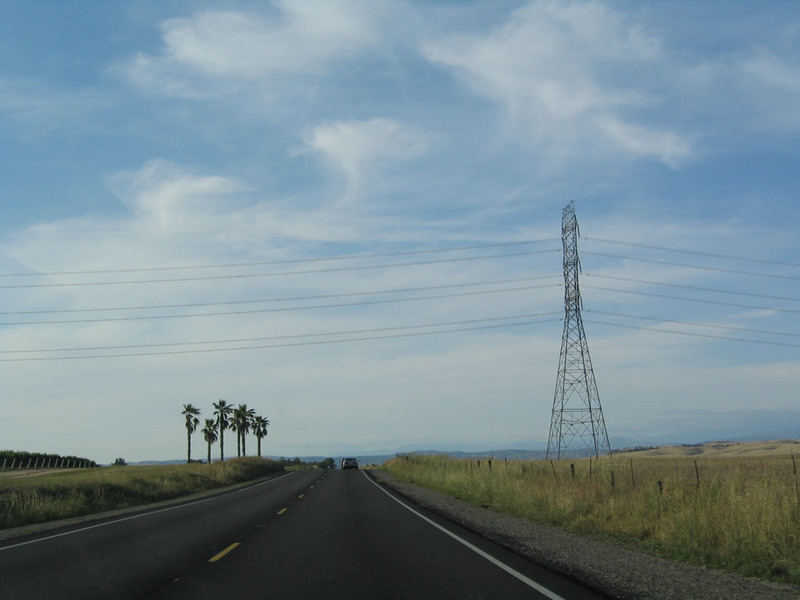 The overhead power lines are part of the connection between the Diablo Canyon Nuclear Power Generating Station and the Path 15 500kV power lines in the Central Valley. Photos taken 03/18/06. Continuing east, the highway again straightens out with fewer curves. 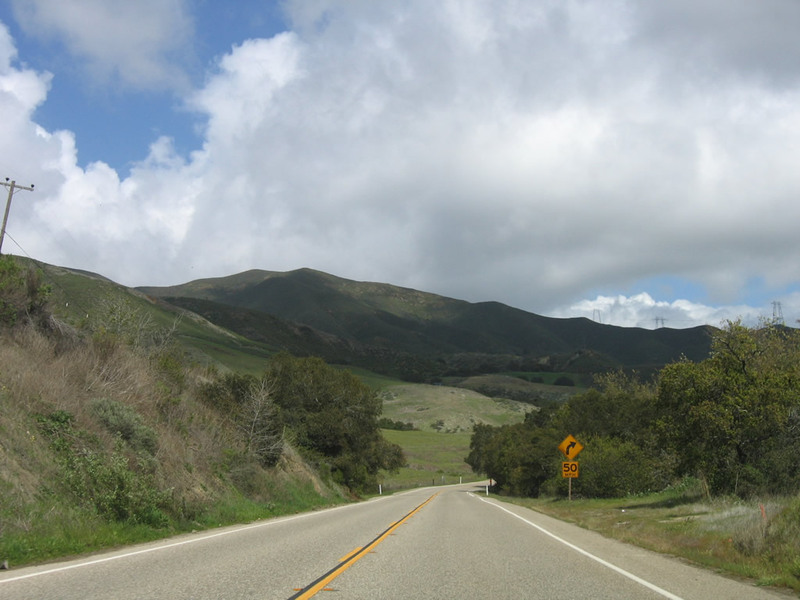 A few ranches are found along this section of California 41 (E.G. 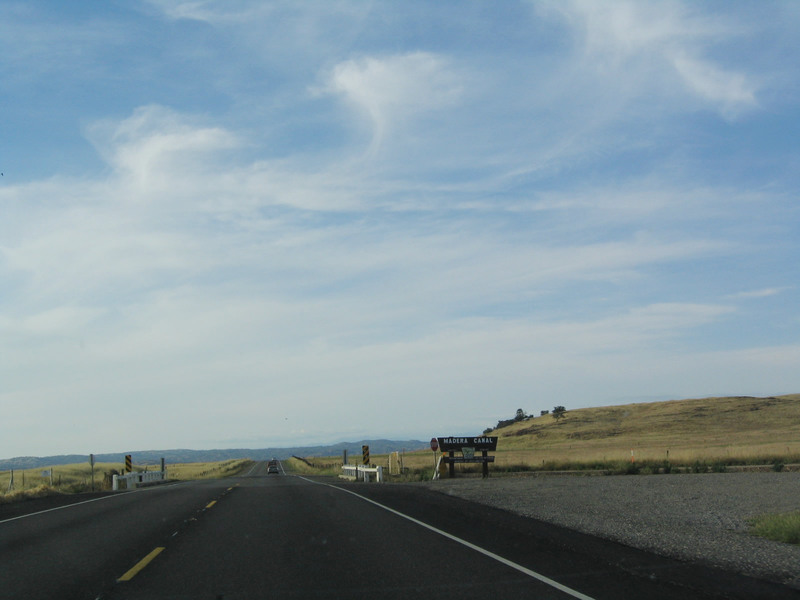 Lewis Highway). Photos taken 03/18/06. 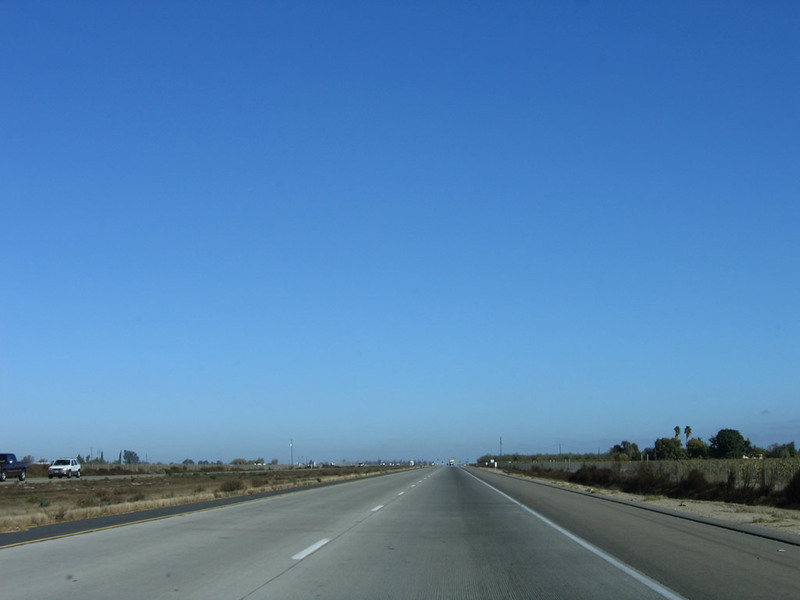 Eastbound California 41 (E.G. 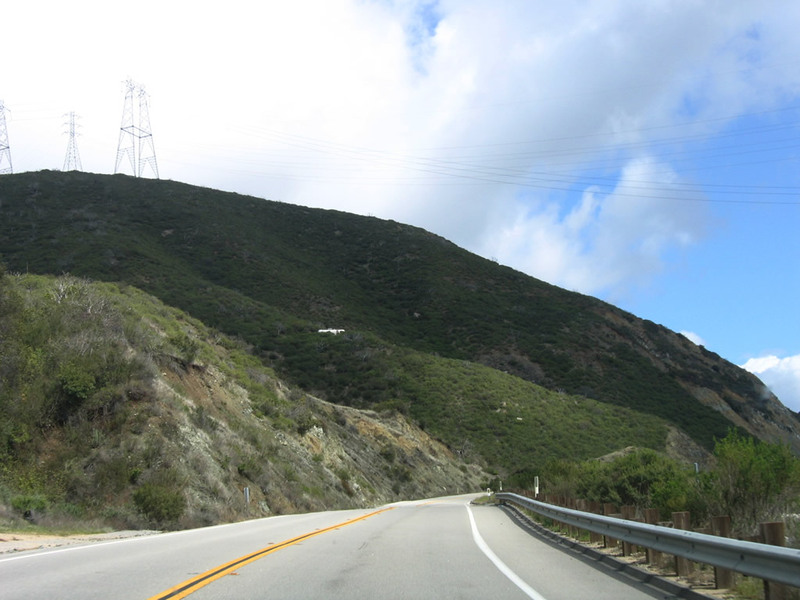 Lewis Highway) approaches Toro Creek Road as it follows along Morro Creek. Photo taken 03/18/06. 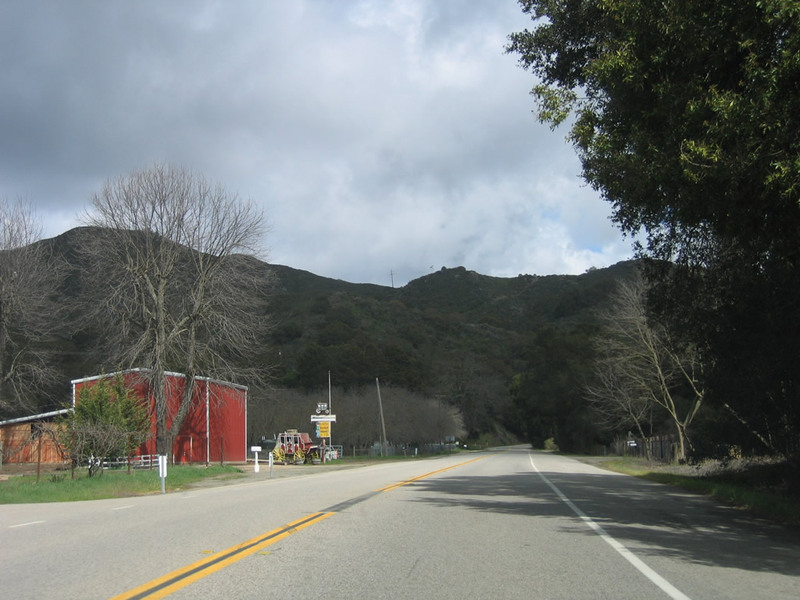 A large red building on the north side of the highway adds some color to some beautiful vistas along California 41. Photo taken 03/18/06. A cut was made here to allow California 41 (E.G. Lewis Highway) to pass through this mountain. Photo taken 03/18/06. 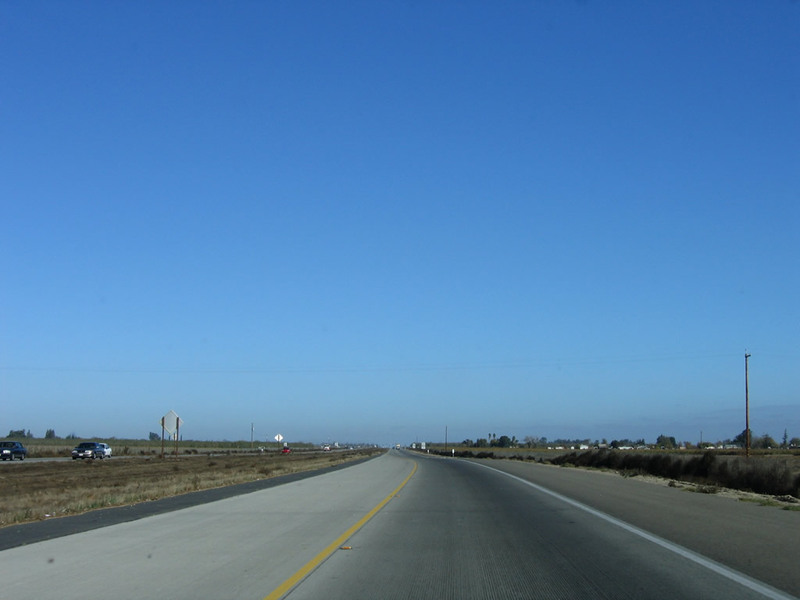 Eastbound California 41 (E.G. 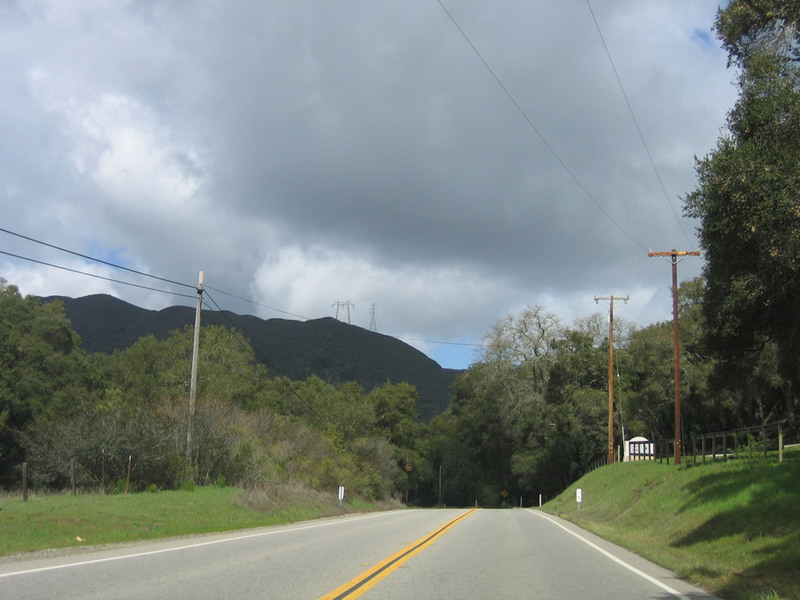 Lewis Highway) enters the city of Atascadero, which has a population of 26,411 as of the 2000 Census, sits at an elevation of 879 feet, and consists of 26.7 square miles. 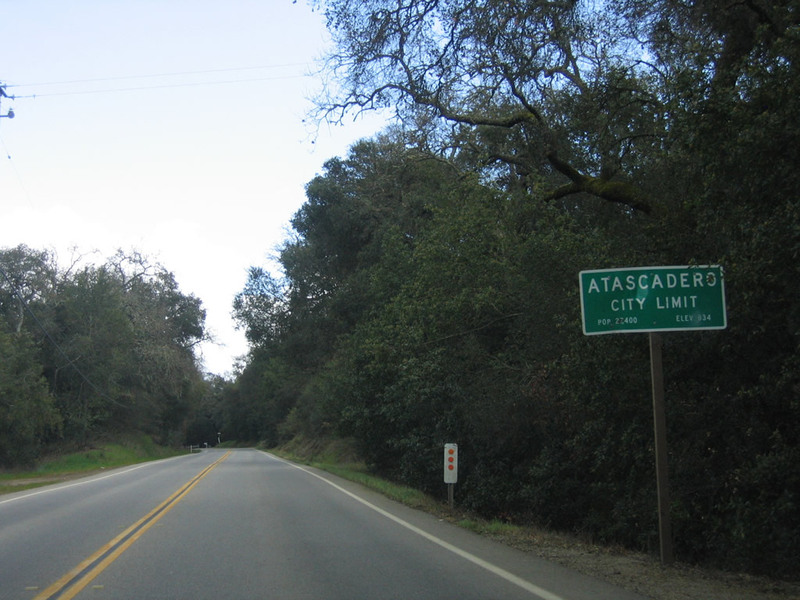 Located approximately 225 miles from either San Francisco or Los Angeles, Atascadero was founded in 1913 and incorporated in 1979. 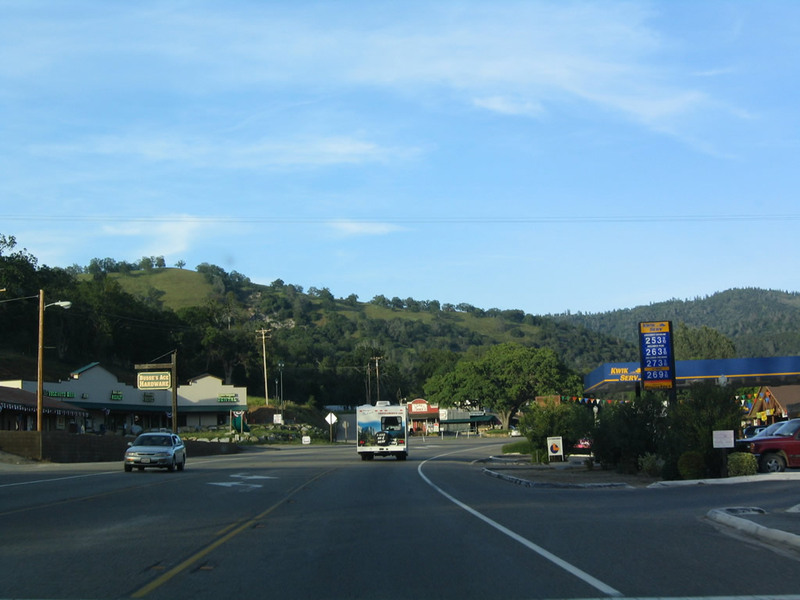 Atascadero was founded as a utopian society colony by Edward Gardner Lewis. 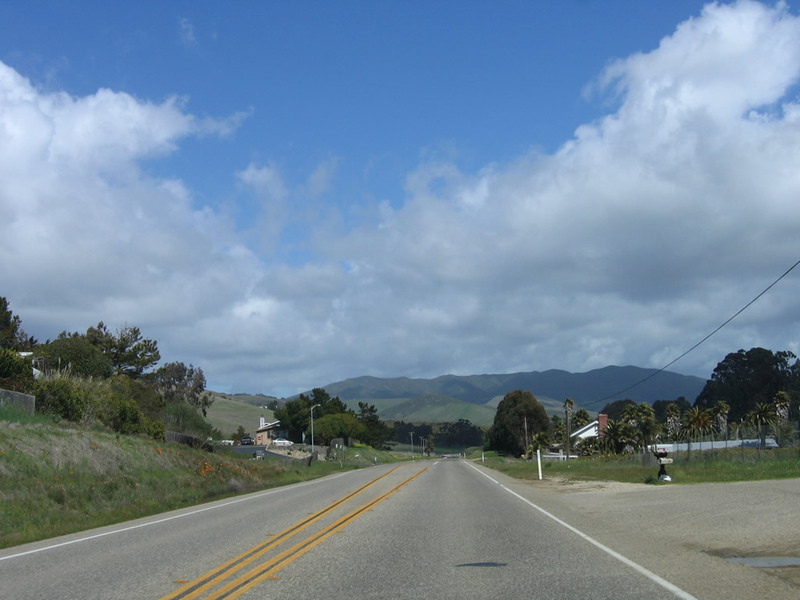 Damage to the city was sustained during the December 22, 2003, San Simeon earthquake (6.5 magnitude), which also damaged downtown Paso Robles to the north. Photo taken 03/18/06. 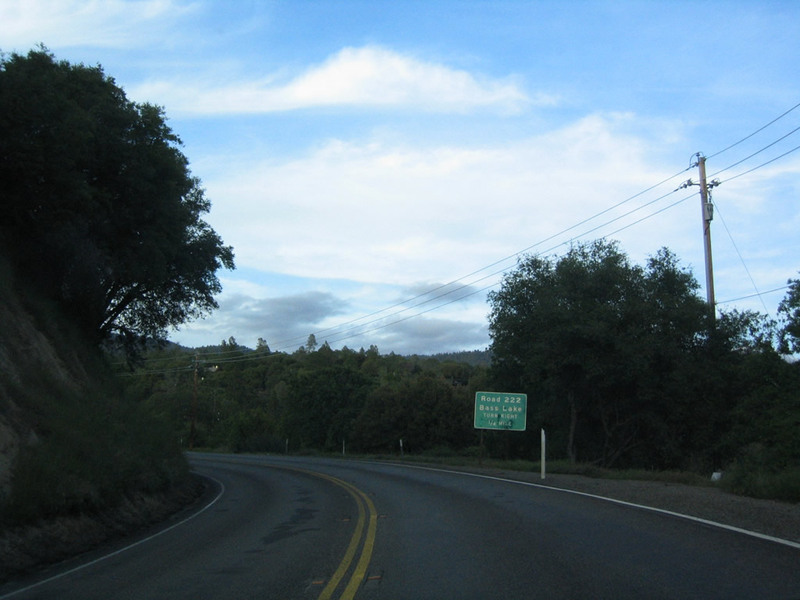 An advance guide sign is posted for Los Altos Road along eastbound California 41 (E.G. Lewis Highway). Photo taken 03/18/06. 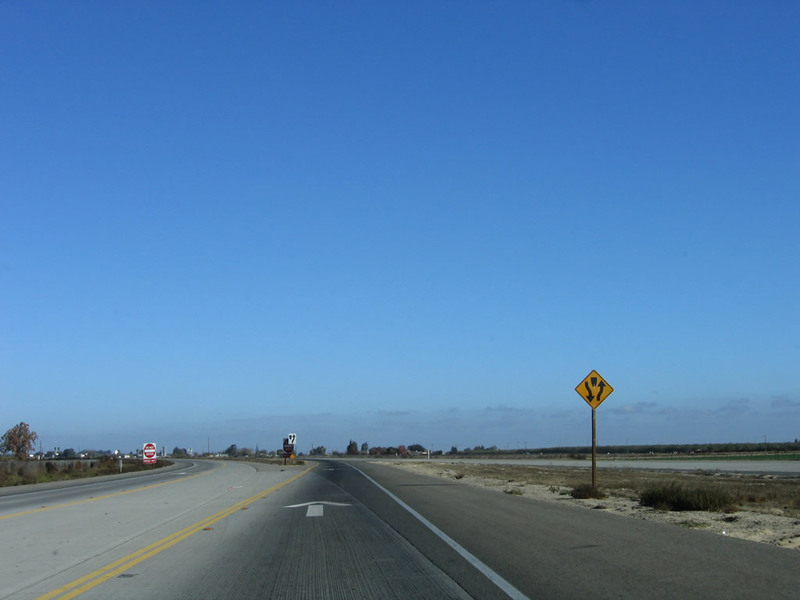 A roadside paddle (postmile marker) along eastbound California 41 (E.G. 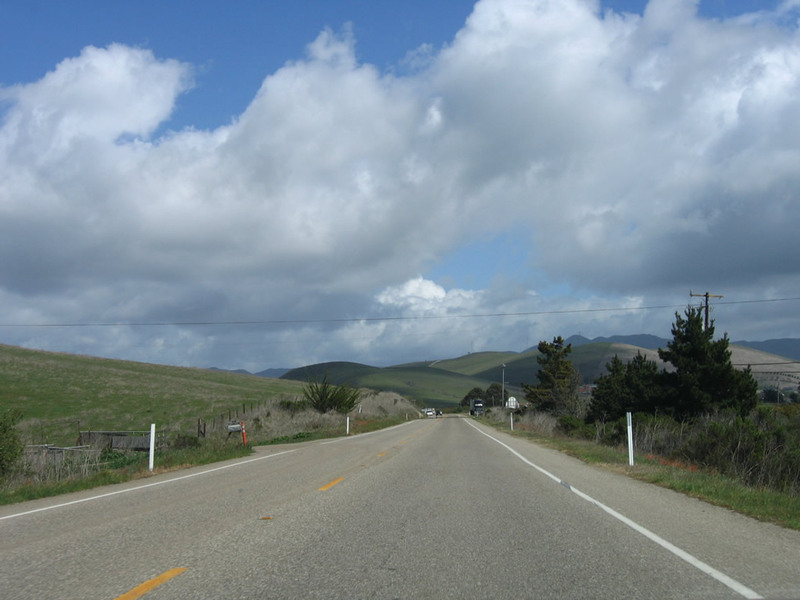 Lewis Highway) indicates the distance traveled since the route began in Morro Bay: 12 miles. Photo taken 03/18/06. California 41 (E.G. 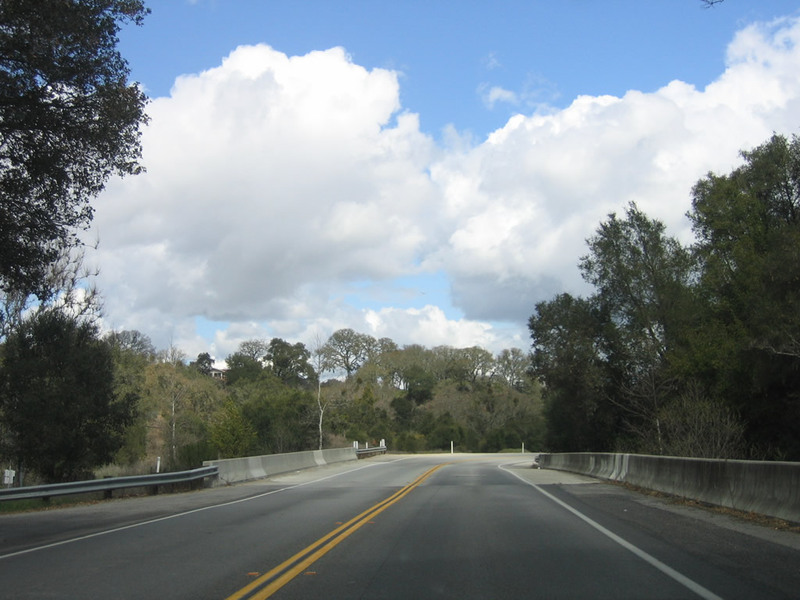 Lewis Highway) crosses over Atascadero Creek. Photo taken 03/18/06. 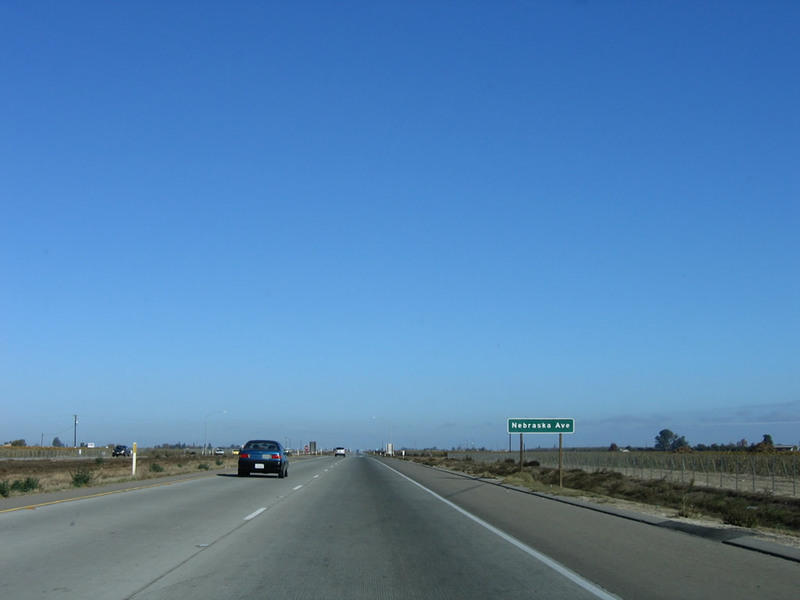 Eastbound California 41 (E.G. 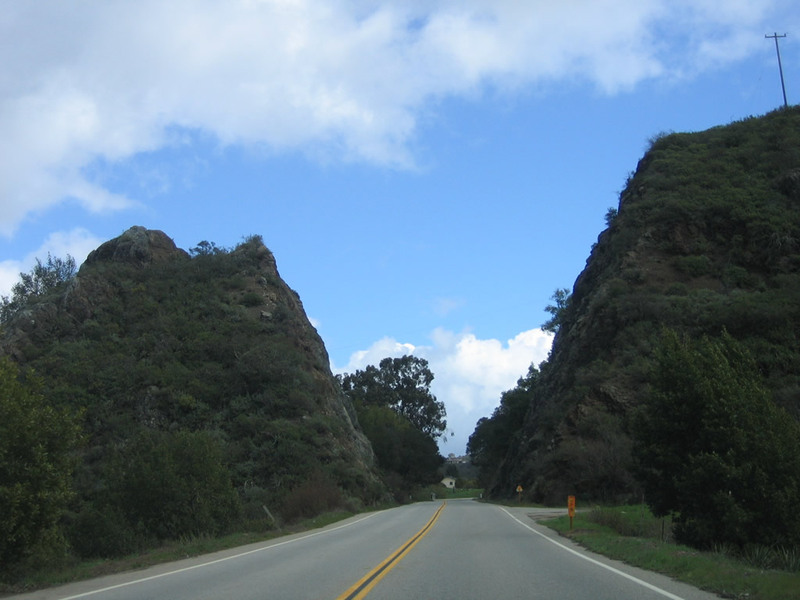 Lewis Highway) approaches San Gabriel Road. Photo taken 03/18/06. 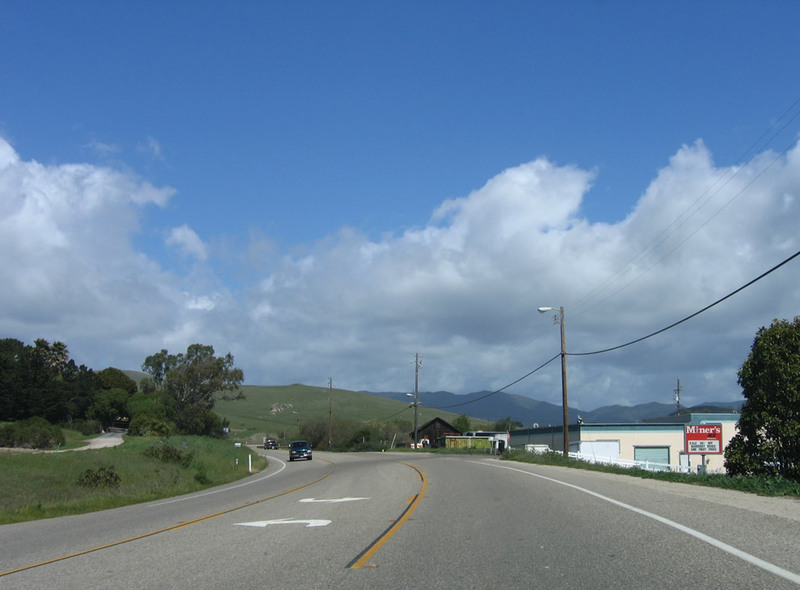 The next intersection along California 41 (E.G. 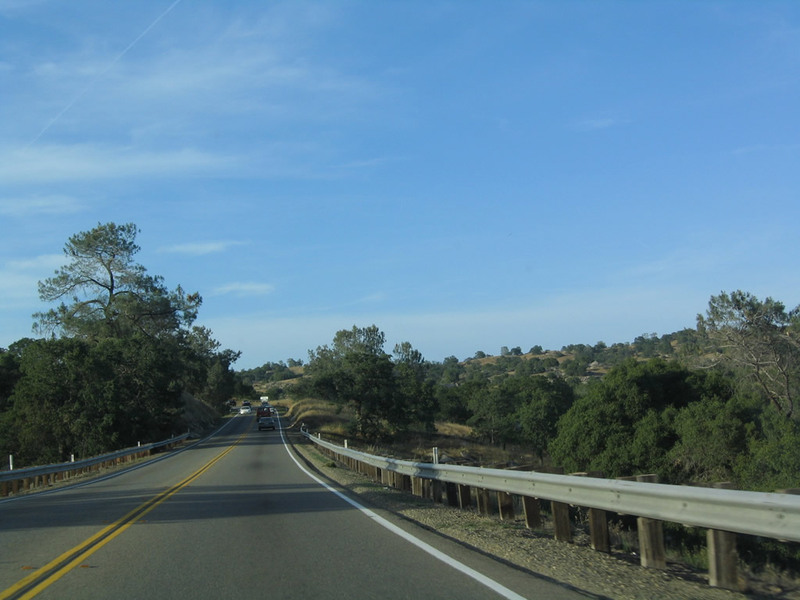 Lewis Highway) east is with Santa Rosa Avenue east to Atascadero Lake and Zoo as well as U.S. 101 Exit 218A. 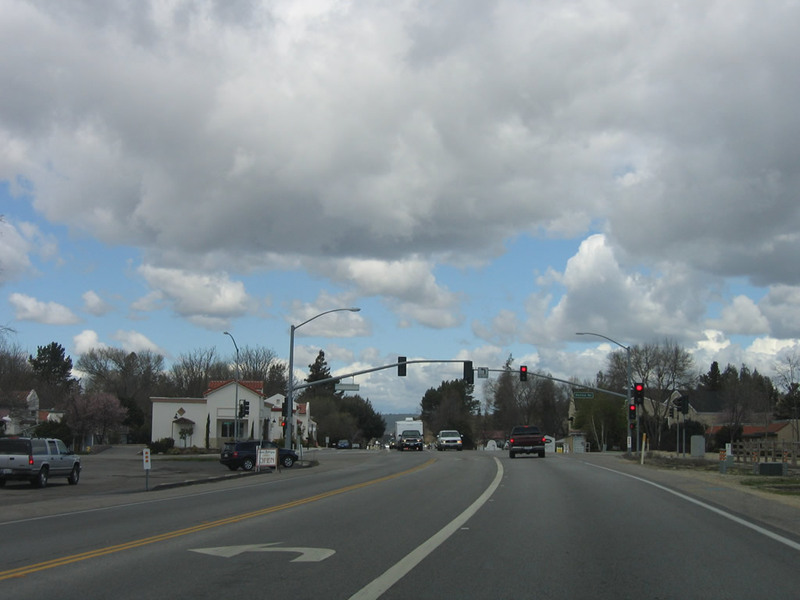 The second intersection is with Portola Road. Photo taken 03/18/06. 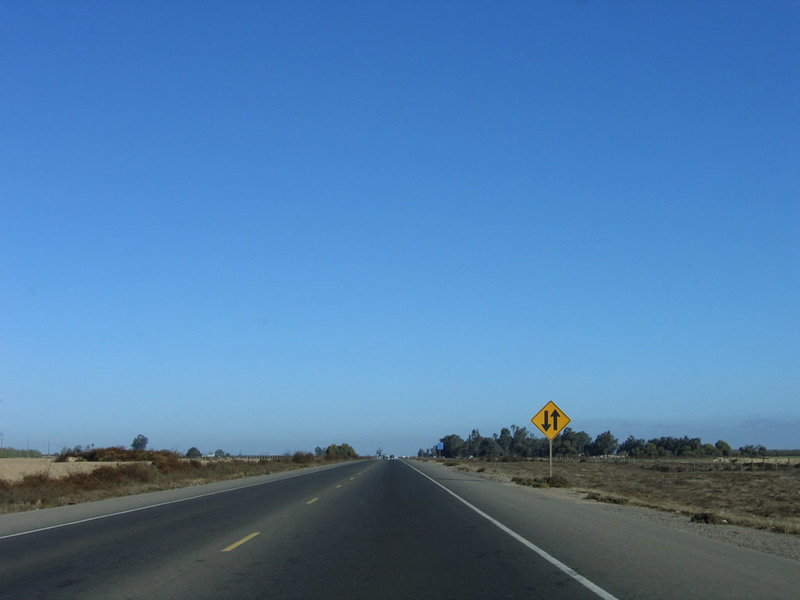 Eastbound California 41 (E.G. 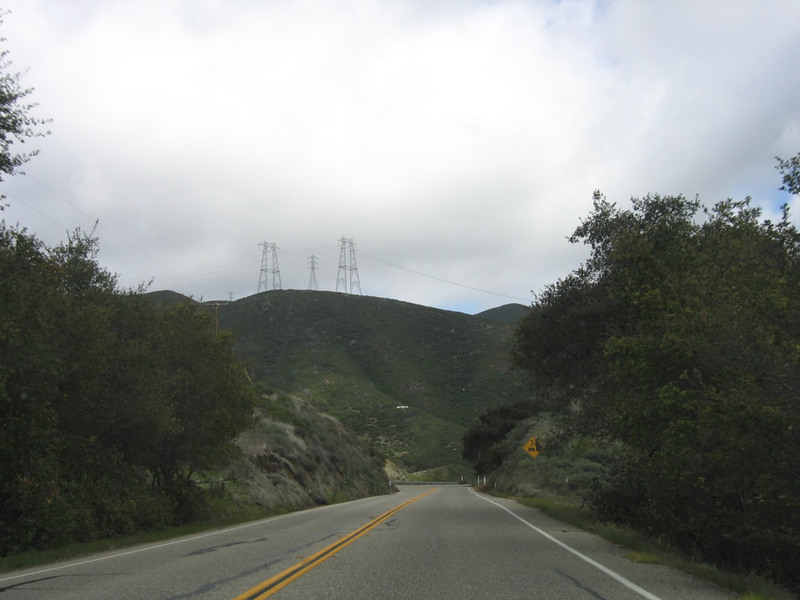 Lewis Highway) approaches Portola Road. Photo taken 03/18/06. 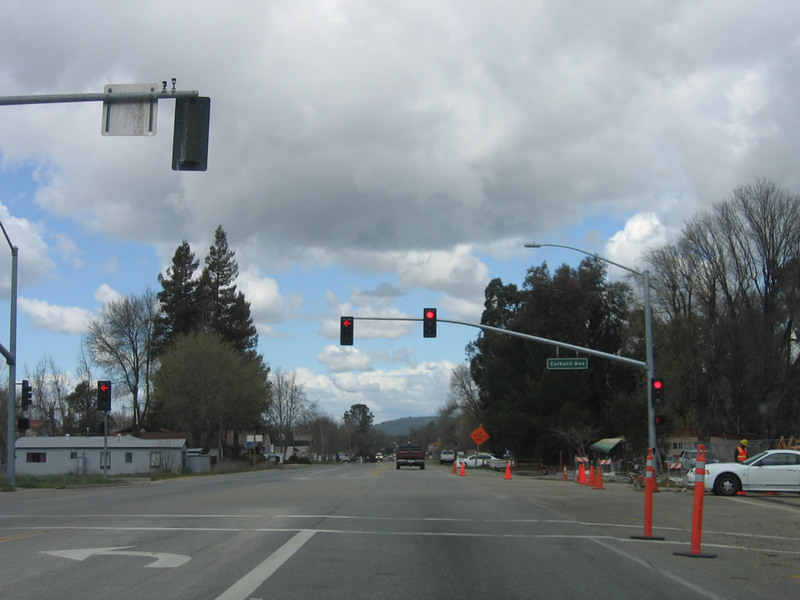 The next signalized intersection along California 41 (E.G. 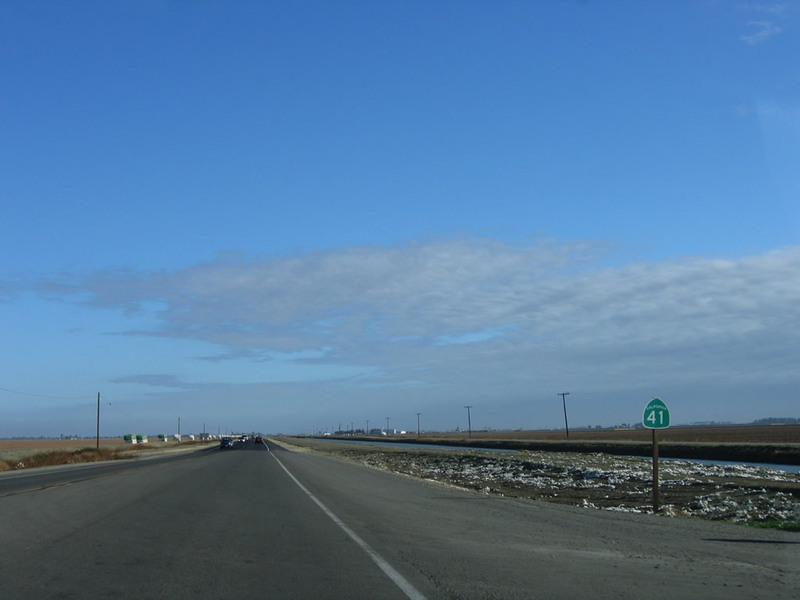 Lewis Highway) east is with Curbaril Avenue. Photo taken 03/18/06. 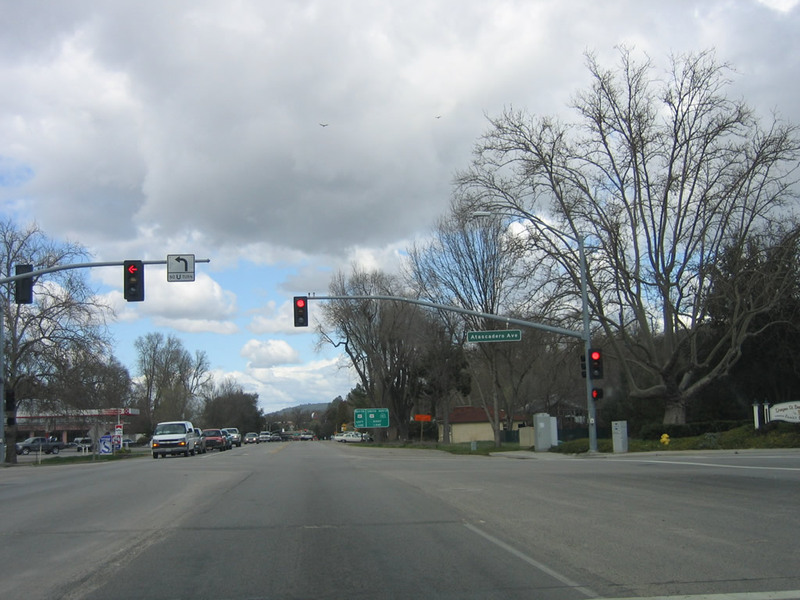 Continuing northeast, the next signalized intersection along California 41 (E.G. 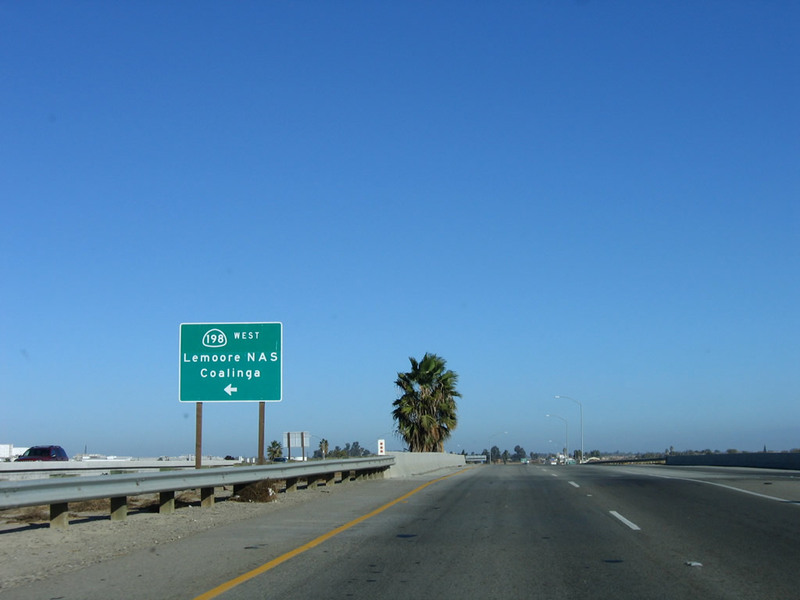 Lewis Highway) is with Atascadero Avenue. Photo taken 03/18/06. 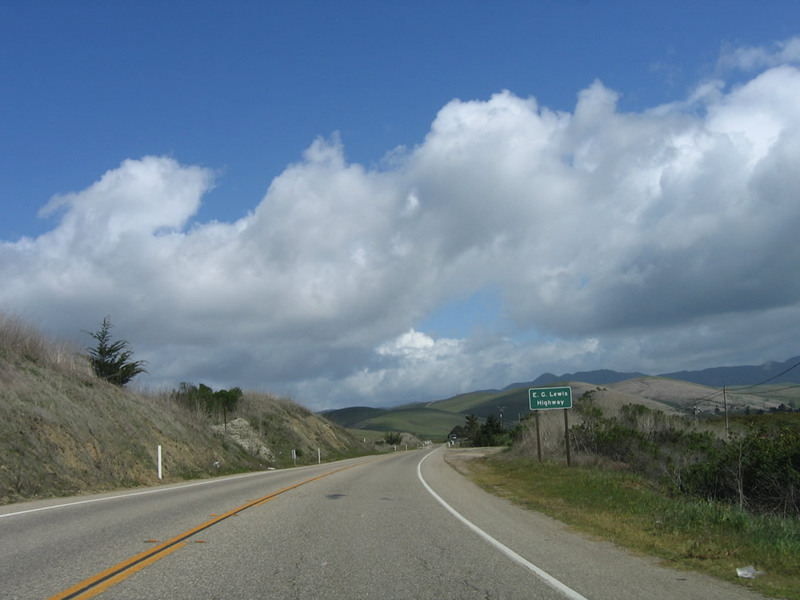 Eastbound California 41 (E.G. 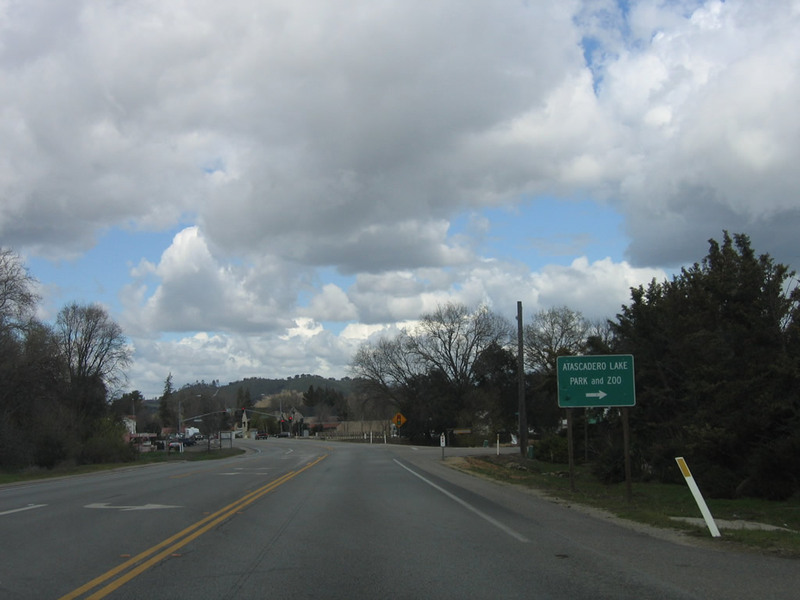 Lewis Highway) approaches U.S. 101 (El Camino Real) near downtown Atascadero. Photo taken 03/18/06. 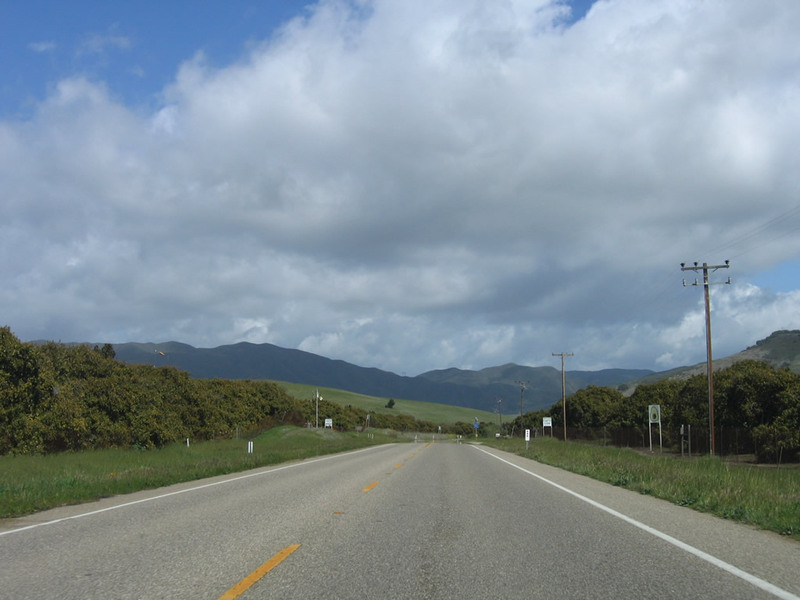 California 41 briefly becomes a multi-lane roadway here. 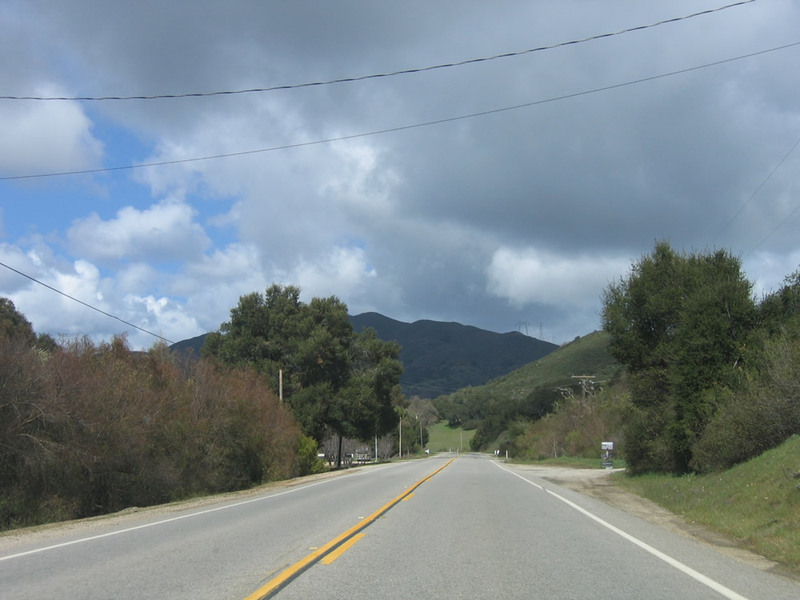 Unlike California 46, California 41 does not share any alignment with the U.S. 101 freeway, preferring instead to pass through the city center of Atascadero. 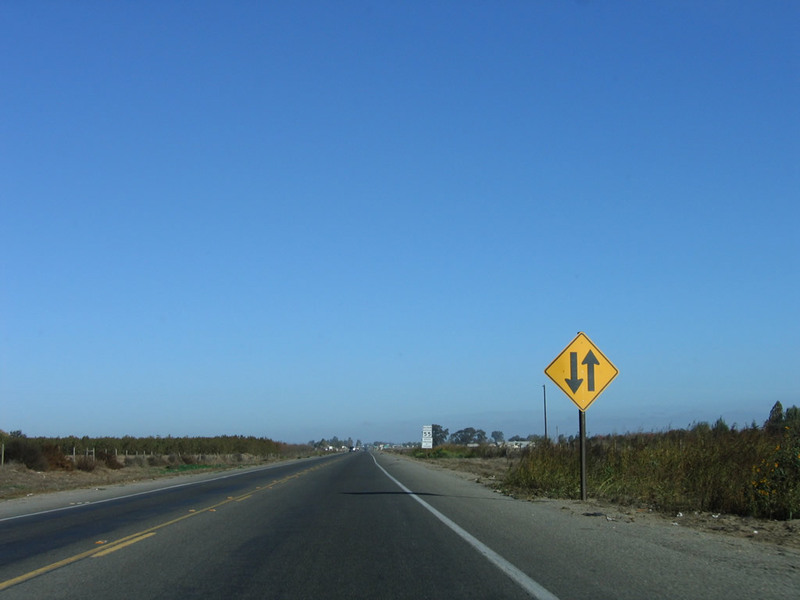 Turn right here to follow U.S. 101 south to San Luis Obispo and Los Angeles. Photo taken 03/18/06. 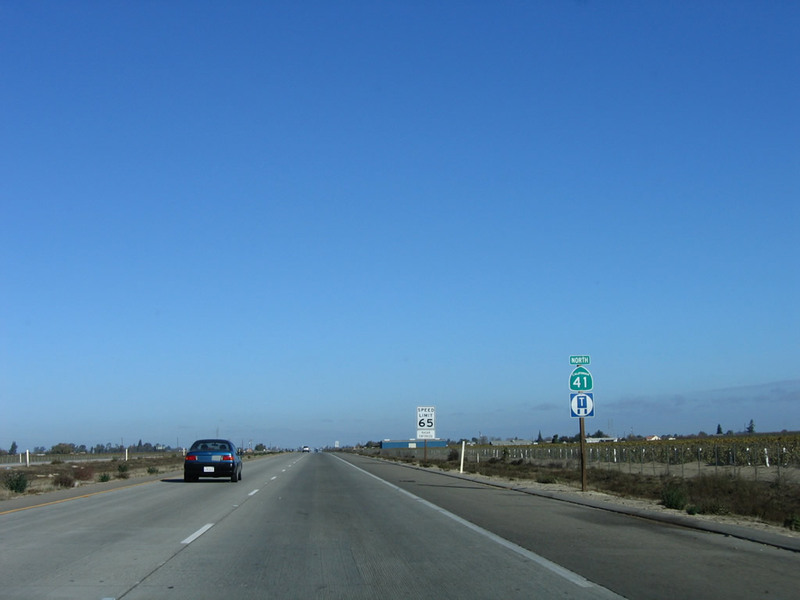 The left lane of California 41 will connect to U.S. 101 north, and the right lane of California 41 continues northeast to Shandon. Photo taken 03/18/06. 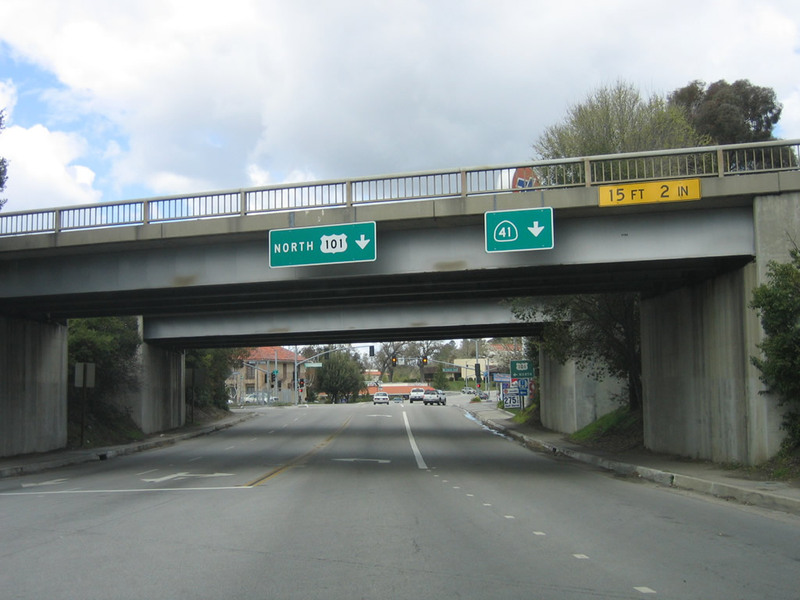 Northbound California 41 meets U.S. 101 north after passing under the freeway in Atascadero. 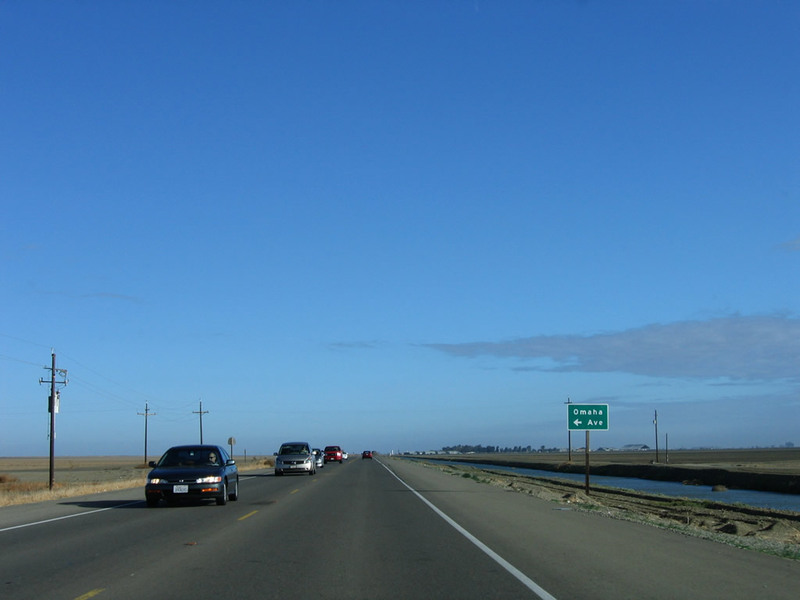 From here, California 41 north will resume a two-lane configuration until merging with California 46 in Shandon, which is northeast of here. 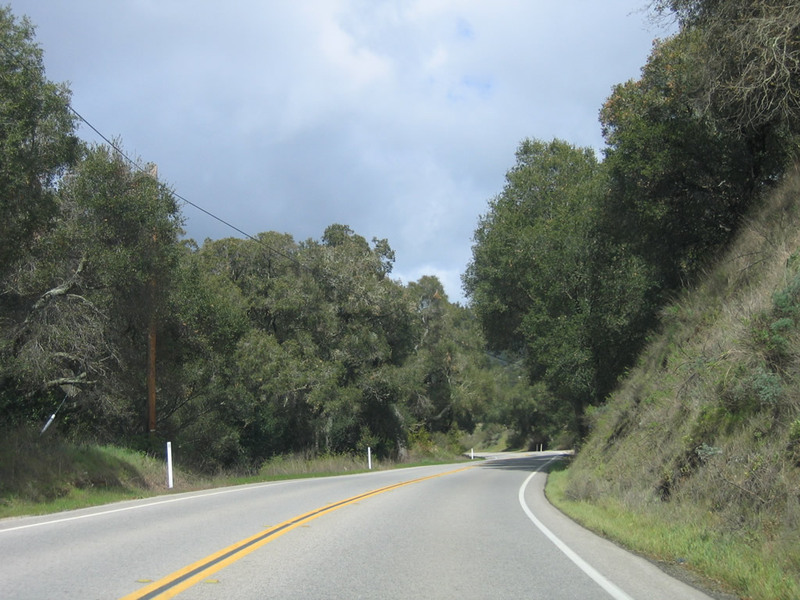 Through traffic may wish to consider using U.S. 101 north to California 46 for a bypass of the winding, slow section of California 41 between Atascadero and Shandon. Photo taken 03/18/06. 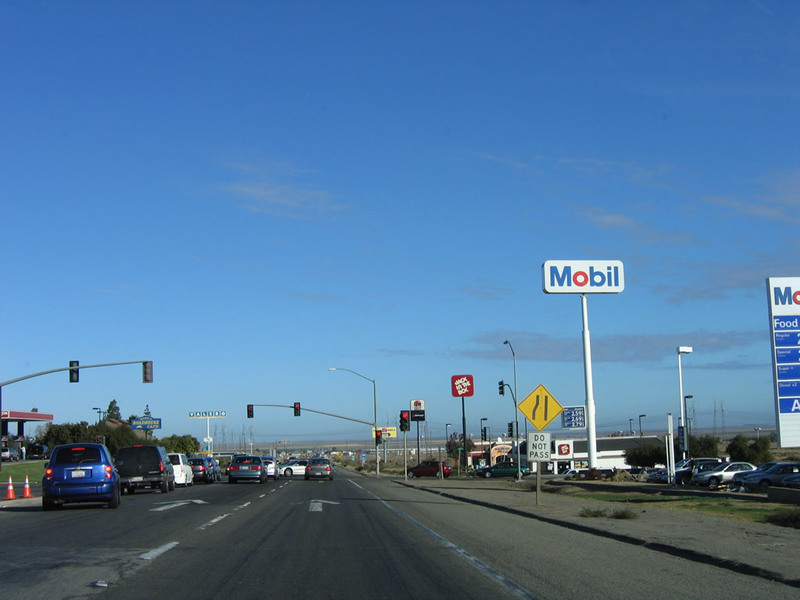 After the Interstate 5 interchange in Kings County, California 41 passes by a series of gas stations, restaurants, and motels, mostly in response to the proximity of the Interstate 5 freeway. 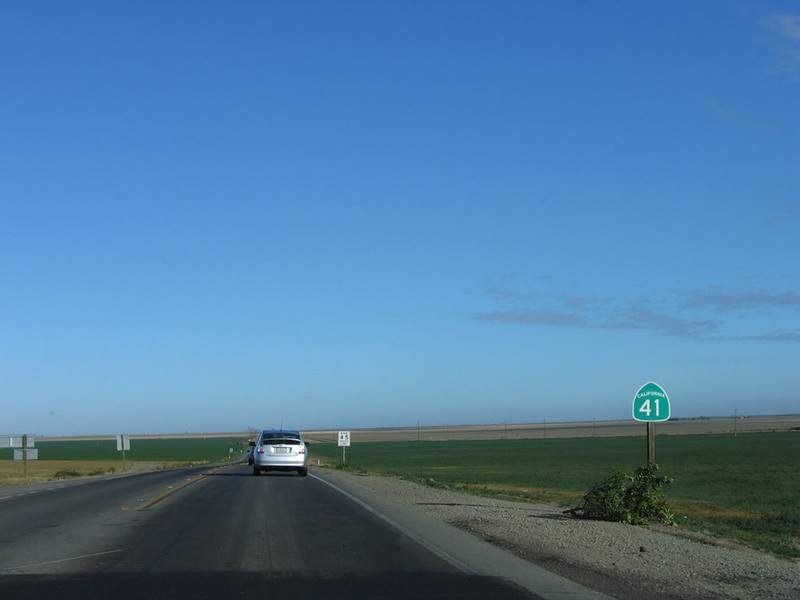 After about a mile of motorist services on both sides of the state highway, California 41 will again enter rural Central California on a diagonal alignment toward Fresno. Photo taken 11/23/06. 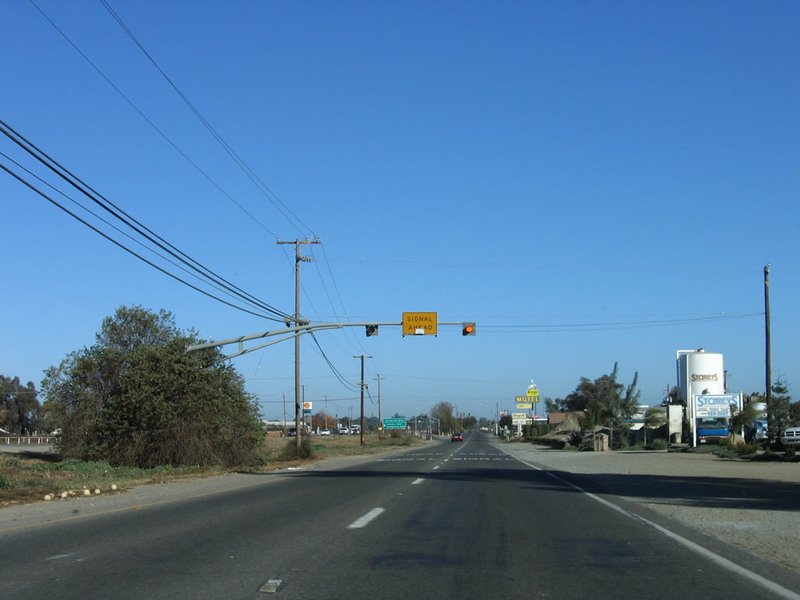 Northbound California 41 approaches Bernard Drive at the next traffic signal; this signal aids traffic flow into the gas stations and restaurants nearby. Photo taken 11/23/06. 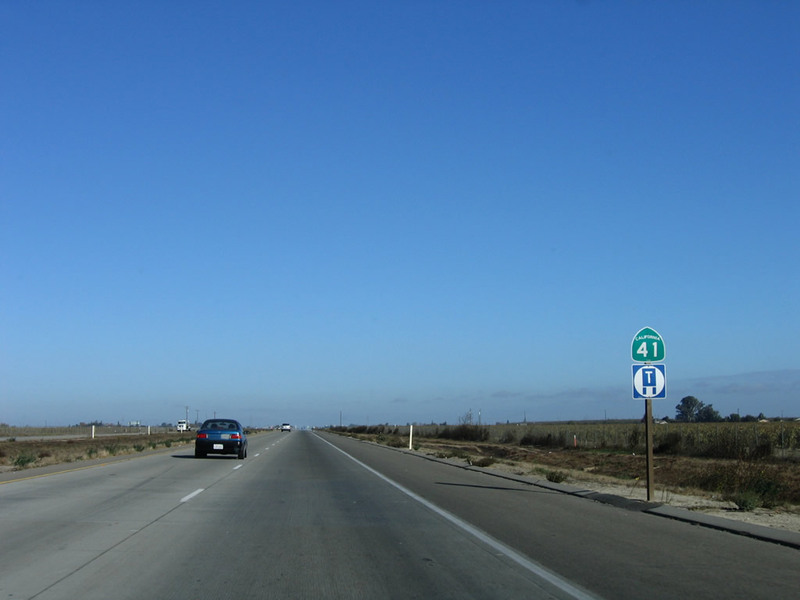 A California 41 north reassurance shield is posted thereafter, right as the highway narrows from two northbound lanes to one. Photos taken 11/23/06 and 11/24/11. 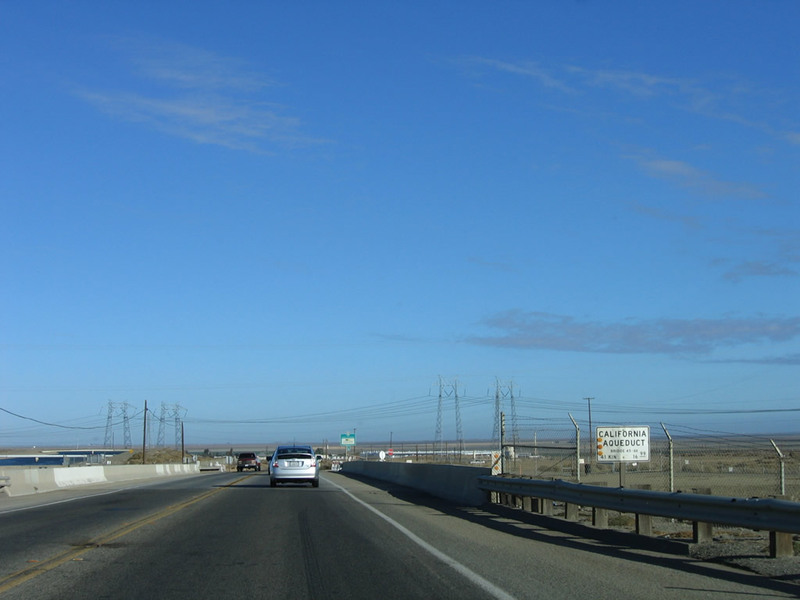 The California Aqueduct carries water from the northern part of the state south toward the arid south. Photo taken 11/23/06. 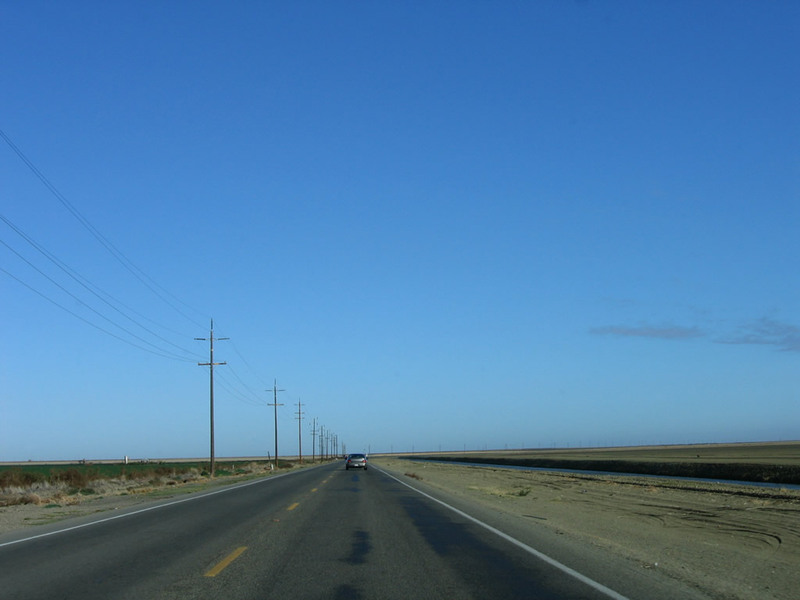 Path 15, which carries power between Southern and Northern California, parallels Interstate 5 and the California Aqueduct. 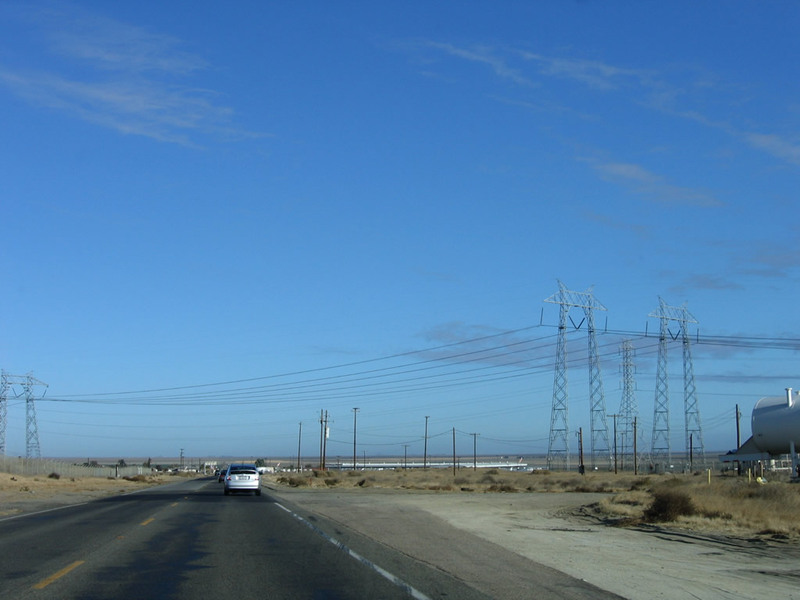 Near Kettleman City, California 41 passes under these 500kV power lines, which are owned and operated by Pacific Gas and Electric (PG&E). Photos taken 11/23/06. 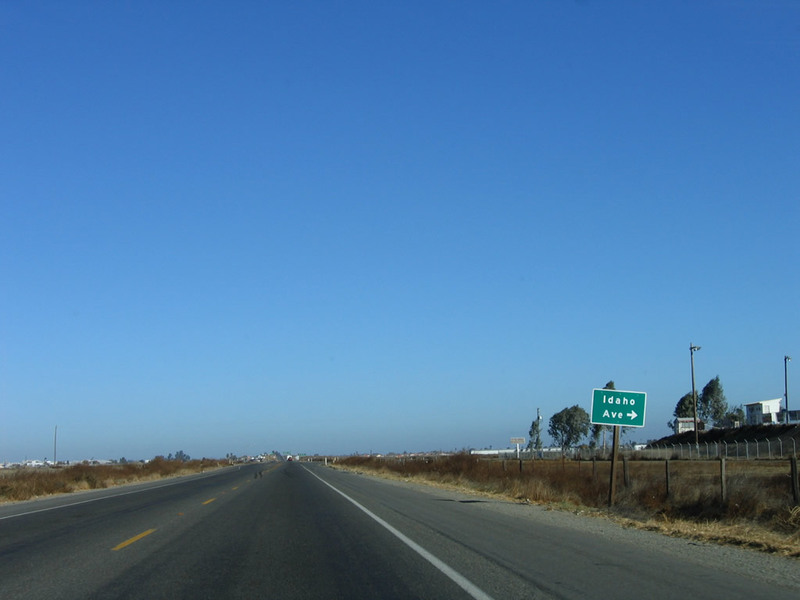 Soon thereafter, California 41 enters the unincorporated community of Kettleman City (population 1,499 as of 2000 Census, elevation 253 feet). Photo taken 11/23/06. 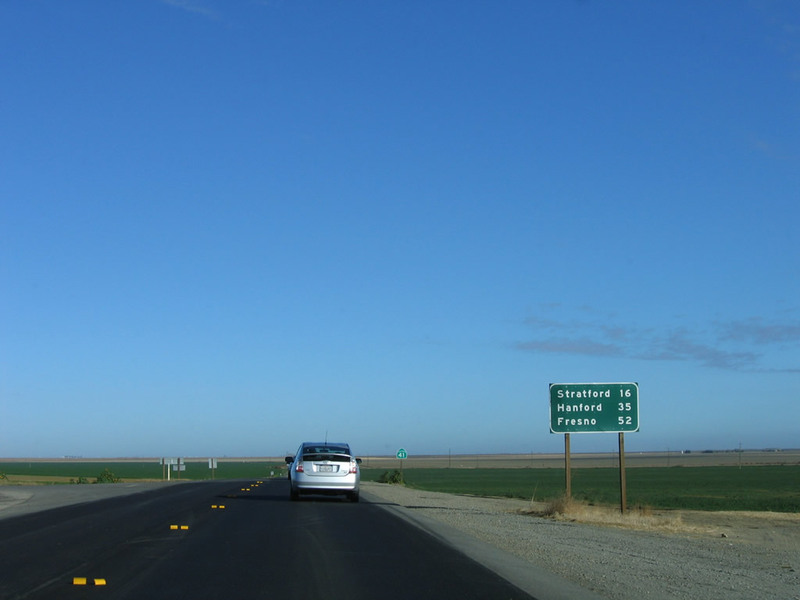 Leaving Kettleman City, this mileage sign along northbound California 41 provides the distance to Stratford (16 miles), Hanford (35 miles), and Fresno (52 miles). Photo taken 11/23/06. 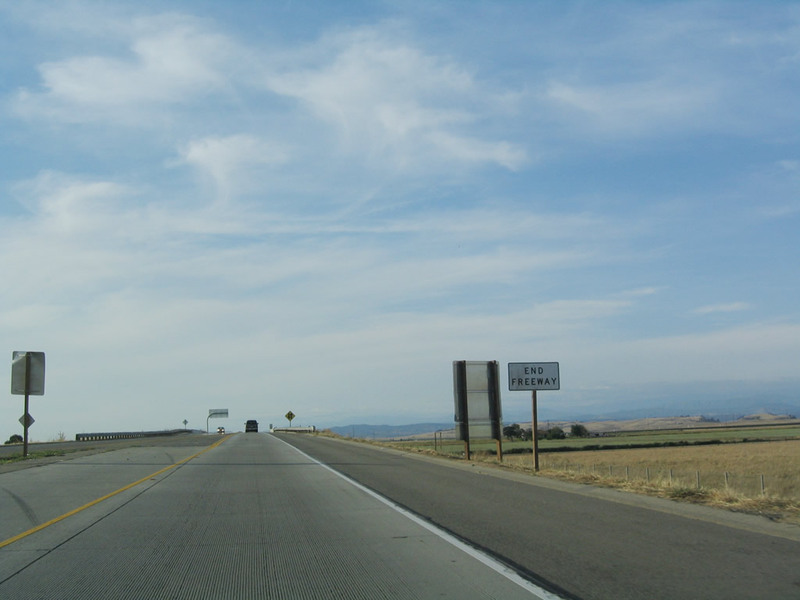 A California 41 north reassurance shield is posted thereafter. 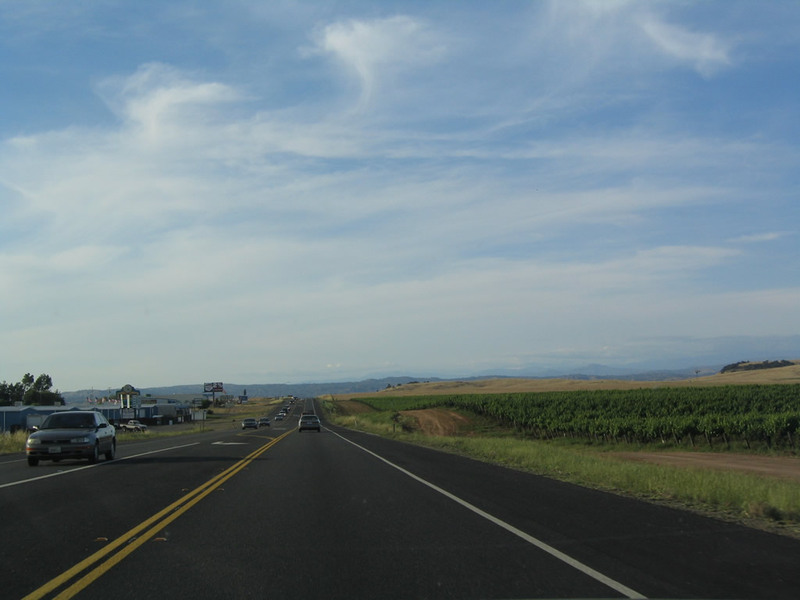 Agricultural lands (farms, ranches, and orchards are visible in all directions). Photo taken 11/23/06. 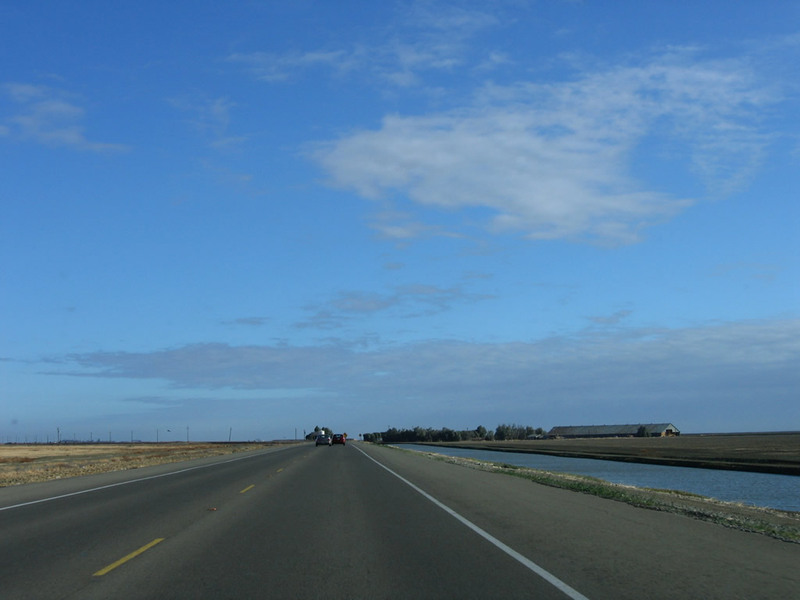 California 41 travels north of Kettleman City in a straight and flat alignment alongside a canal. Photo taken 11/23/06. 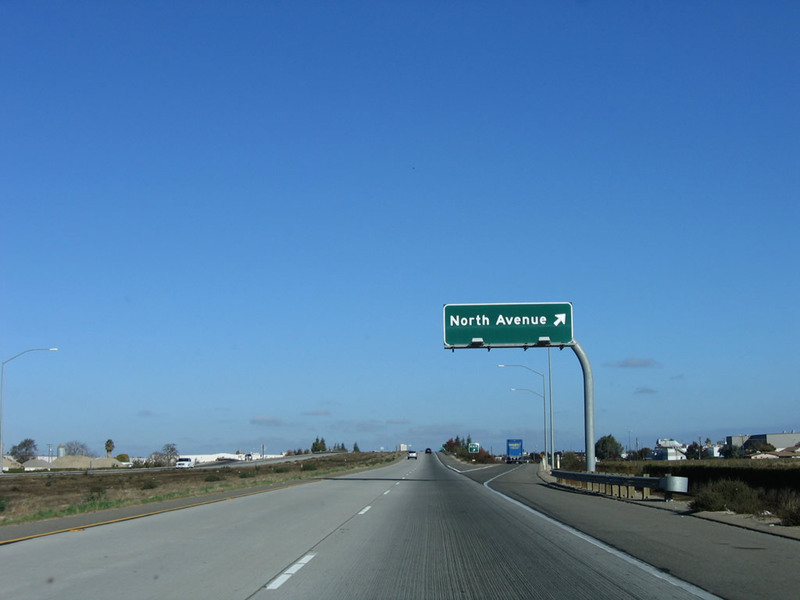 Northbound California 41 approaches Quail Avenue. Photo taken 11/23/06. 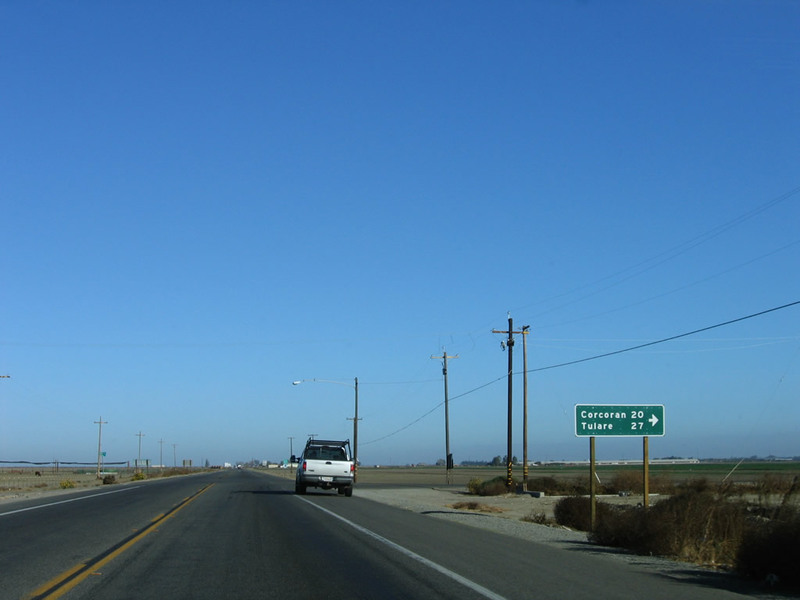 A California 41 north reassurance shield is posted after Quail Avenue. Photo taken 11/23/06. 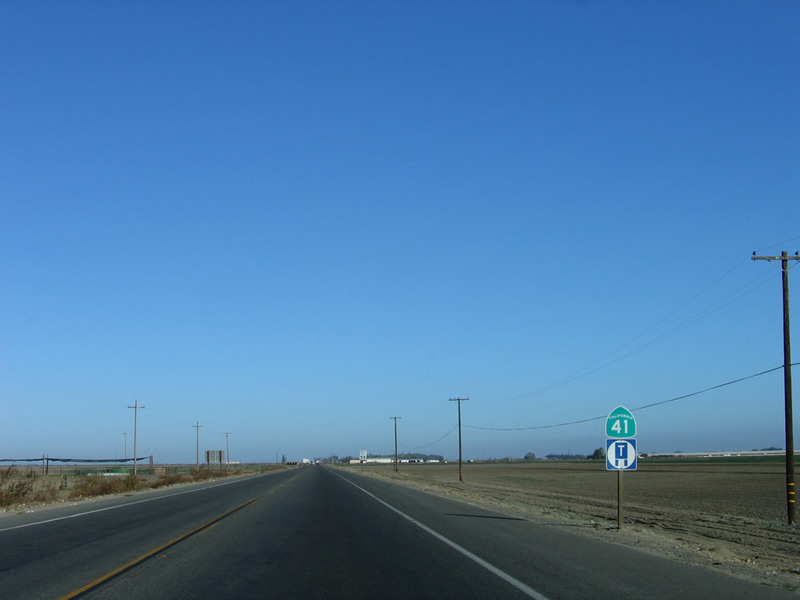 California 41 proceeds north between Kettleman City and Stratford in the heart of the Central Valley in Kings County. 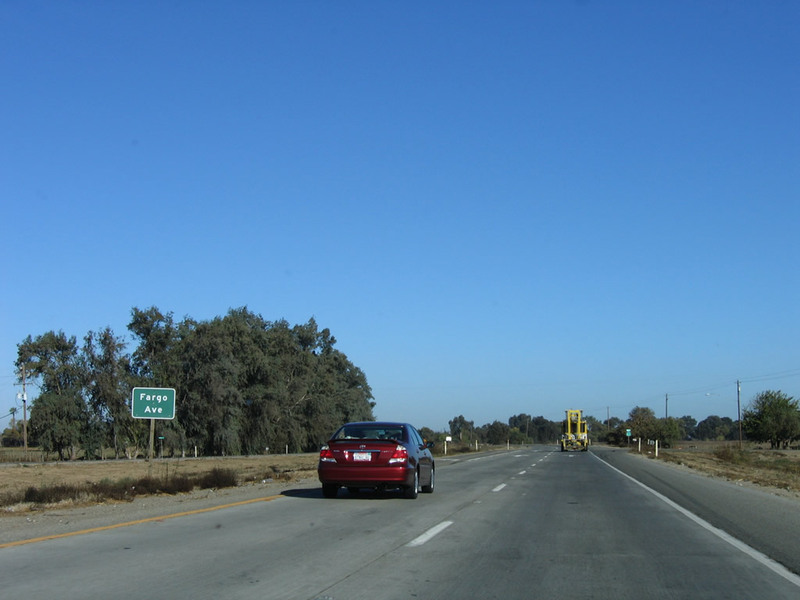 The state route carries two lanes and can be busy based on the connection it offers from Interstate 5 to Fresno. Omaha Avenue travels west to Murray. Newton Avenue travels east to Westlake Farms. Nevada Avenue, another east-west county route, was littered with cotton when this series of pictures was taken. Photos taken 11/23/06. 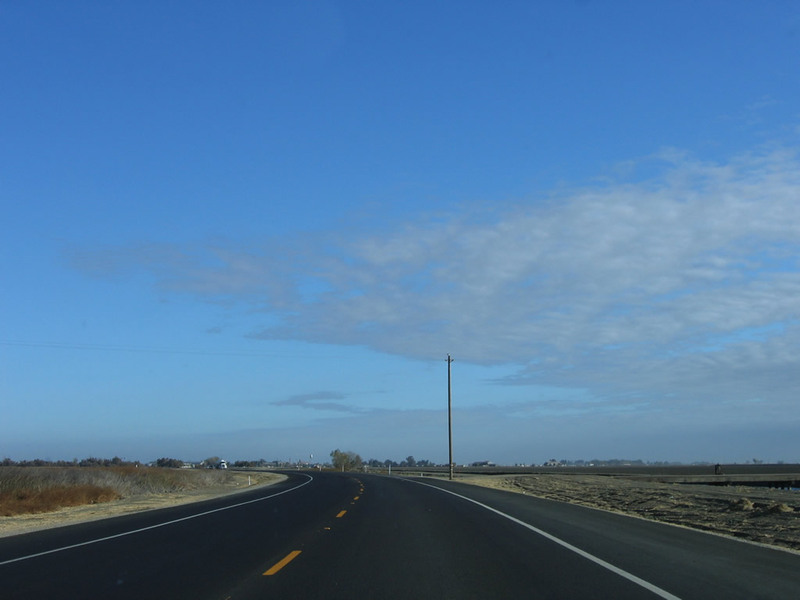 Continuing north, California 41 sees more agriculture along its northeasterly path. 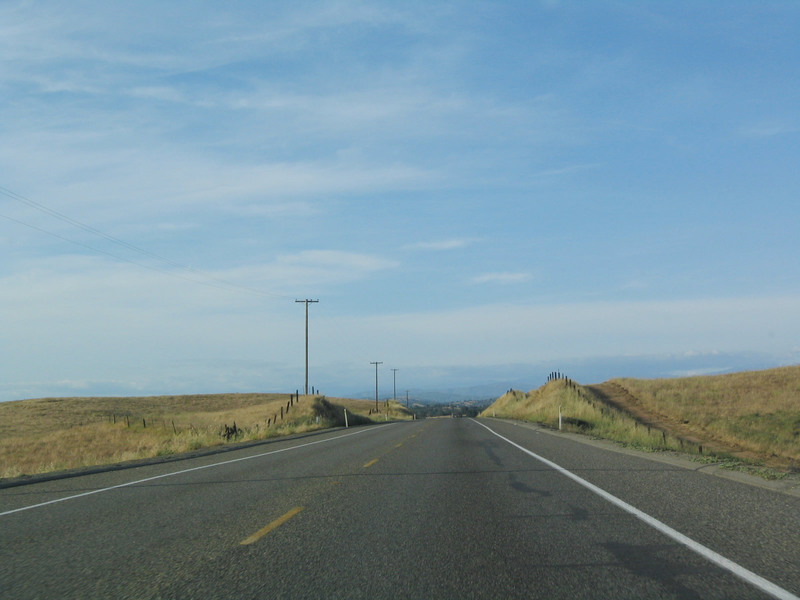 Twenty-Second Avenue is a north-south county route that provides local and farm access. Photos taken 11/23/06. 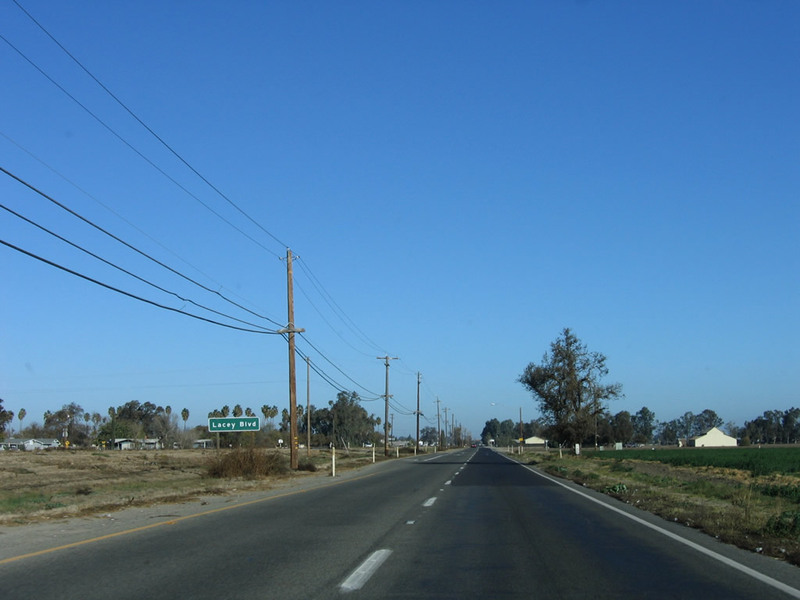 The turnoff from California 41 north to Laurel Avenue east leads into the unincorporated community of Stratford (population 1,264 as of the 2000 Census, elevation 203 feet). 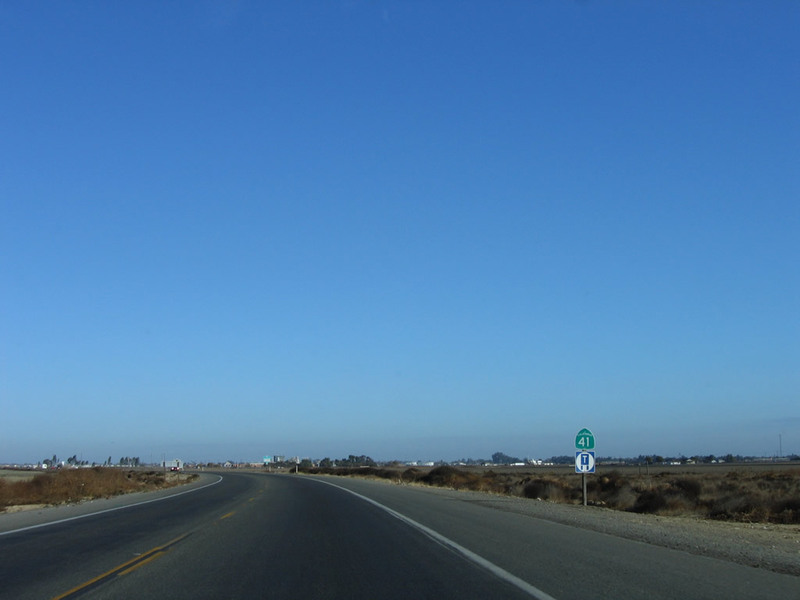 California 41 skirts west of the community. Photos taken 11/23/06. 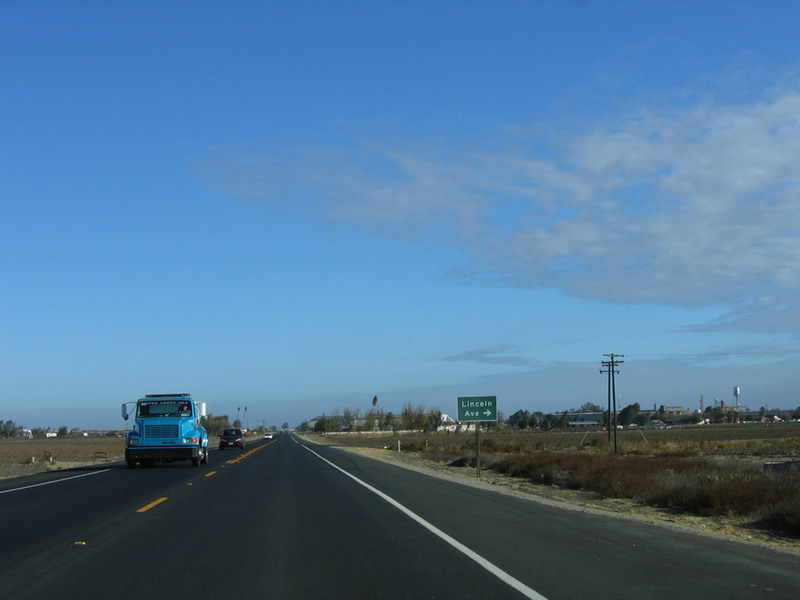 Northbound California 41 approaches Kansas Avenue, a county route that leads east to Guernsey, Corcoran (20 miles), and Tulare (27 miles). Photos taken 11/23/06. 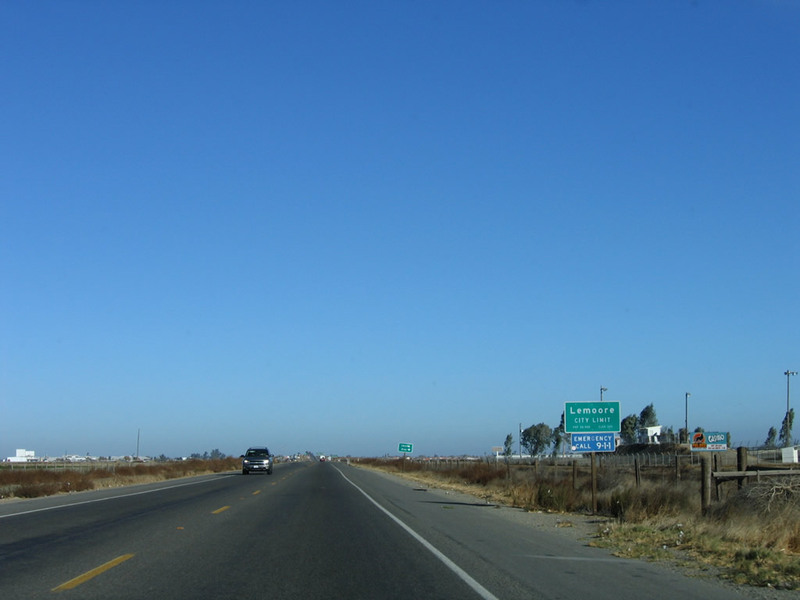 California 41 next approaches Kent Avenue and Jersey Avenue before approaching the city of Lemoore. Photos taken 11/23/06. 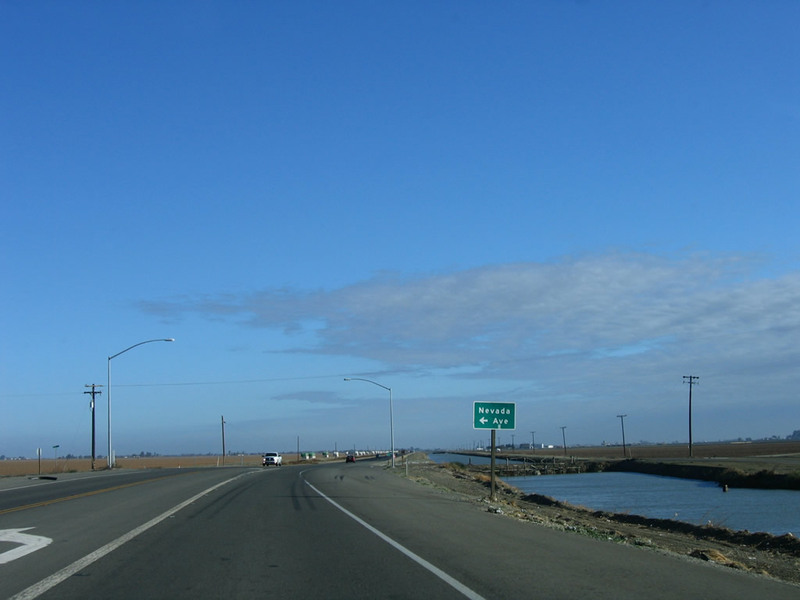 Northbound California 41 enters the city of Lemoore in the Central Valley. 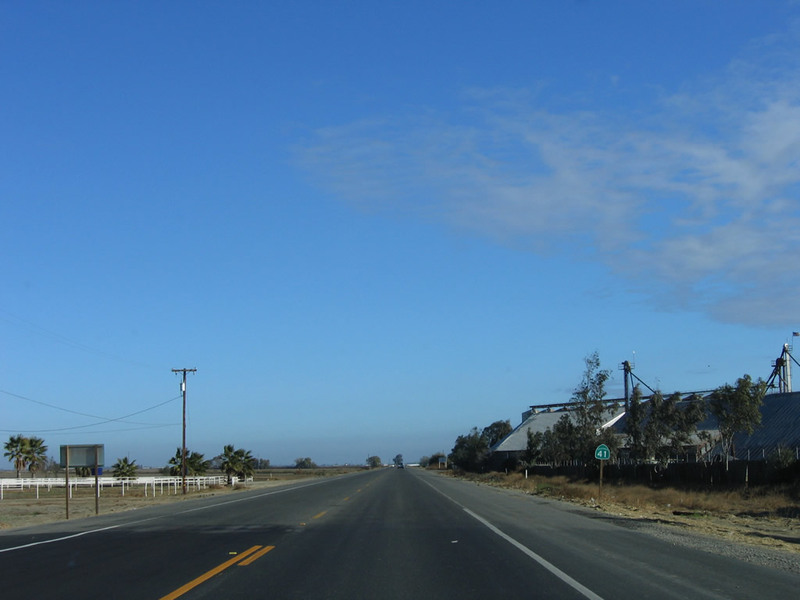 Lemoore had a population of 19,712 as of the 2000 Census and sits at an elevation of 230 feet. 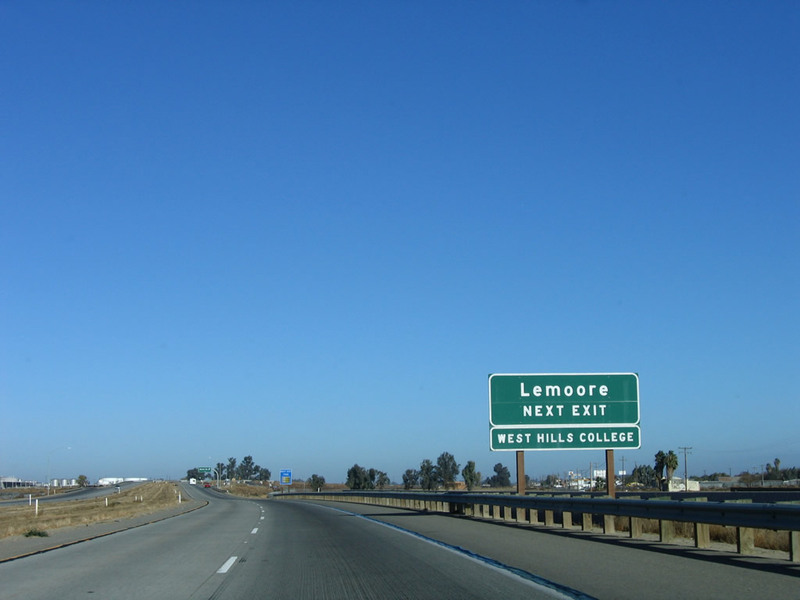 Incorporated on July 11, 1900, Lemoore was named after Dr. Lovern Lee Moore, who founded the community in 1871. 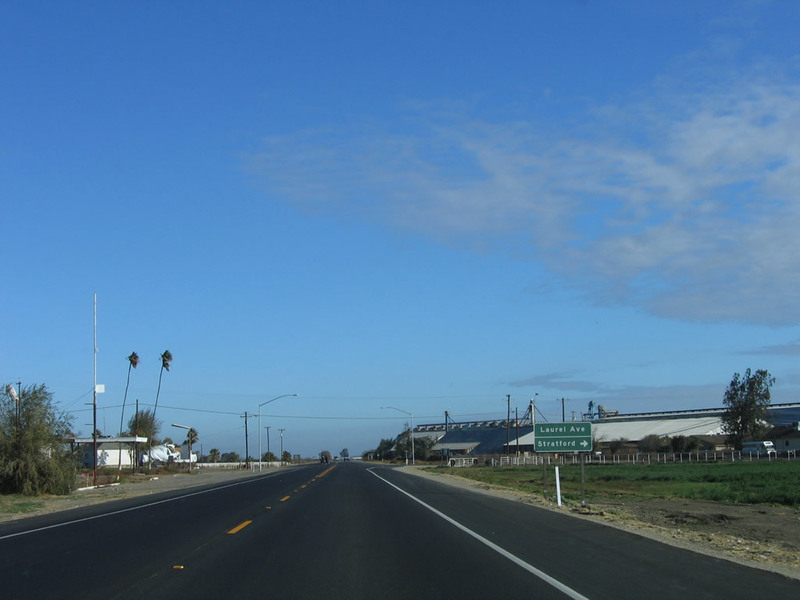 Lemoore Naval Air Station (Reeves Field) is located west of town via Jackson Avenue or California 198 west. Photos taken 11/23/06. 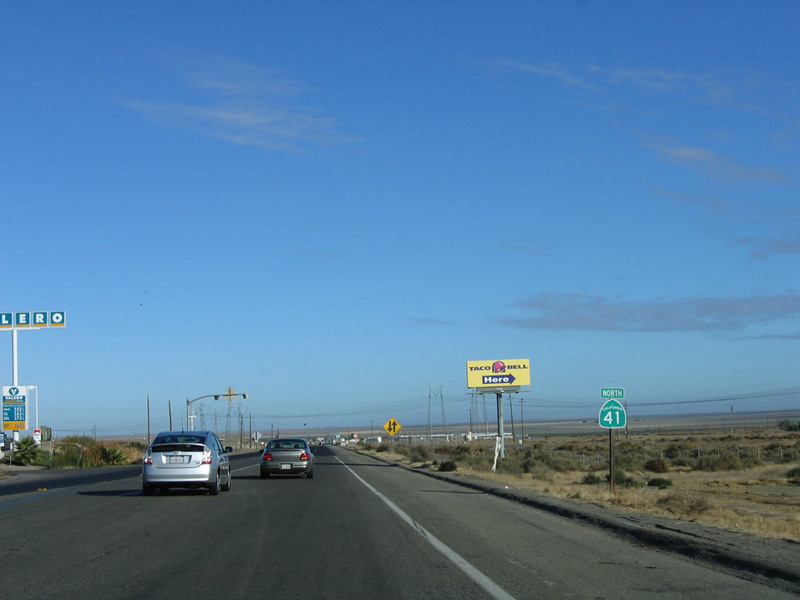 After the Idaho Avenue intersection, northbound California 41 becomes a four-lane expressway and interchanges with the California 198 freeway. California 198 travels west to Coalinga and U.S. 101 or east to Visalia and Kings Canyon-Sequoia National Parks. 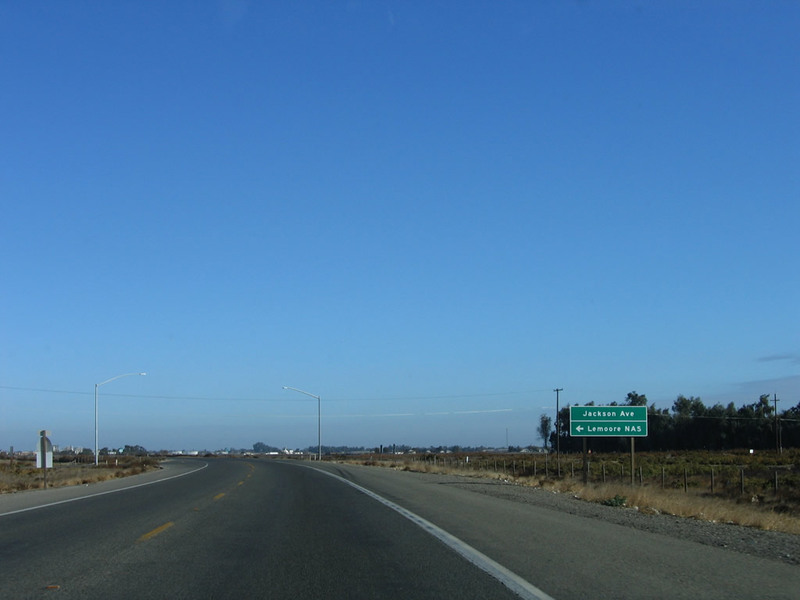 It uses a freeway to bypass downtown Lemoore. Photos taken 11/23/06. 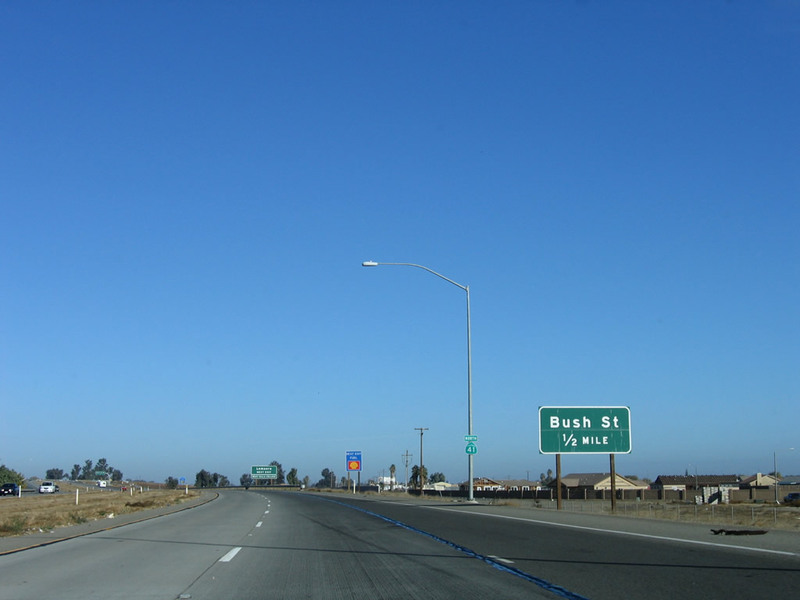 California 41 has another interchange on its expressway around Lemoore: The next exit along northbound California 41 is with Bush Street. 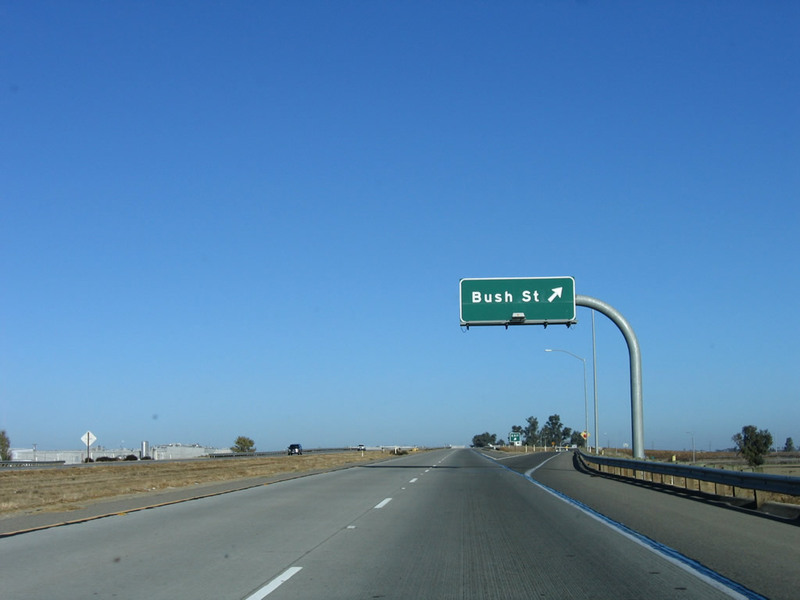 No exit number is assigned yet since the junction with Bush Street is one of the only freeway interchanges on California 41 in Kings County. Photos taken 11/23/06. 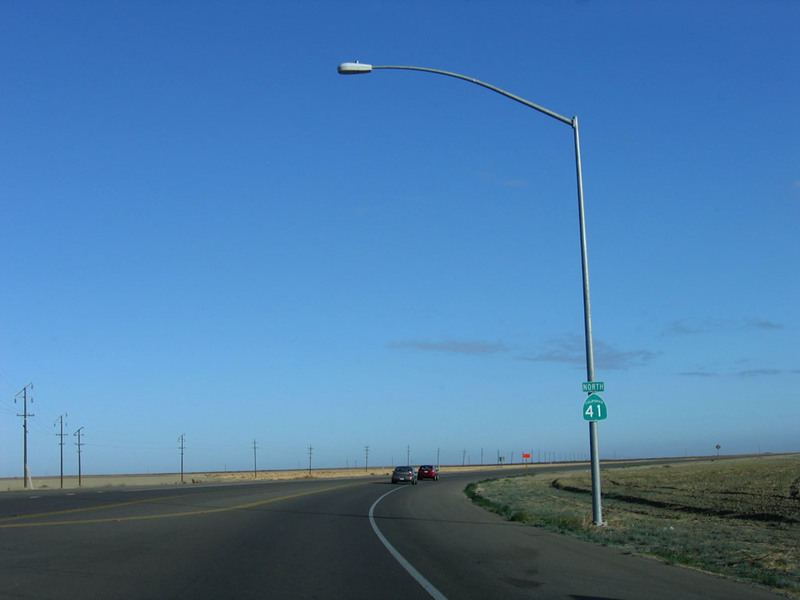 The next intersection along California 41 north is with Hanford Armona Road. Photos taken 11/23/06. 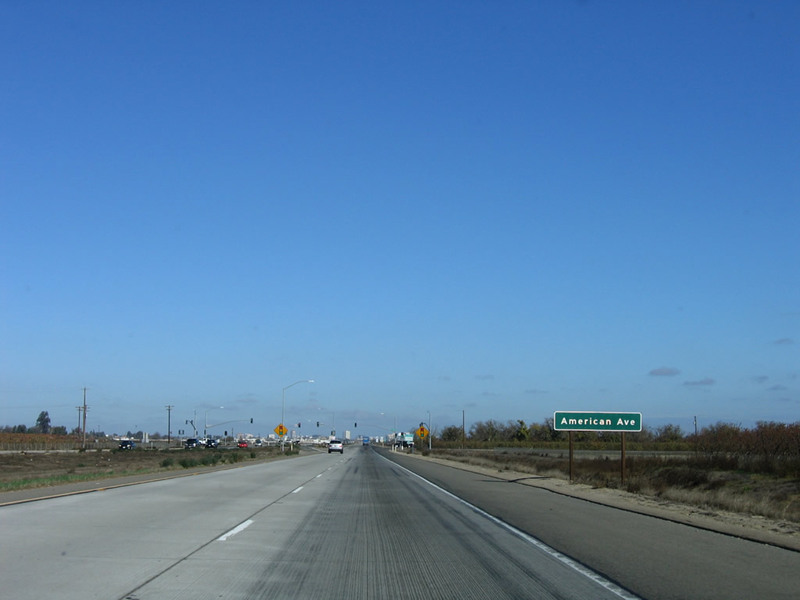 California 41 north approaches Glendale Avenue and Lacey Boulevard north of Lemoore. Photos taken 11/23/06. 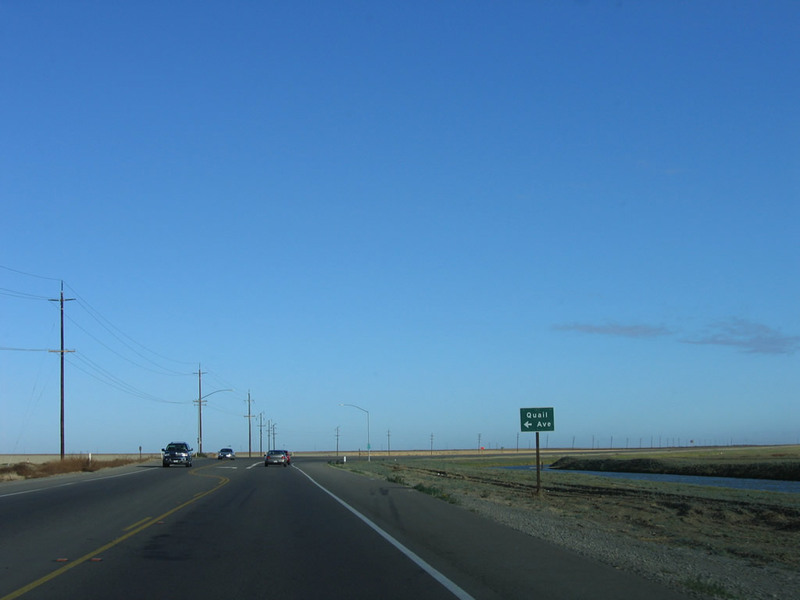 Continuing north, California 41 next approaches a traffic signal with Grangeville Boulevard west to Lemoore Naval Air Station (Reeves Field) and east to Hanford. 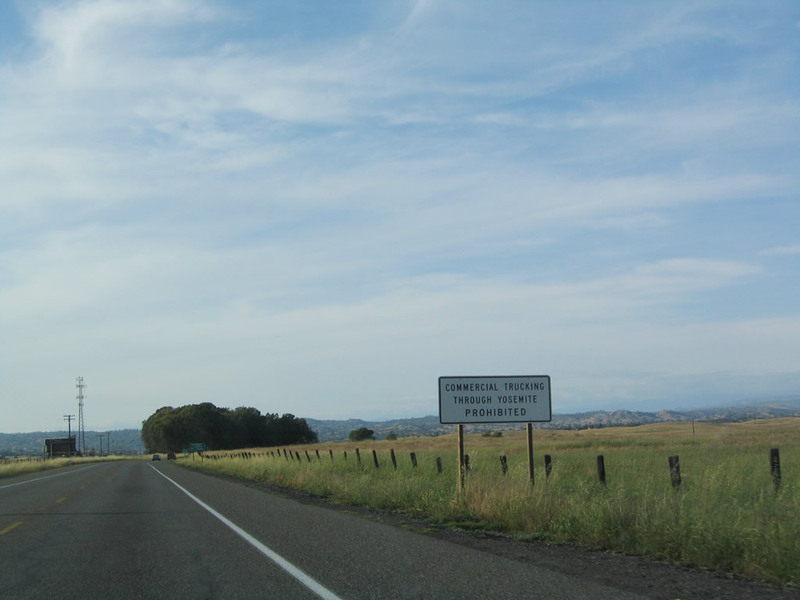 The state route continues with an expressway alignment (divided with two lanes in each direction). Photos taken 11/23/06. California 41 approaches Fargo Avenue, Fremont Avenue, Flint Avenue, and Elgin Avenue next. Photos taken 11/23/06. 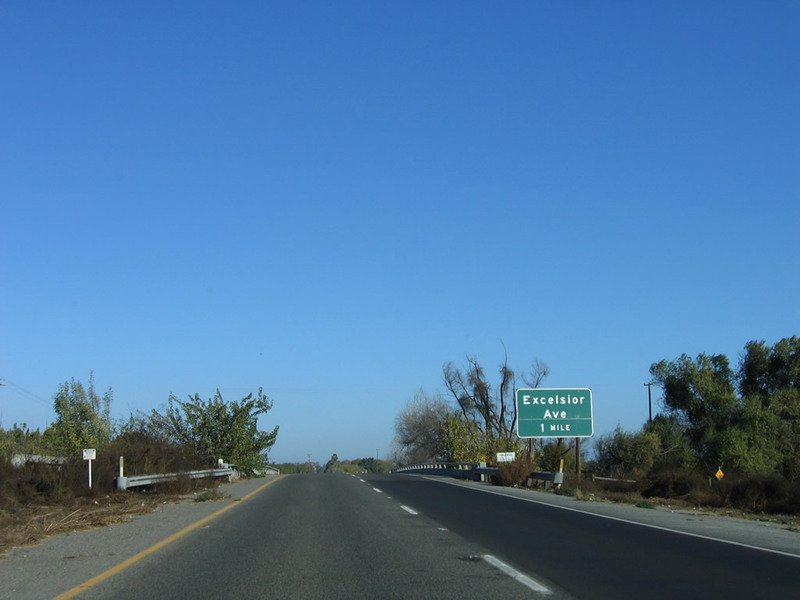 Northbound California 41 sees another interchange with Excelsior Avenue, which also signifies the boundary between Kings County and Fresno County. Photos taken 11/23/06. 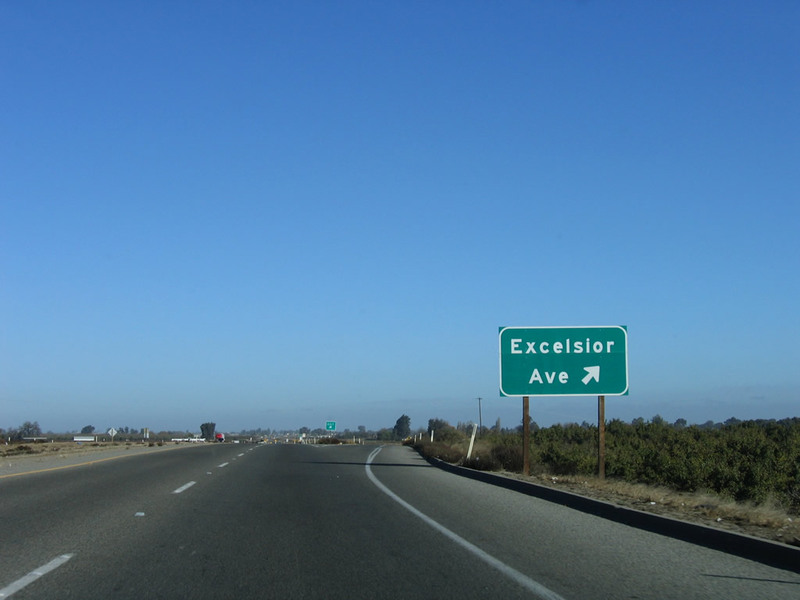 Almost immediately after the Excelsior Avenue interchange, California 41 downgrades from a four-lane expressway to a two-lane conventional highway. 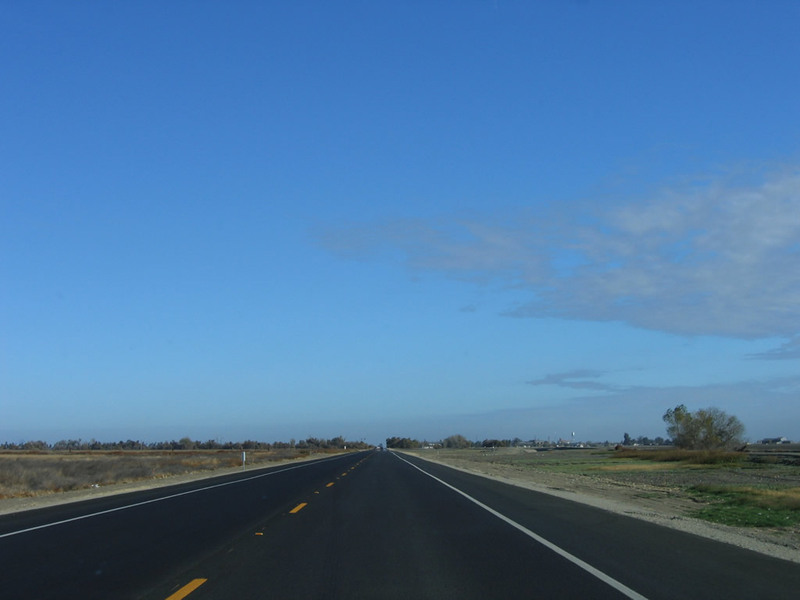 Plans call for the eventual conversion of all of California 41 to four-lane status from Lemoore to Fresno in both Kings and Fresno Counties. Photos taken 11/23/06. 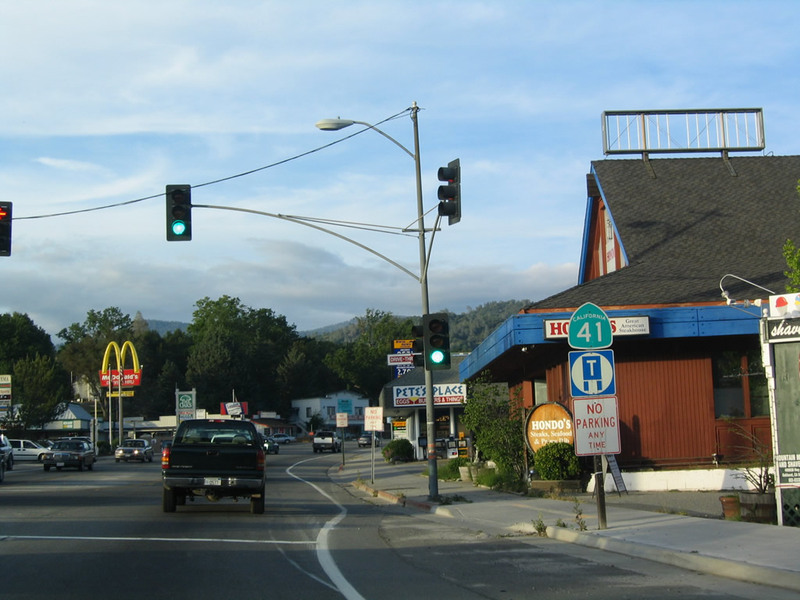 The next several major intersections along California 41 north are: Laguna Avenue, Mt. Whitney Avenue, and Harlan Avenue. Photos taken 11/23/06. 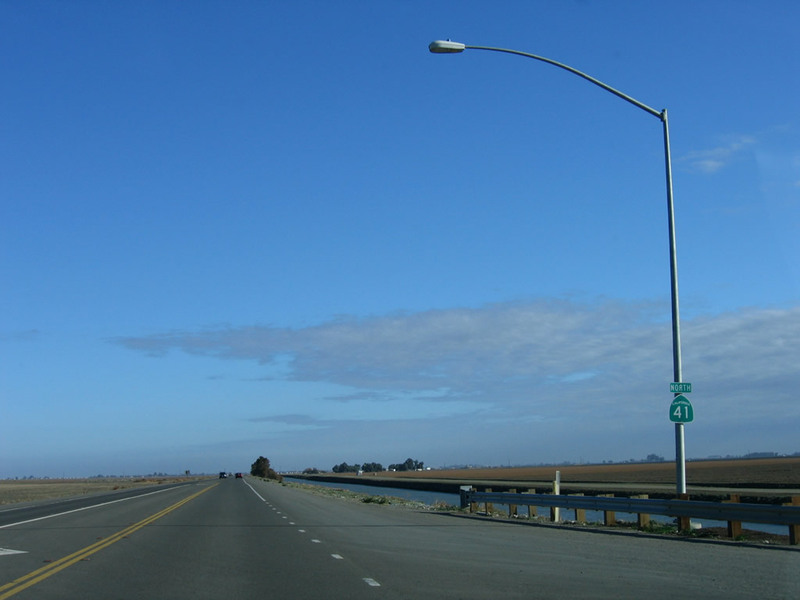 California 41 passes Elkhorn Avenue and regains its four-lane, divided highway (expressway) status. To continue north on the old alignment of California 41, follow Elkhorn Avenue west to Elm Avenue north. 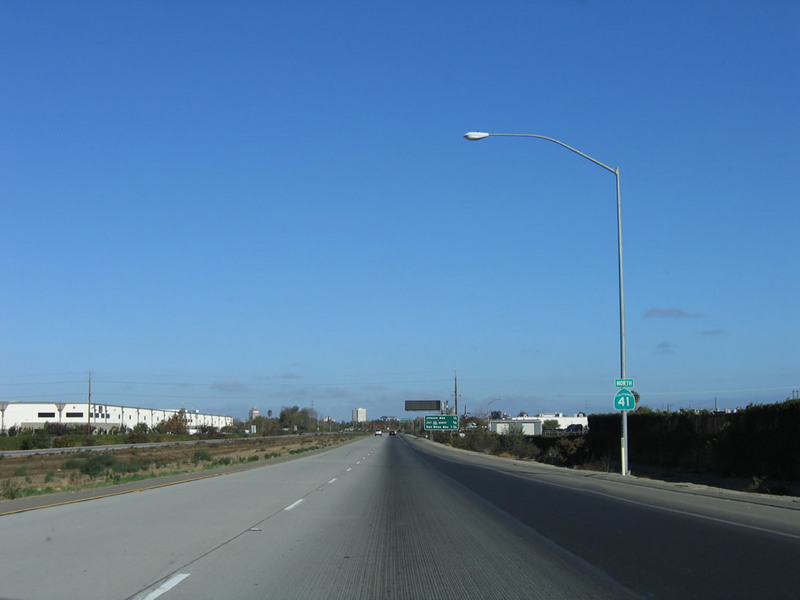 The California 41 expressway follows a path parallel to but east of Elm Avenue. 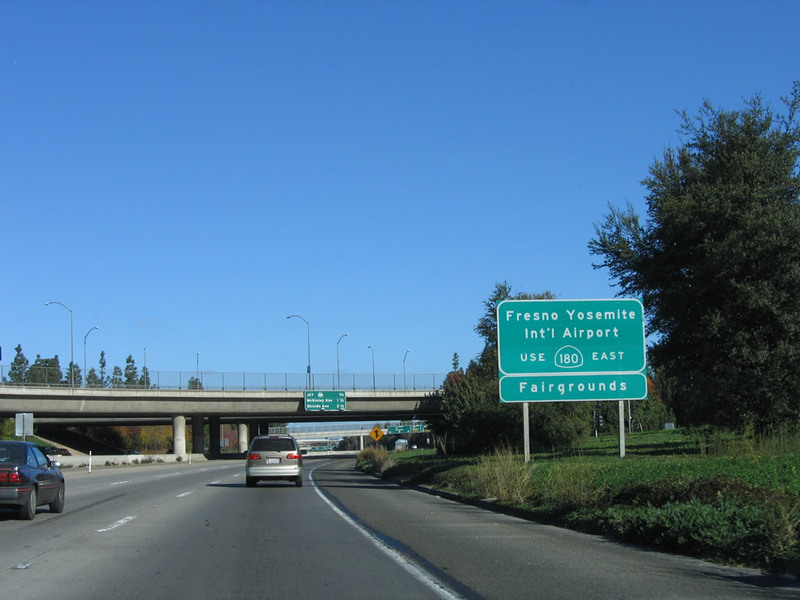 It will eventually change into a freeway upon entering the city of Fresno, but California 41 becomes known as the Yosemite Freeway from this point north through the city of Fresno. Photos taken 11/23/06. 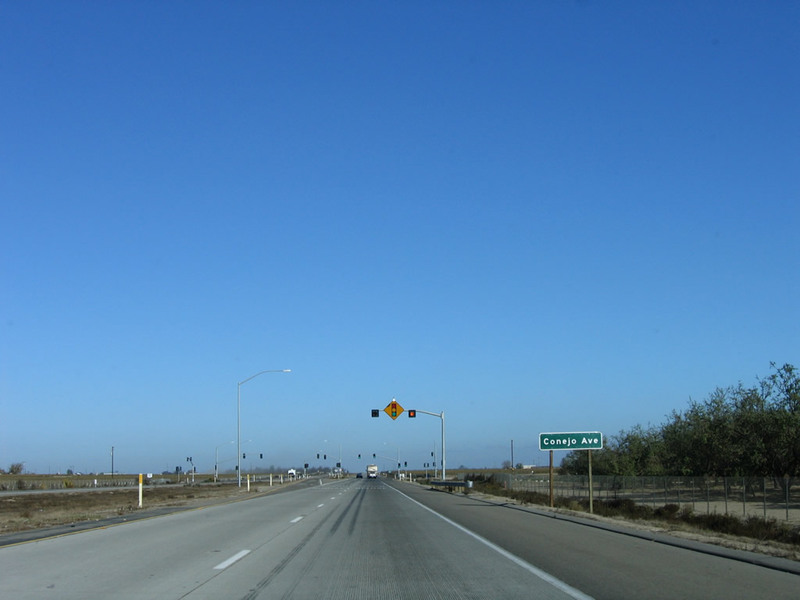 Now on a fully standard expressway with concrete through lanes, the first signalized intersection along California 41 (Yosemite Freeway) north is with Conejo Avenue. 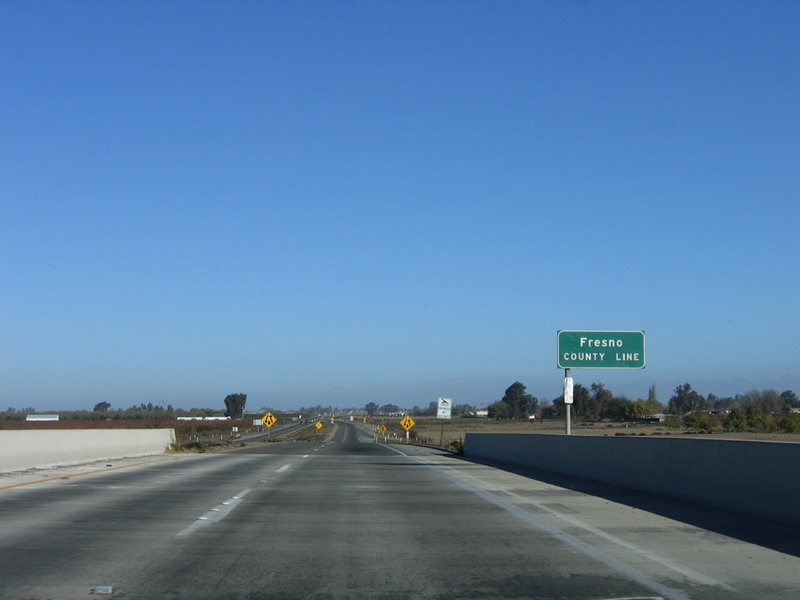 Use Conejo Avenue (a Fresno county-maintained route) east to Conejo and Kingsburg (California 201 (Sierra Street) interchange with California 99). Photos taken 11/23/06. 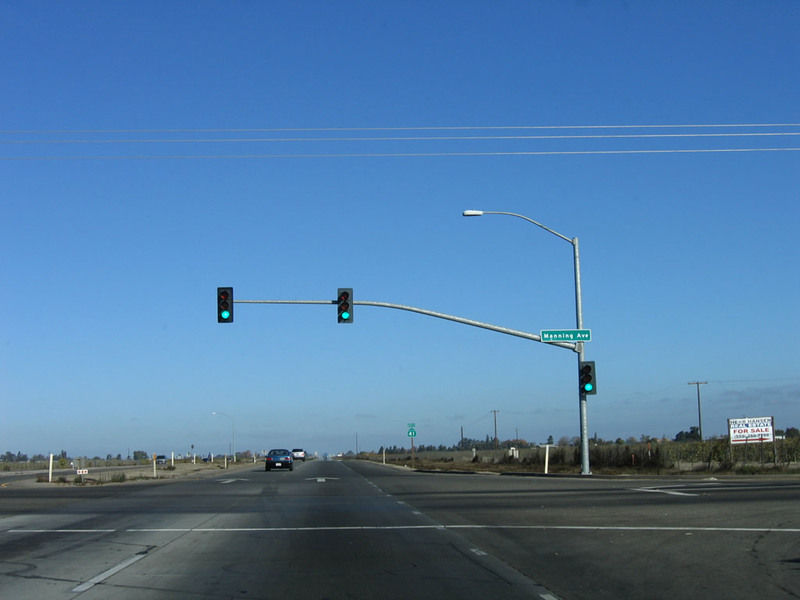 The next signalized intersection along California 41 (Yosemite Freeway) is with Mountain View Avenue. 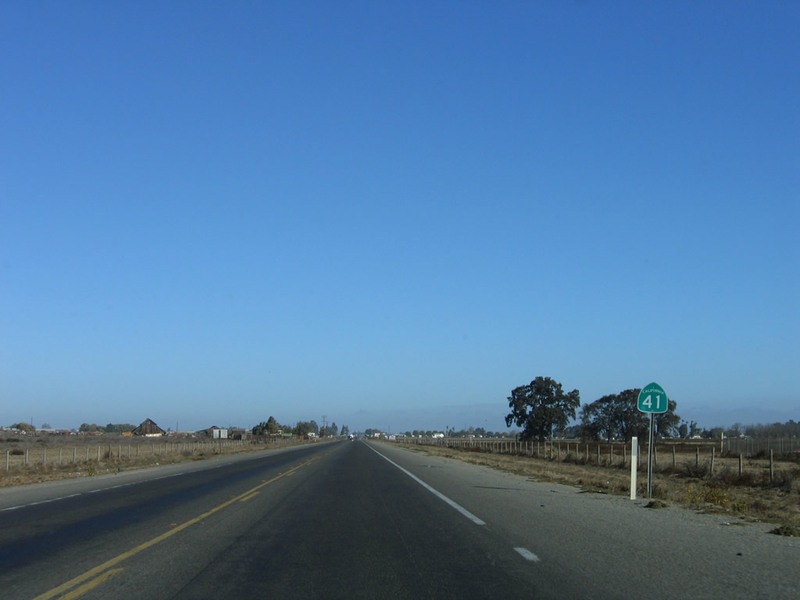 This county-maintained highway travels west to Elm View and Caruthers (two miles) and east to Selma (via a connection with California 43 (Highland Avenue) north, 11 miles). Photos taken 11/23/06. 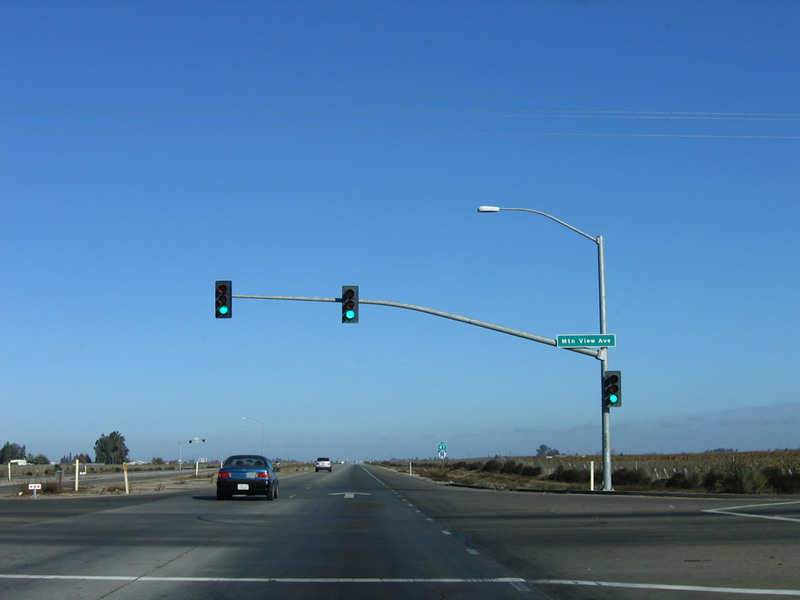 The next two signed intersections along California 41 (Yosemite Freeway) north are with Nebraska Avenue (one mile north of Mountain View Avenue) and Floral Avenue (two miles north of Mountain View Avenue). 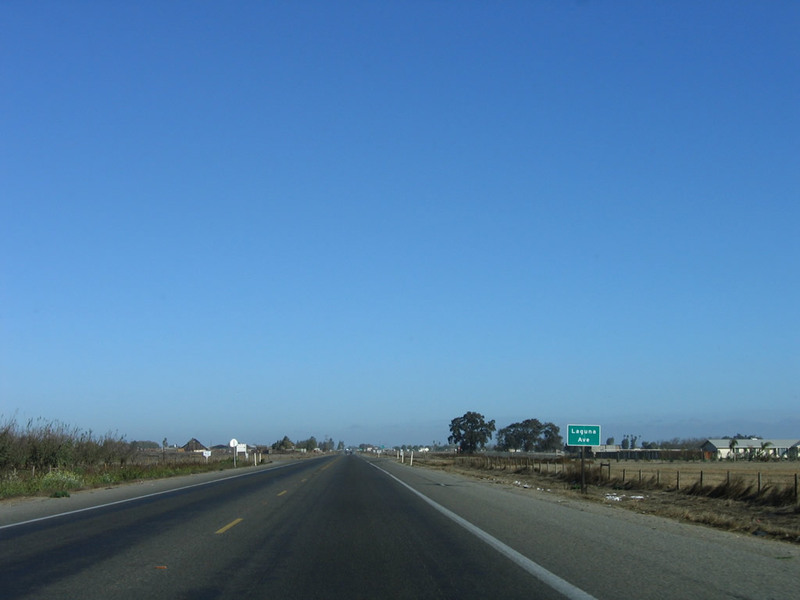 Both Nebraska Avenue and Floral Avenue travel east to Selma on the California 99 corridor. Photos taken 11/23/06. 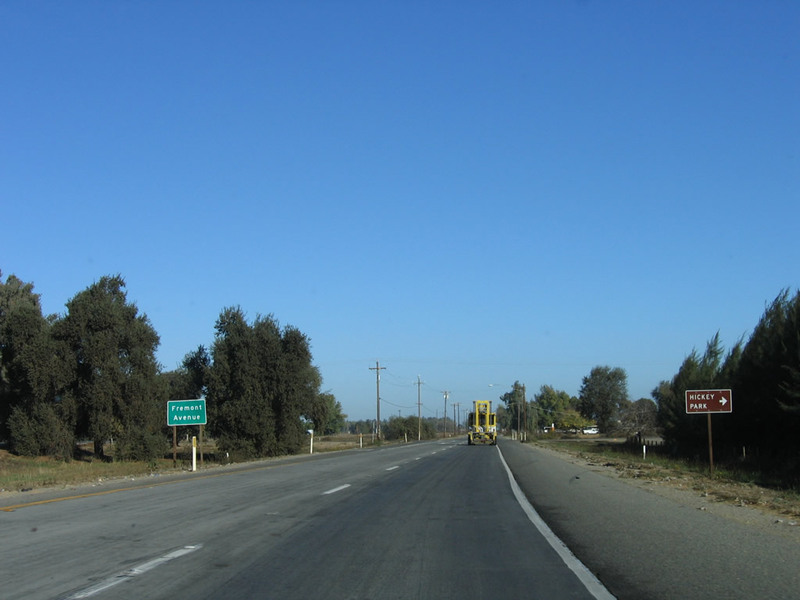 A California 41 north reassurance shield is posted after the Floral Avenue intersection. Photo taken 11/23/06. 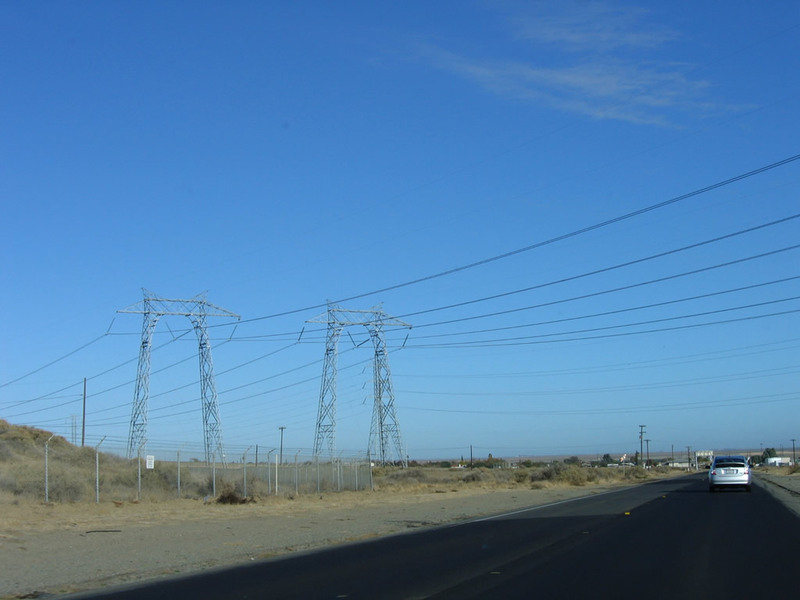 A set of Pacific Gas and Electric power lines cross over California 41 between Floral Avenue and Manning Avenue. Photo taken 11/23/06. 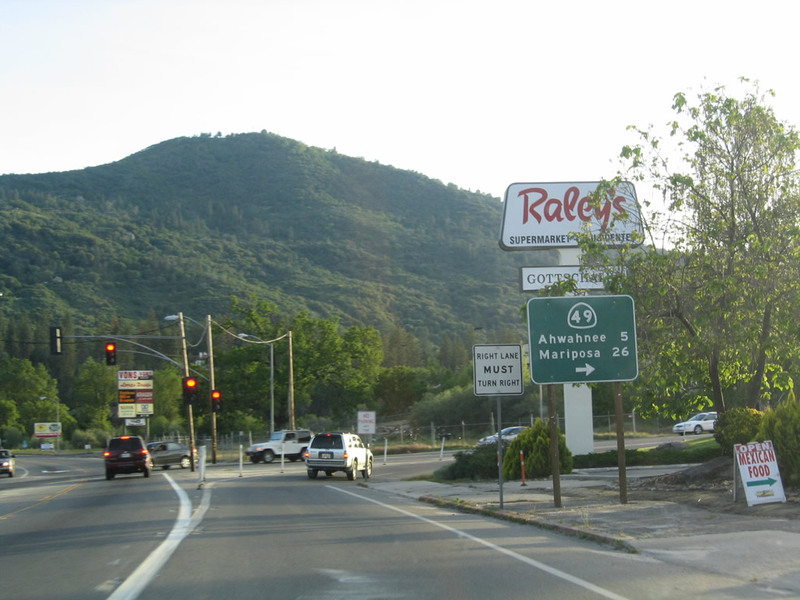 The next intersection along California 41 (Yosemite Freeway) north is with Manning Avenue. Use Manning Avenue east to Bowles, Parlier, and Reedley. 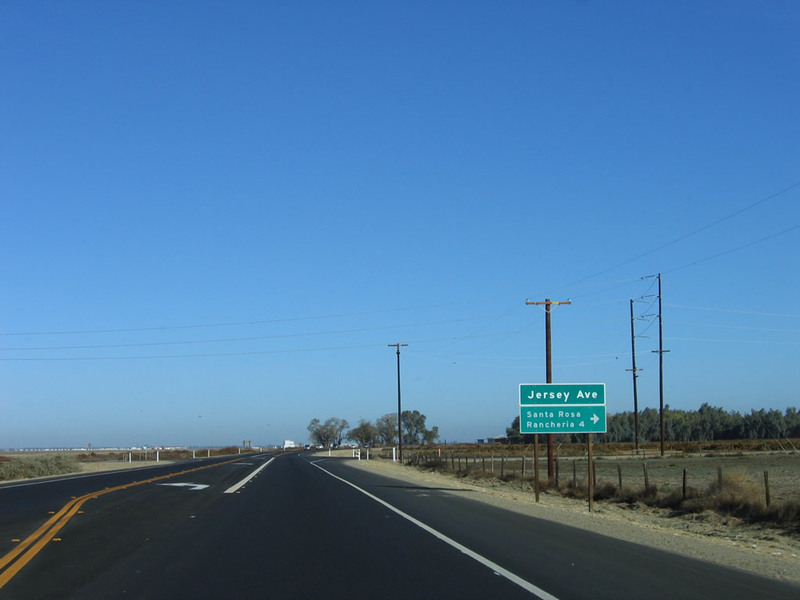 To the west, Manning Avenue travels to Raisin City, San Joaquin, and a junction with Interstate 5 Exit 365 in the west valley. 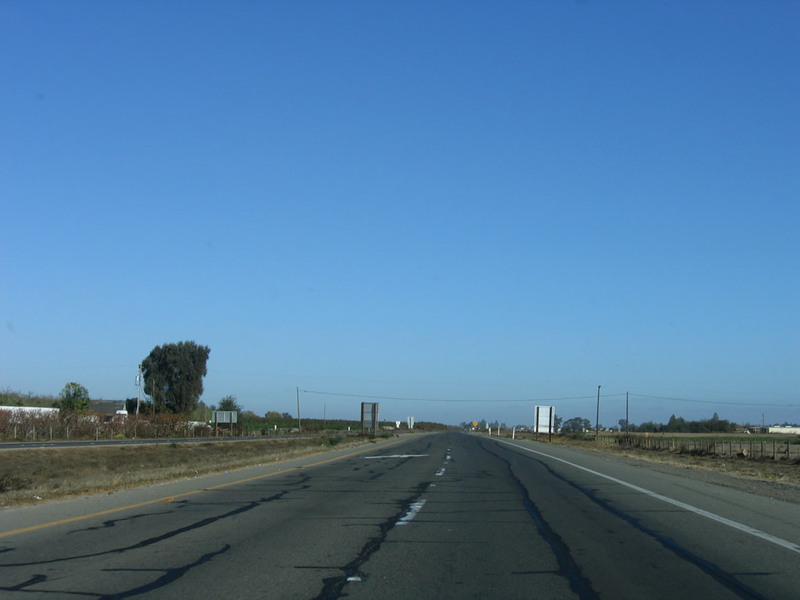 This is a major east-west arterial across Fresno County. Photo taken 11/23/06. 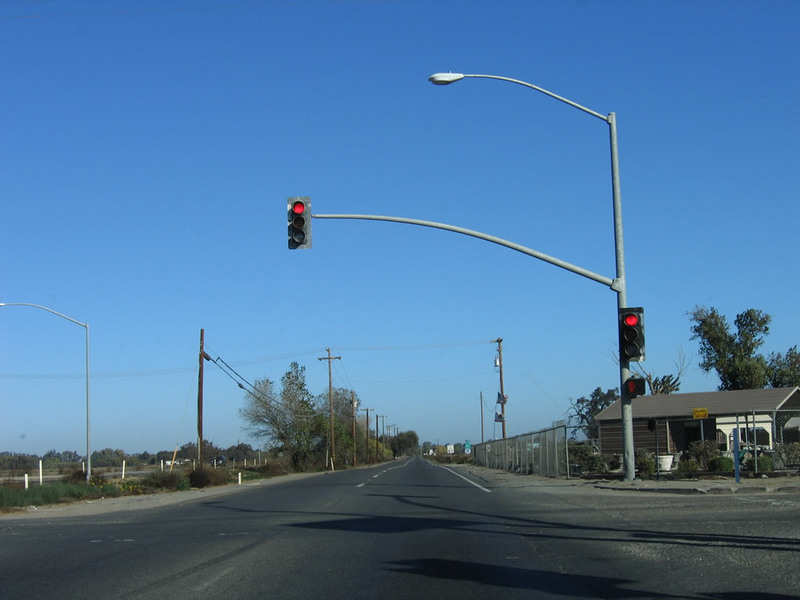 Northbound California 41 (Yosemite Freeway) meets Manning Avenue at this traffic signal. Photo taken 11/23/06. 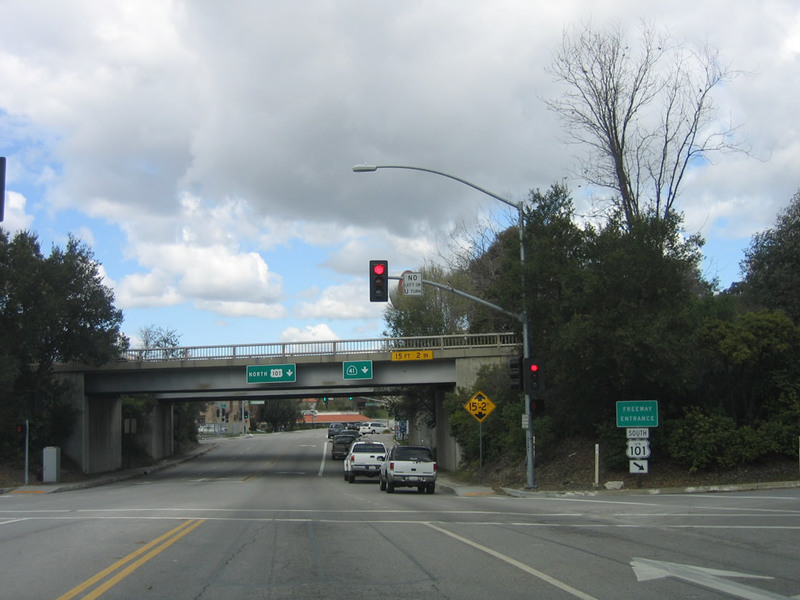 The next intersection along California 41 (Yosemite Freeway) north is with South Avenue, approximately 1.5 miles north of the Manning Avenue intersection. Photo taken 11/23/06. 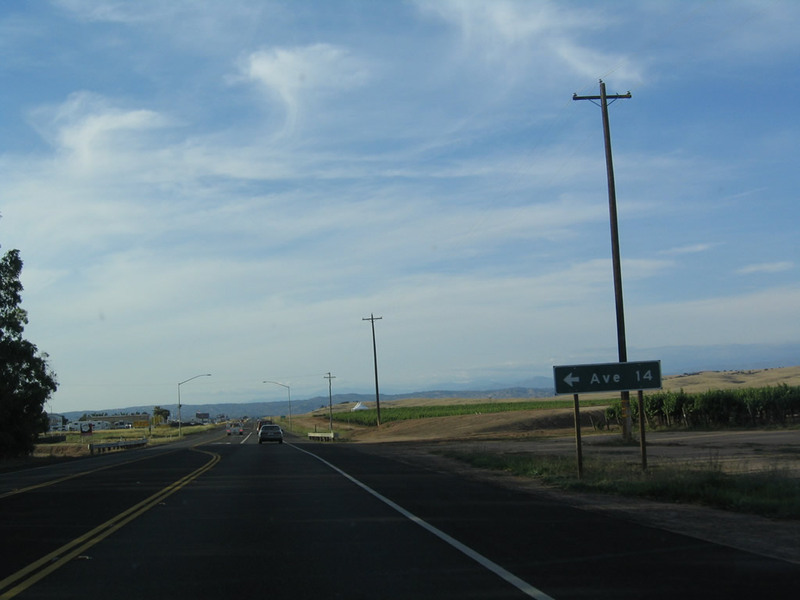 A California 41 north reassurance shield is posted after the South Avenue intersection. Photo taken 11/23/06. 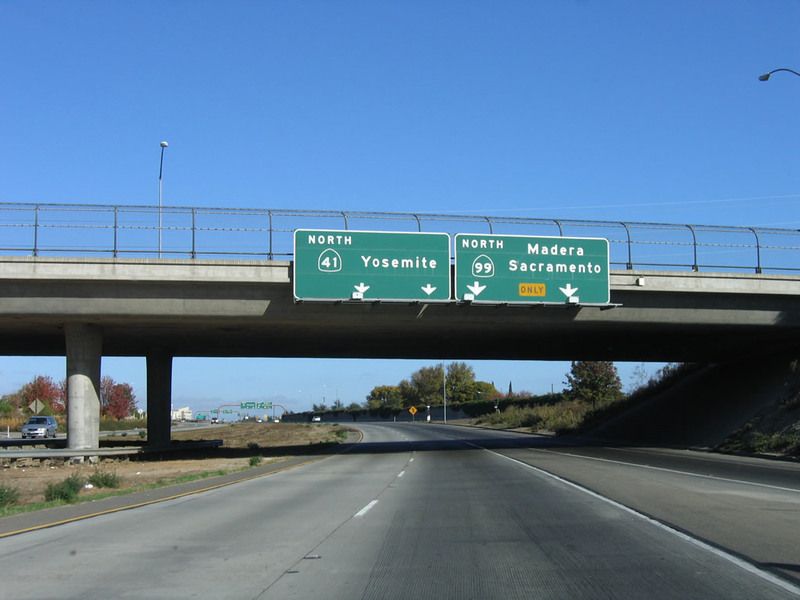 The next intersection along California 41 (Yosemite Freeway) north is with Adams Avenue (Exit 120), which connects to California 41 Business/Elm Avenue north to Easton. Easton is an unincorporated community with a population of 1,966 as of the 2000 Census. It sits at an elevation of 276 feet. Photo taken 11/23/06. Northbound California 41 (Yosemite Freeway) meets Adams Avenue west to California 41 Business/Elm Avenue north to Easton and east to Oleander and Fowler. 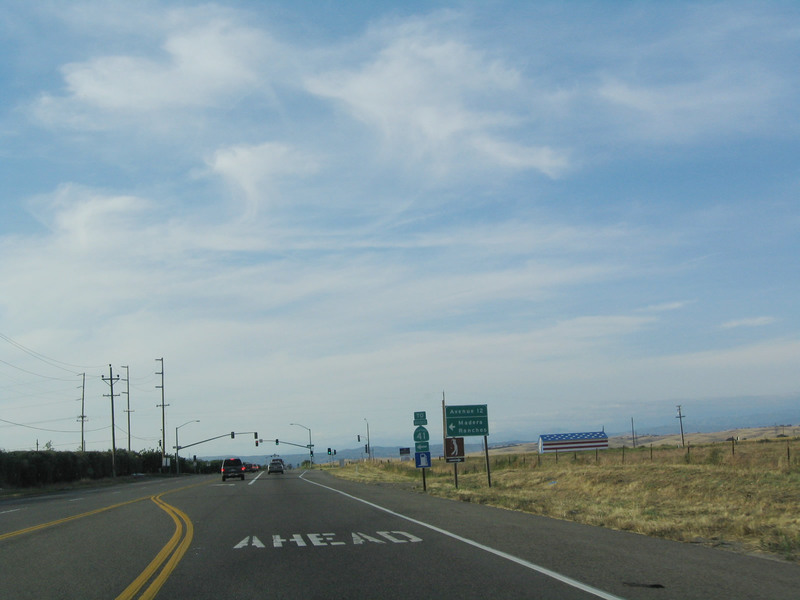 The business route reconnects to California 41 at American Avenue, about two-three miles north of here. Photo taken 11/23/06. 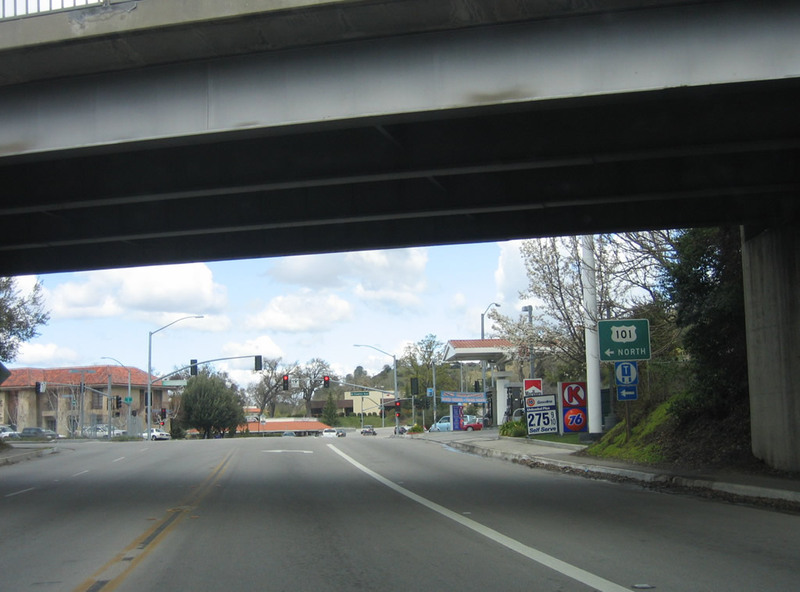 Bypassing Easton to the east, California 41 sees a brief freeway alignment (built 1998). 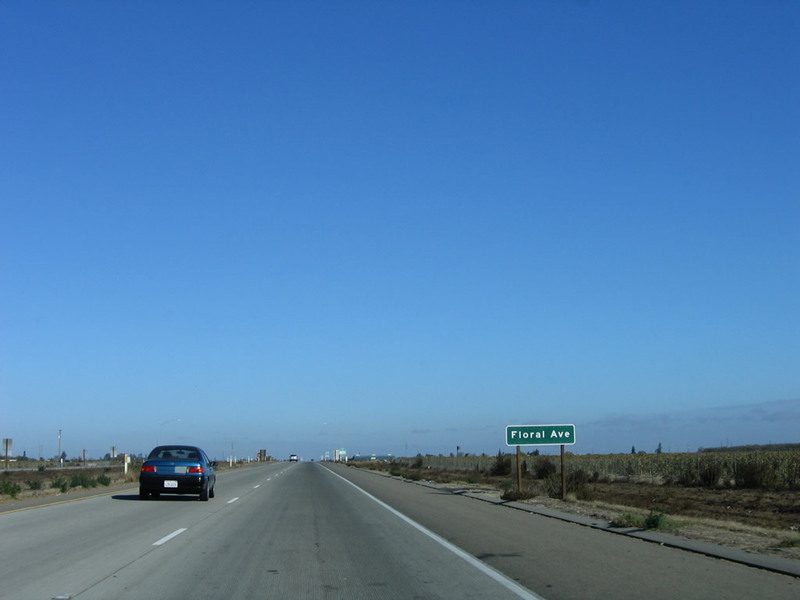 Two highways pass over California 41 without intersecting: Clayton Avenue and Lincoln Avenue. The expressway again resumes with an at-grade intersection with American Avenue (California 41 Business south). Photos taken 11/23/06. The next intersection along California 41 (Yosemite Freeway) north is with American Avenue (Exit 122) west to California 41 Business/Elm Avenue south to Easton and east to Del Rey. 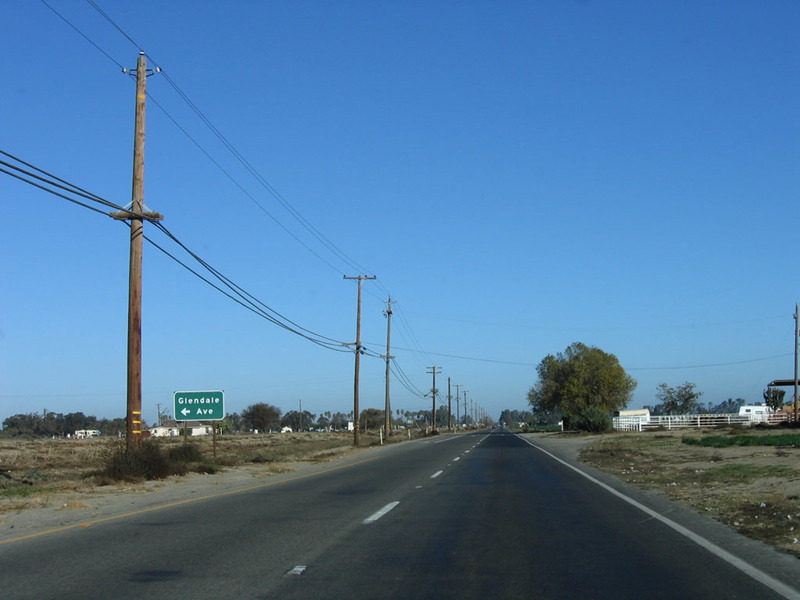 The business route reconnects to California 41 at Adams Avenue south of here. Photo taken 11/23/06. Northbound California 41 (Yosemite Freeway) meets American Avenue west to California 41 Business/Elm Avenue south to Easton and east to Del Rey. Photo taken 11/23/06. 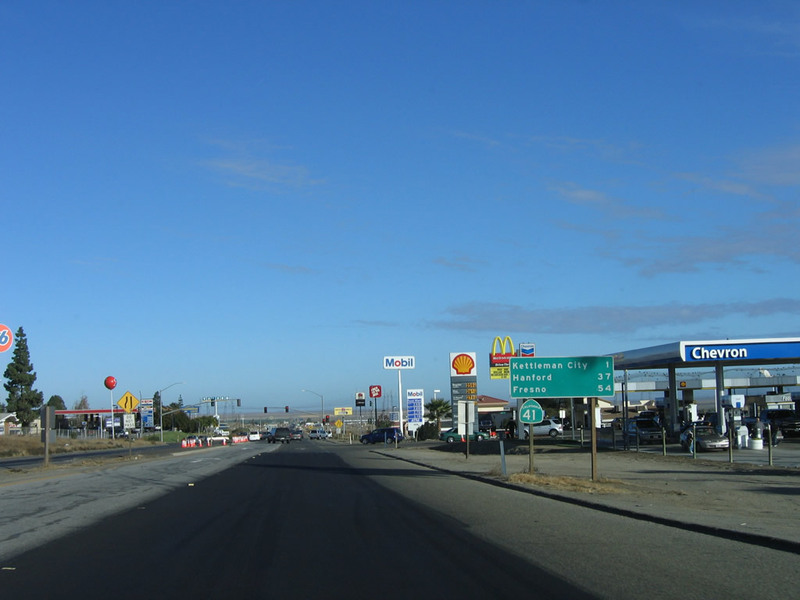 The next intersection along California 41 (Yosemite Freeway) north is with Central Avenue (Exit 123). Photo taken 11/23/06. Northbound California 41 (Yosemite Freeway) meets Central Avenue. 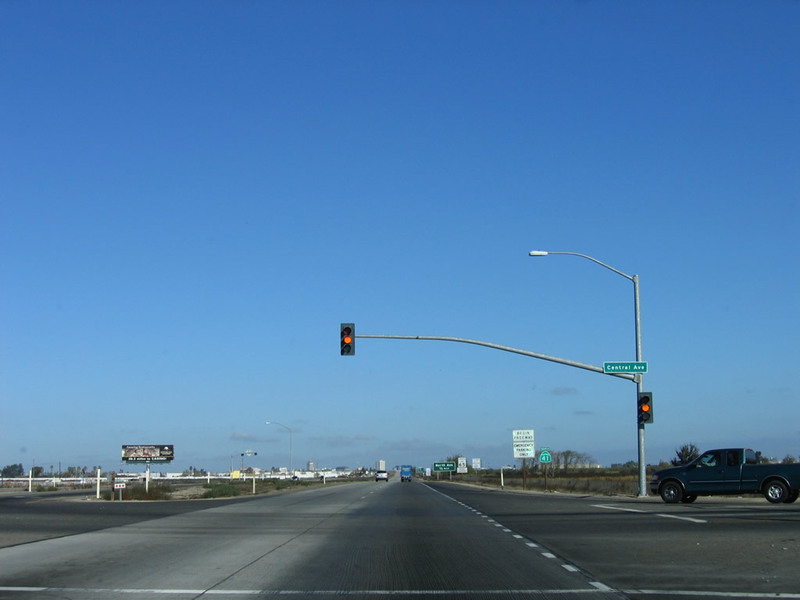 This is the final signalized intersection before California 41 assumes a full freeway configuration with traffic interchanges. Photo taken 11/23/06. 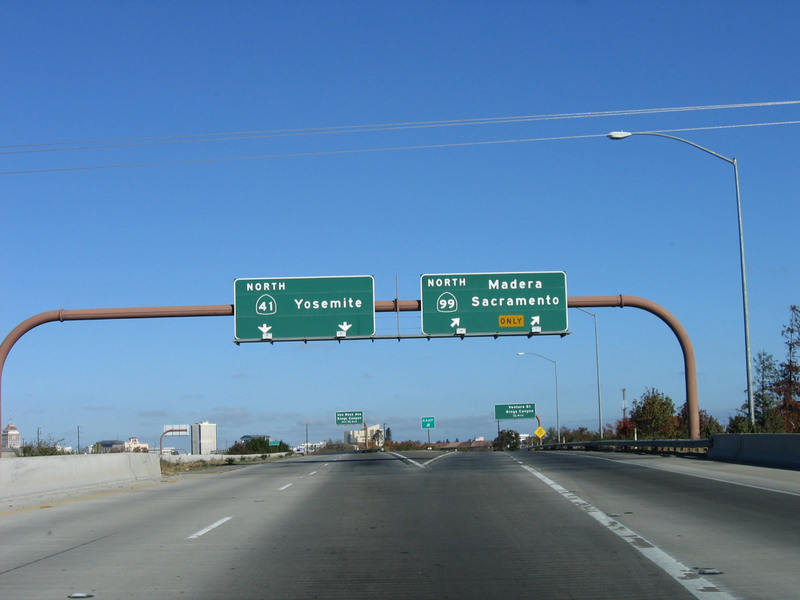 The first exit on California 41 (Yosemite Freeway) is Exit 124, North Avenue (one-half mile; full diamond interchange). Photo taken 11/23/06. 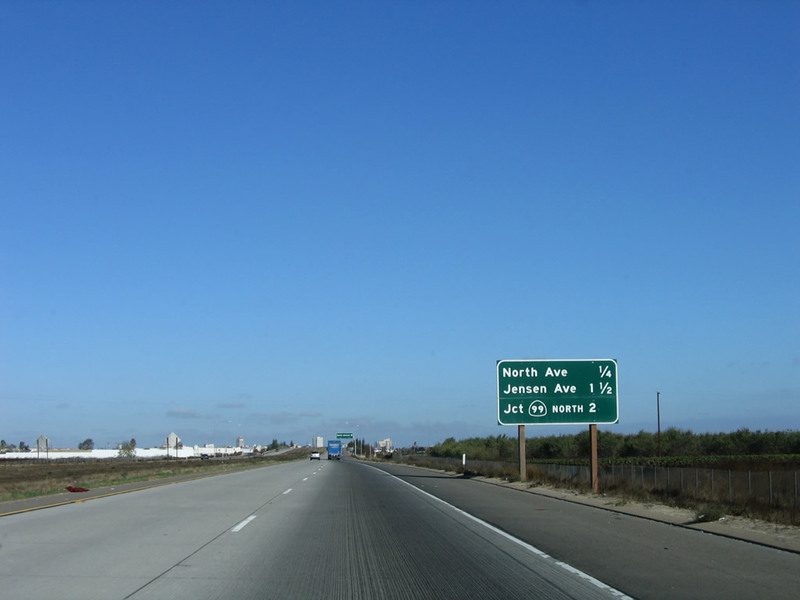 This mileage sign provides the distance to the first three exits on California 41 (Yosemite Freeway): Exit 124, North Avenue; Exit 125, Jensen Avenue; and Exit 126A, California 99 north. Photo taken 11/23/06. 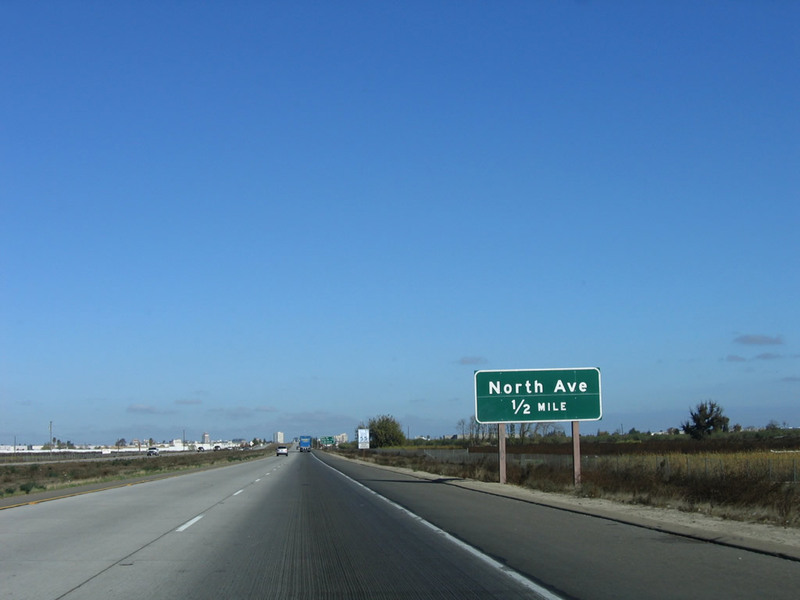 Northbound California 41 (Yosemite Freeway) meets Exit 124, North Avenue. 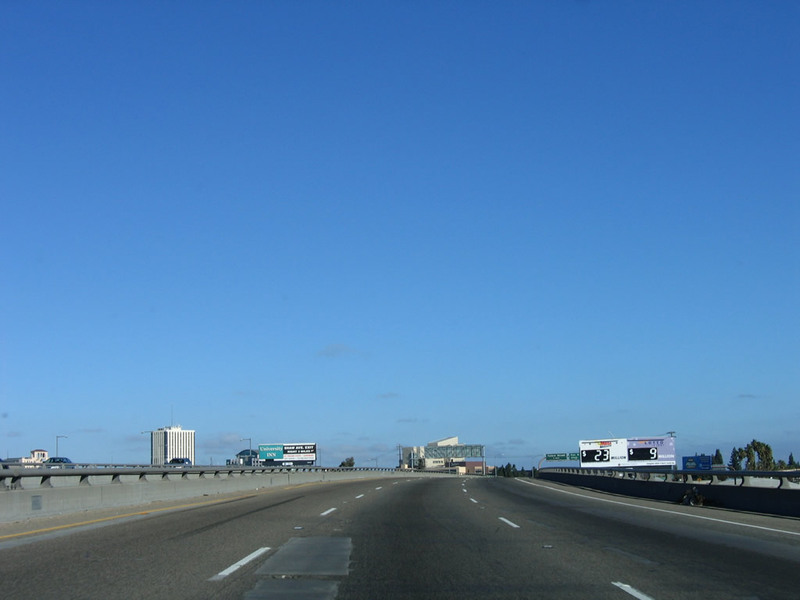 The section of freeway from North Avenue to California 99 was built in 1997. Photo taken 11/23/06. 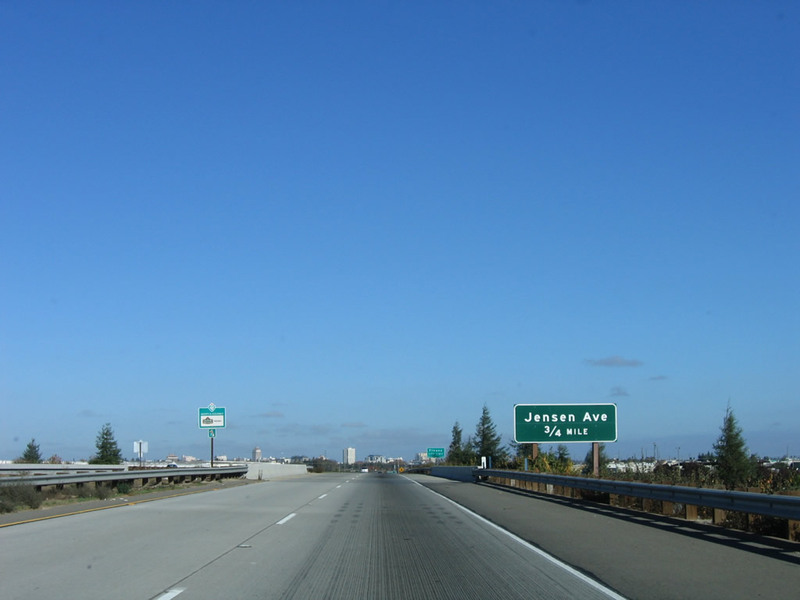 The next exit along California 41 (Yosemite Freeway) is Exit 125, Jensen Avenue (three-quarters mile; partial cloverleaf interchange). Photo taken 11/23/06. 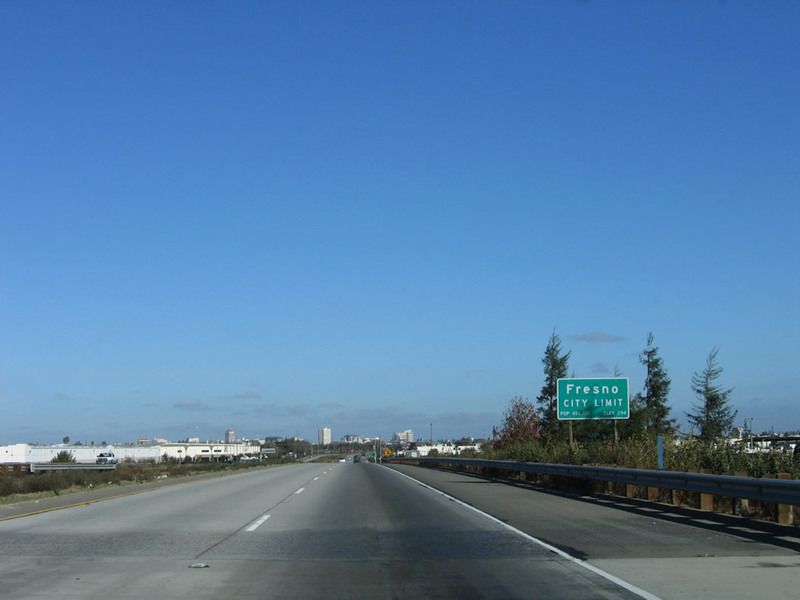 California 41 (Yosemite Freeway) enters the city of Fresno in the heart of the San Joaquin Valley. Home to 427,652 people as of the 2000 Census, Fresno has seen significant growth to where 2009 population estimates are over one-half million (500,000 people). 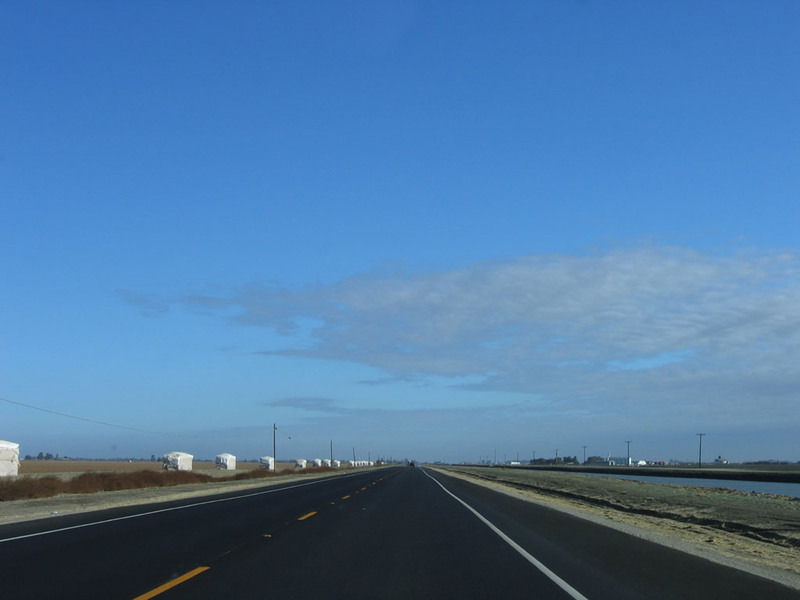 The city has seen substantial development around the city and is the seat of largely agricultural Fresno County. It was founded on October 12, 1885. 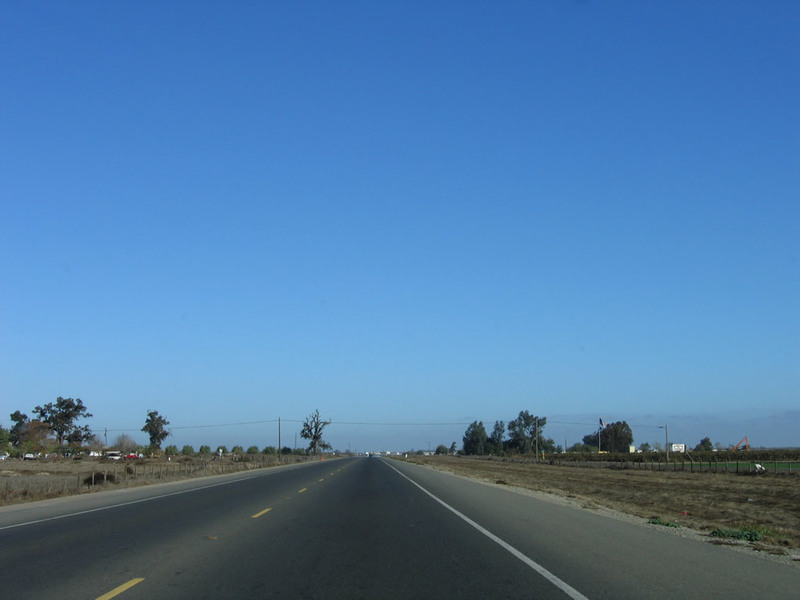 Fresno sits at an elevation of 294 feet and lies along the Historic U.S. 99 corridor. 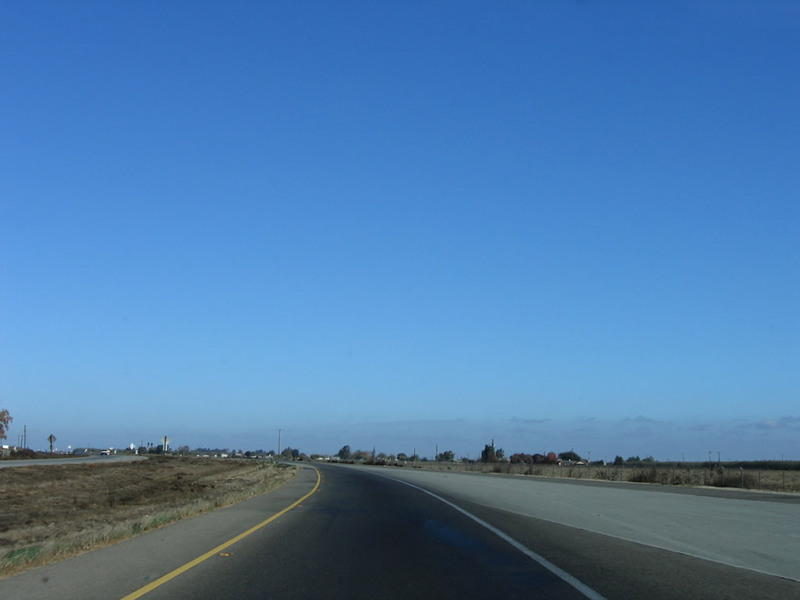 It is the largest city in California (and the United States) not to be served by an Interstate Highway, but it is served by three major freeways: California 41 (north-south), California 99 (northwest-southeast), and California 180 (east-west). 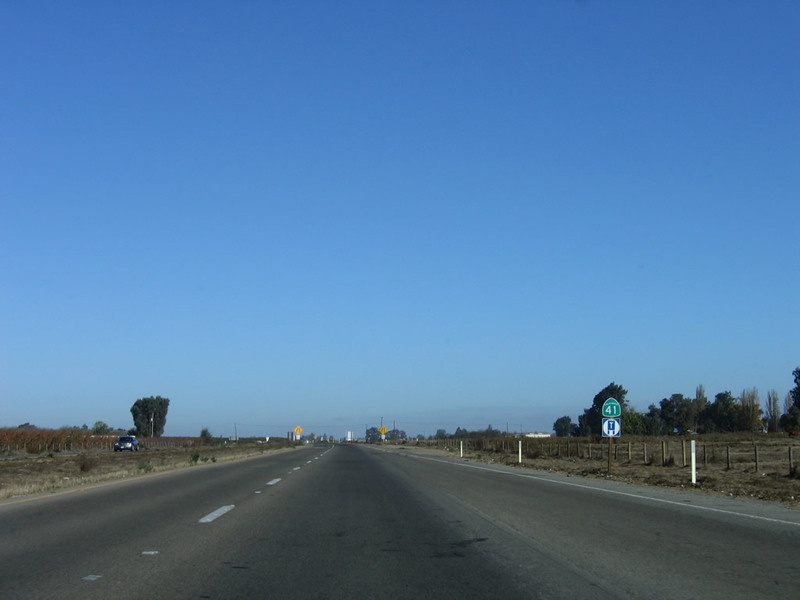 A fourth north-south freeway (California 168) offers relief to California 41. Photo taken 11/23/06. 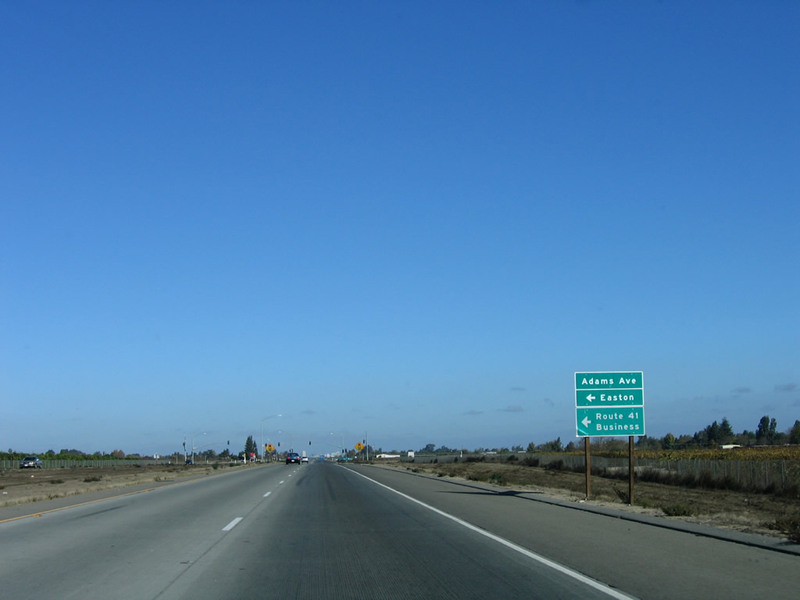 A California 41 north reassurance shield is posted after the on-ramp from North Avenue. Photo taken 11/23/06. 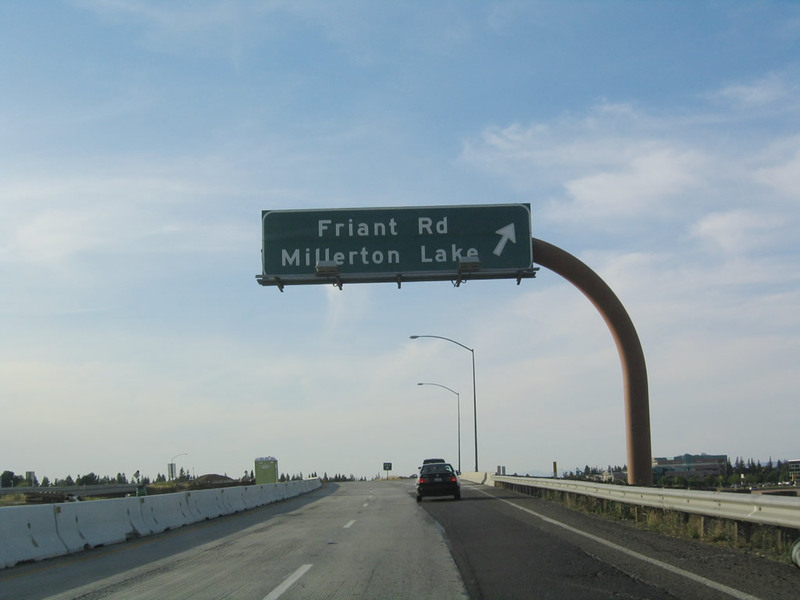 This mileage sign provides the distance to the first three exits on California 41 (Yosemite Freeway): Exit 125, Jensen Avenue; Exit 126A, California 99 north; and Exit 126B, Van Ness Avenue to downtown Fresno. Photo taken 11/23/06. 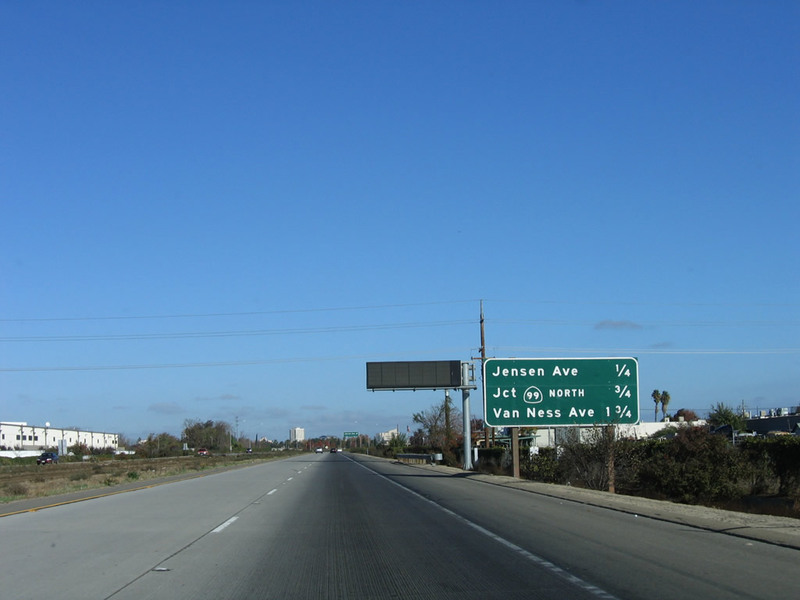 Northbound California 41 (Yosemite Freeway) meets Exit 125, Jensen Avenue. 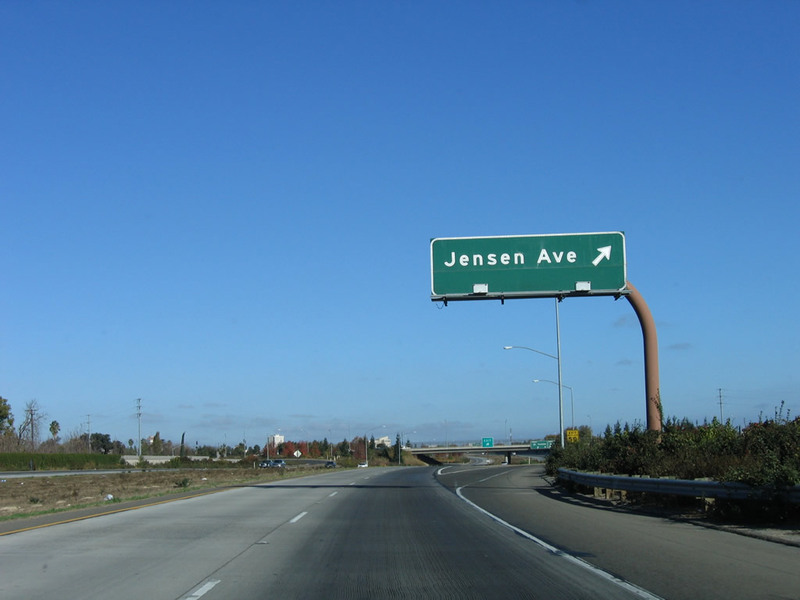 Use Jensen Avenue east to California 99 south. Photo taken 11/23/06. 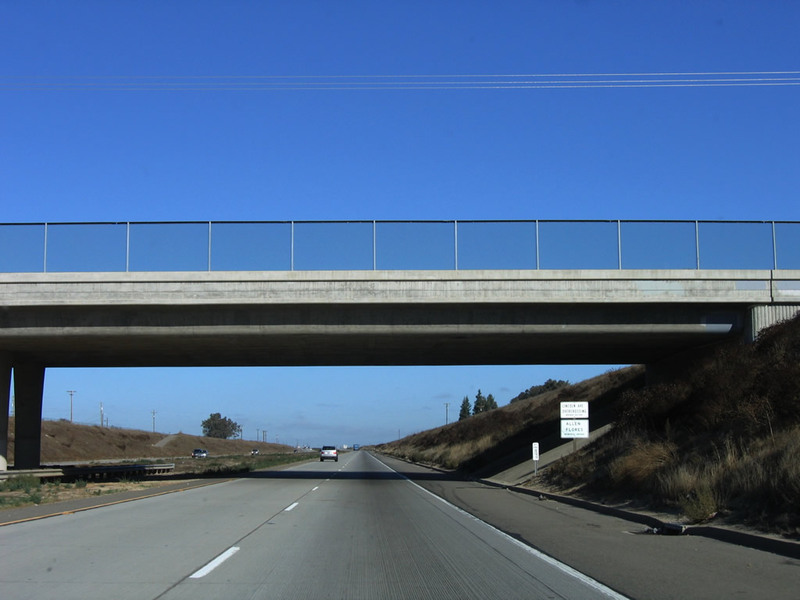 Passing under Jensen Avenue overpass, northbound California 41 (Yosemite Freeway) next approaches Exit 126A, California 99 north to Modesto, Stockton, and Sacramento. 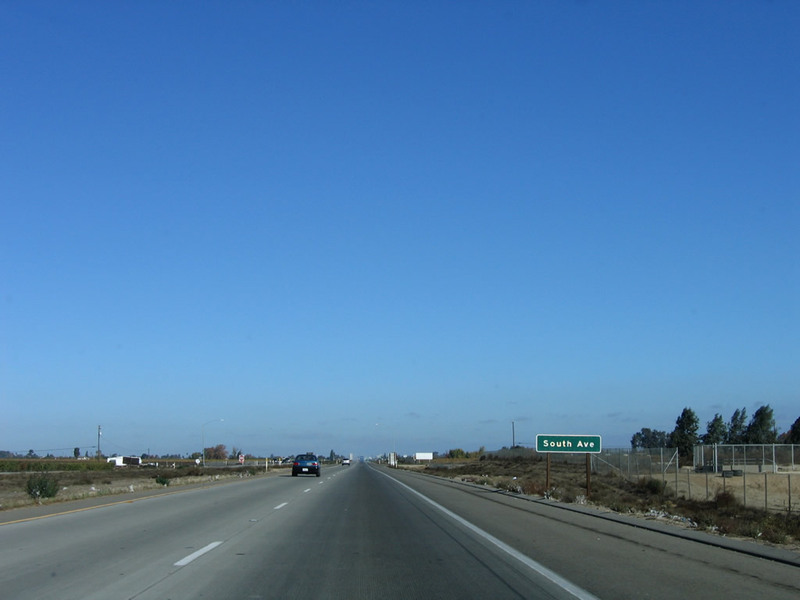 California 41 becomes the Dwight D. Eisenhower Memorial Freeway north of California 99. Photo taken 11/23/06. 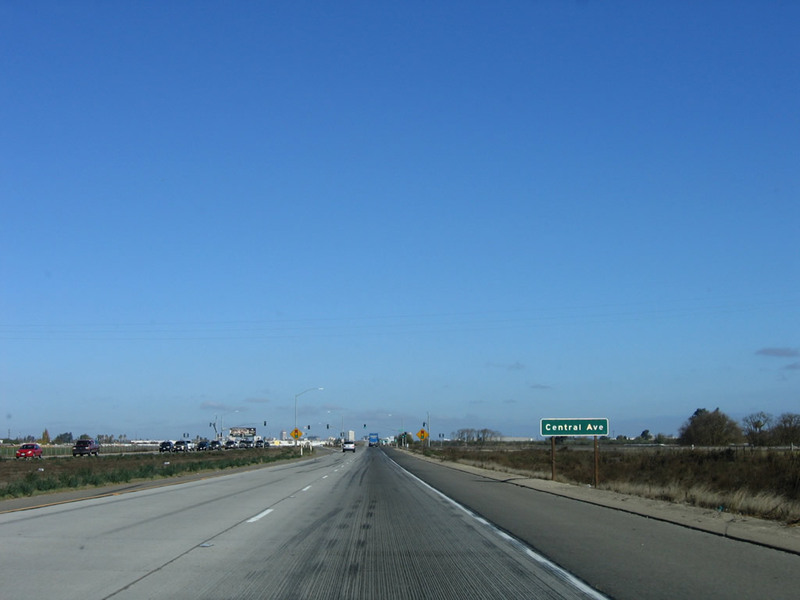 The left three lanes continue north on California 41 north, while the right two lanes connect to California 99 north. There is no direct access to California 99 south. Photo taken 11/23/06. 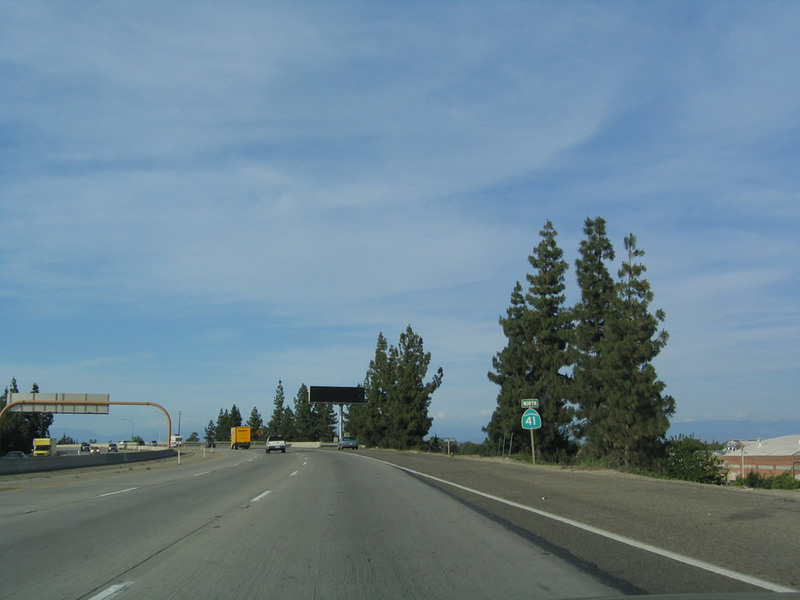 Northbound California 41 meets Exit 126A, California 99 (Golden State Freeway) north. 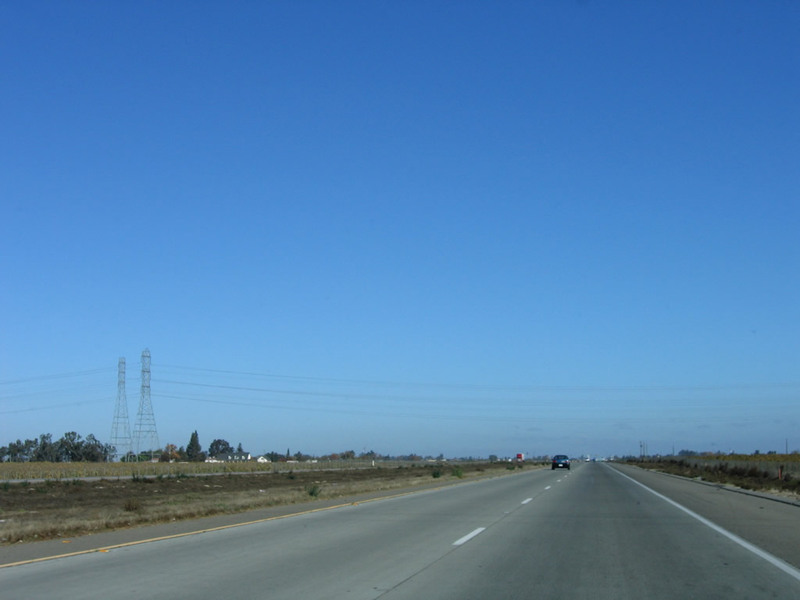 California 99 is a major north-south freeway that serves most of the cities through the Central Valley, from Bakersfield to Fresno to Modesto to Stockton to Sacramento to Chico to Red Bluff. 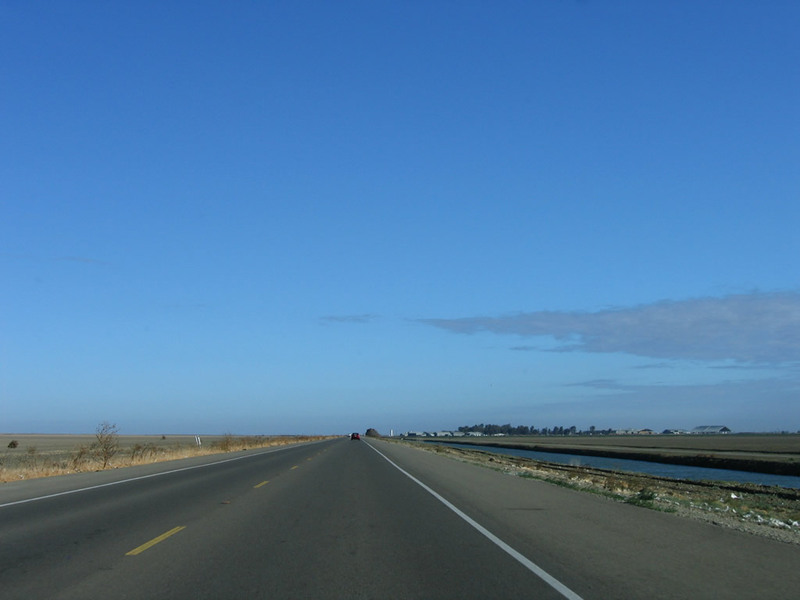 Replacing Historic U.S. 99, California 99 is almost entirely freeway between Bakersfield and Sacramento. 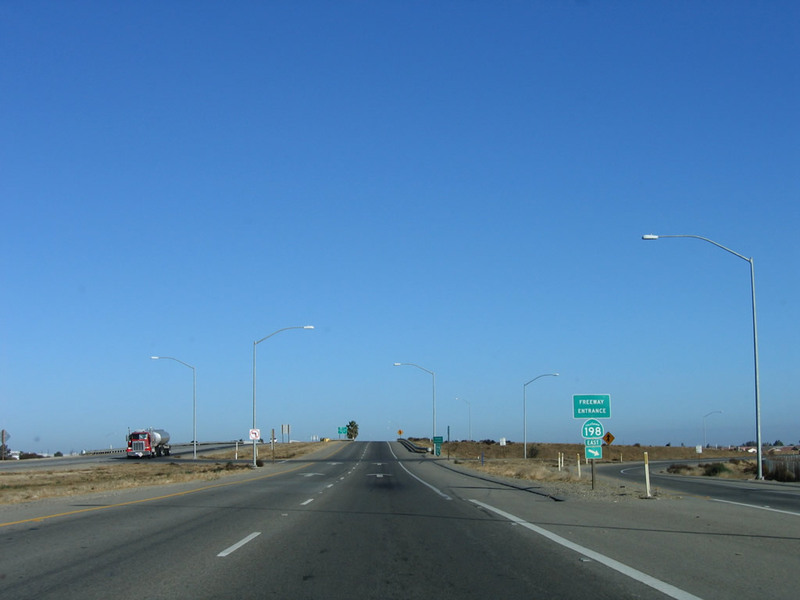 Projects underway converted the rest of California 99 into full freeway standards with interchanges. Photo taken 11/23/06. 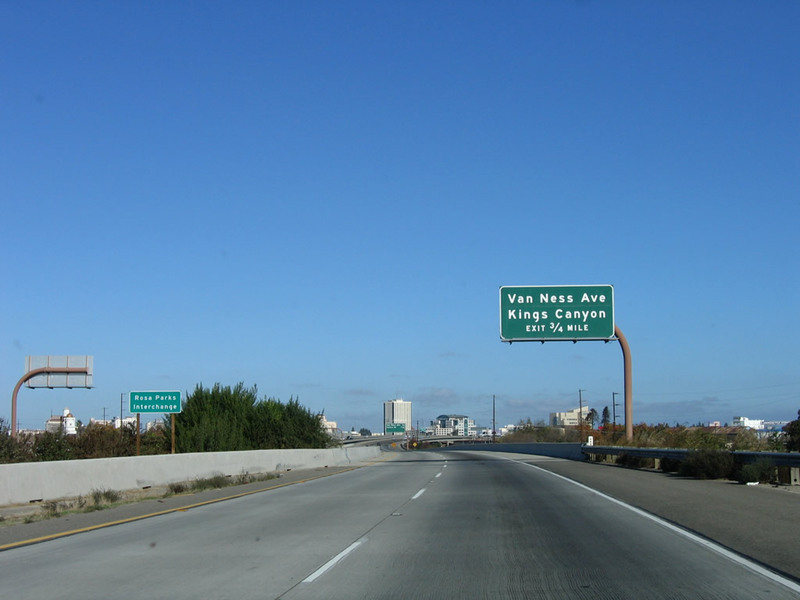 The next exit along California 41 north is Exit 126B, Van Ness Avenue and Ventura Street (which is signed to Kings Canyon via the former route of California 180). 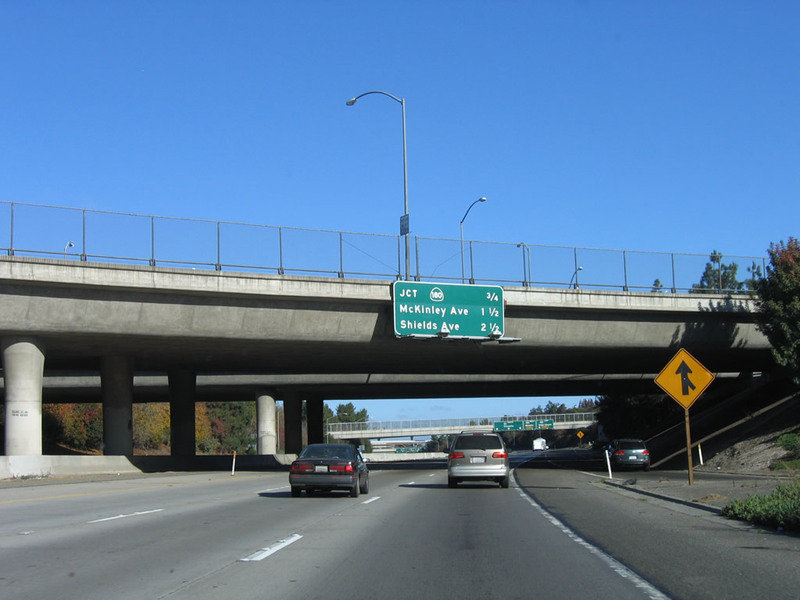 The interchange between California 99 and California 41, known as the Rosa Parks Interchange, was built in 1963 and expanded in 1997 to accommodate the freeway extension of California 41 south to Jensen Avenue and Easton. Photo taken 11/23/06. 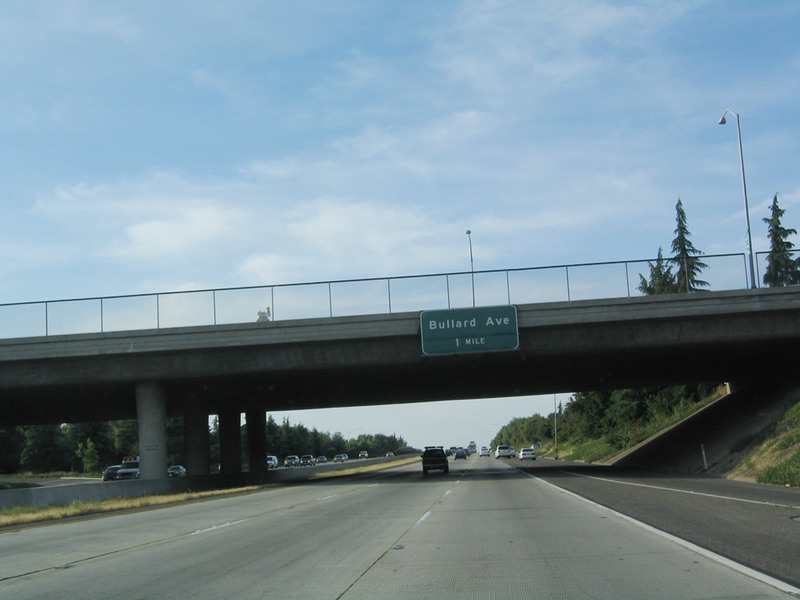 California 41 carries two northbound lanes over the California 99 freeway through the Rosa Parks Interchange (the interchange was expanded in 1997). Photo taken 11/23/06. 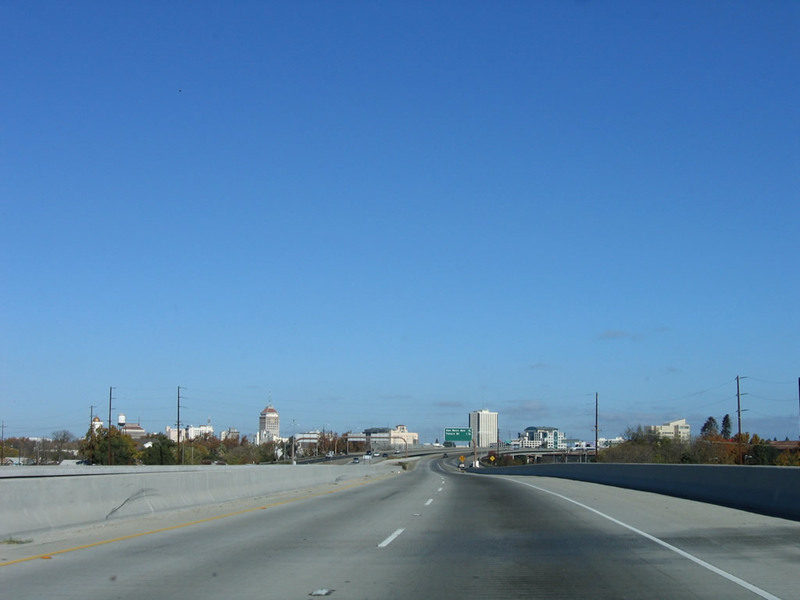 The downtown skyscrapers of Fresno come into view ahead as we continue on an elevated viaduct. 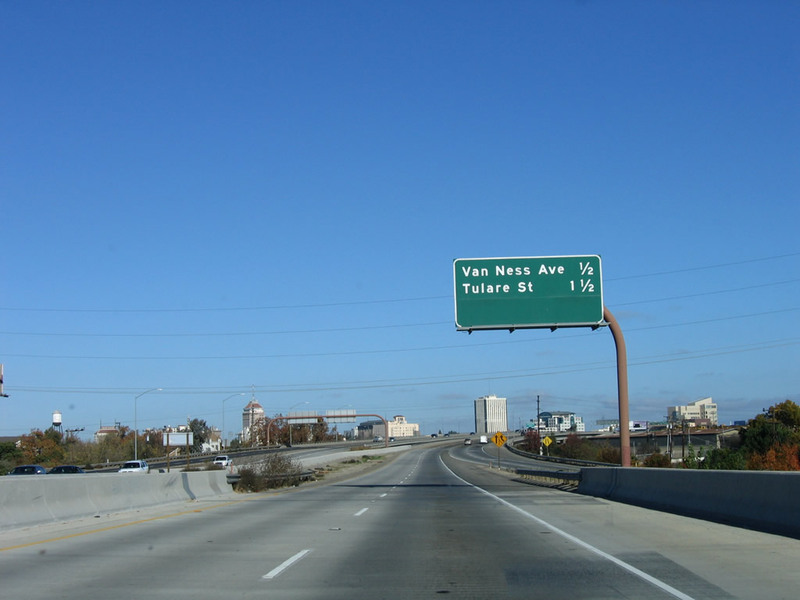 This mileage sign provides the distance to the next two exits along California 41 (Yosemite Freeway) north: Exit 126B, Van Ness Avenue and Ventura Street (old alignment of California 180) to downtown Fresno and Exit 127, Tulare Street and Divisadero Street. Photo taken 11/23/06. 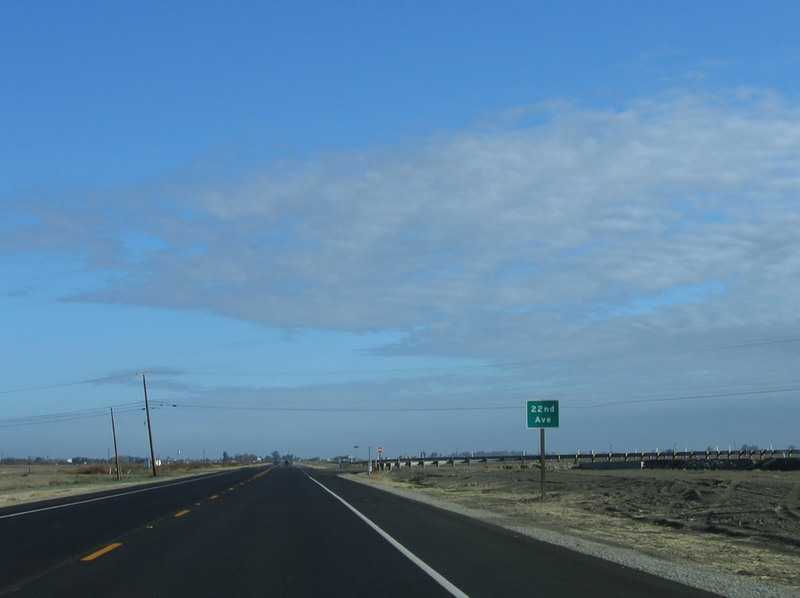 After traffic from California 99 north merges onto California 41 north, the freeway expands to three northbound lanes. Photo taken 11/23/06. 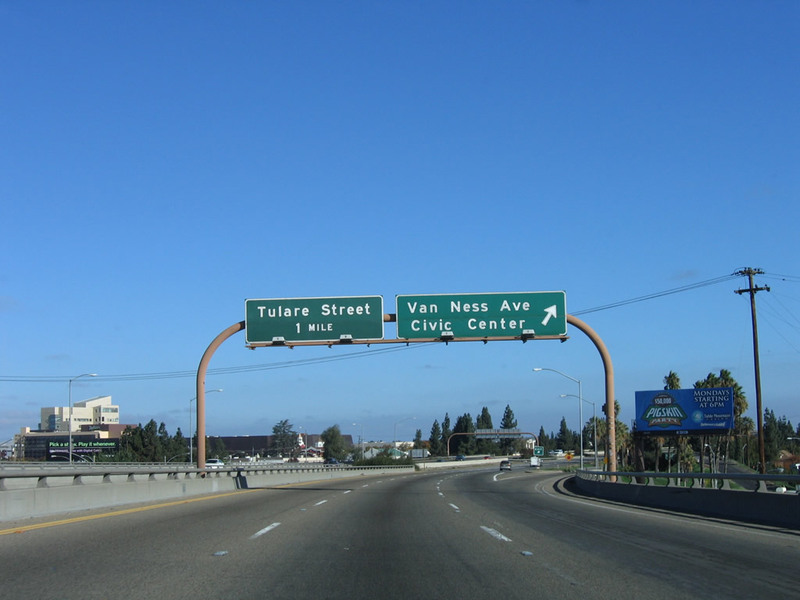 Northbound California 41 (Yosemite Freeway) reaches Exit 126B, Van Ness Avenue and Ventura Street. Use Van Ness Avenue north to Ventura Street east/west and to downtown Fresno including the Civic Center. This section of California 41 viaduct was built between 1966 and 1969. 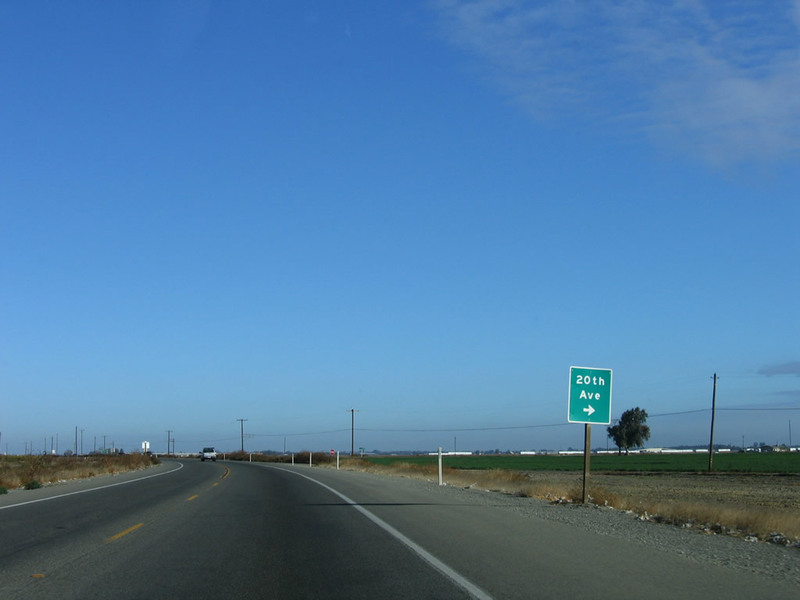 The next exit is Exit 127, Tulare Street. Photo taken 11/23/06. 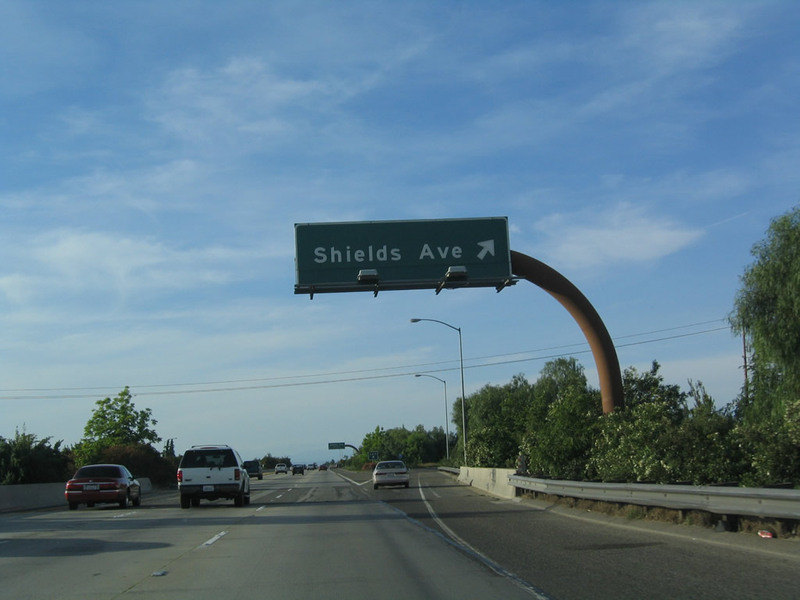 This California 41 north reassurance shield is posted after the on-ramp from Van Ness Avenue. Photo taken 05/13/05. California 41 through Fresno is known as the Yosemite Freeway but is also designated as the Dwight D. Eisenhower Memorial Freeway in honor of the 34th U.S. President who was responsible for the passage of the Federal Aid Highway Act of 1956 (National Interstate and Defense Highways Act), which created the modern Interstate Highway system. 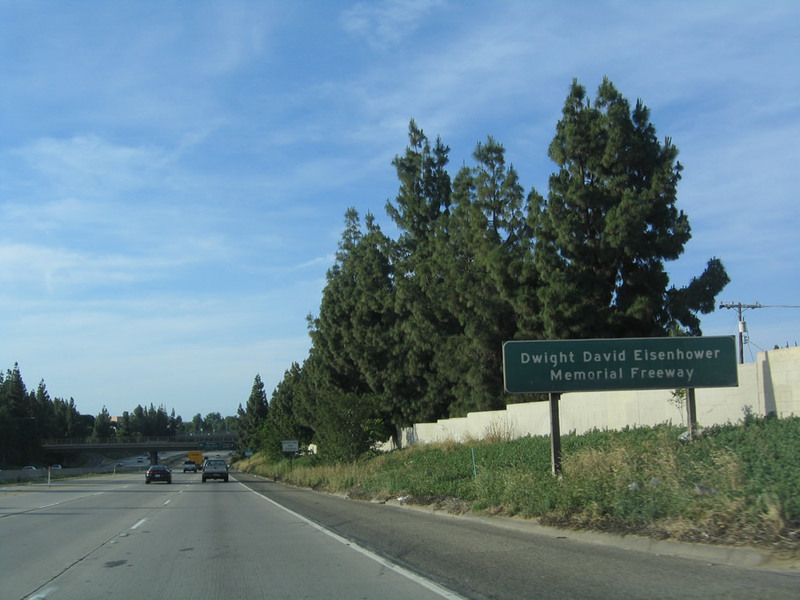 It is ironic that President Eisenhower is honored on a non-Interstate highway in the largest city in the United States not served by an Interstate Highway. Photo taken 05/13/05. 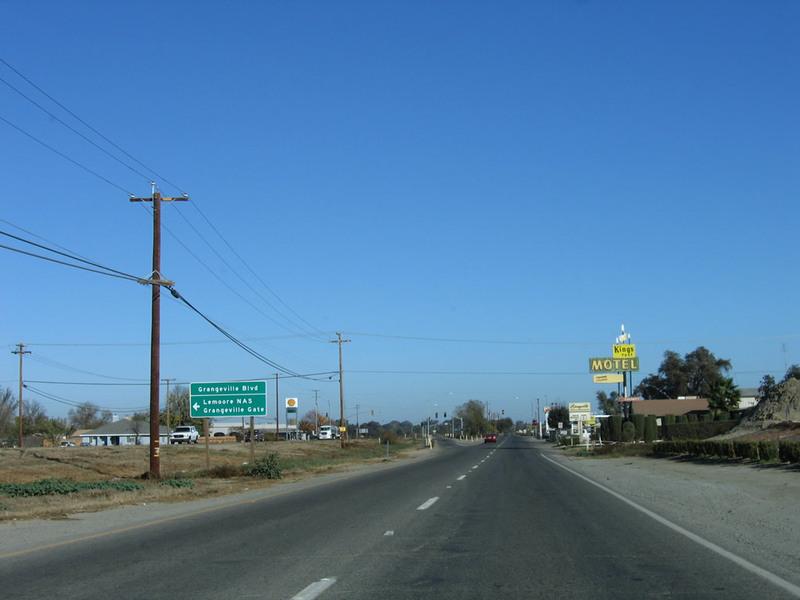 Northbound California 41 meets Exit 127, Tulare Street. 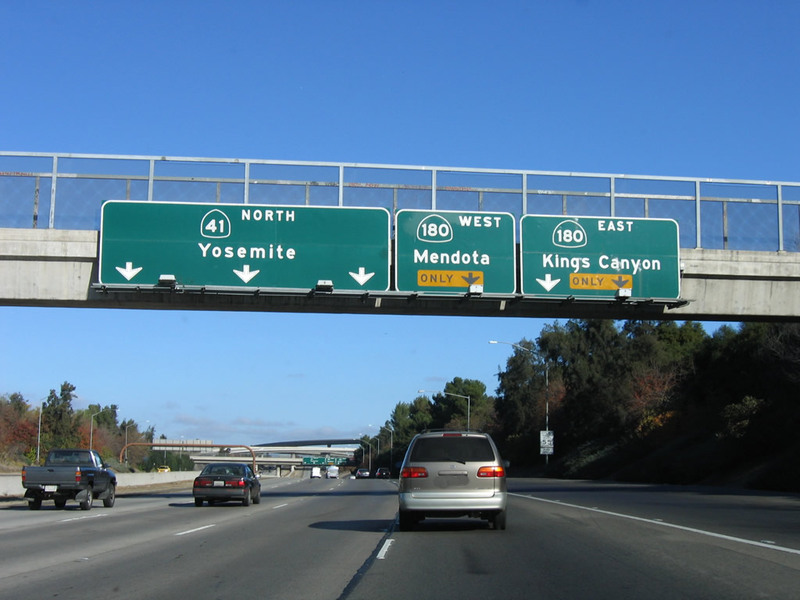 The next interchange along California 41 (Yosemite Freeway) is Exit 128, California 180 (Kings Canyon Freeway). Photo taken 05/13/05. 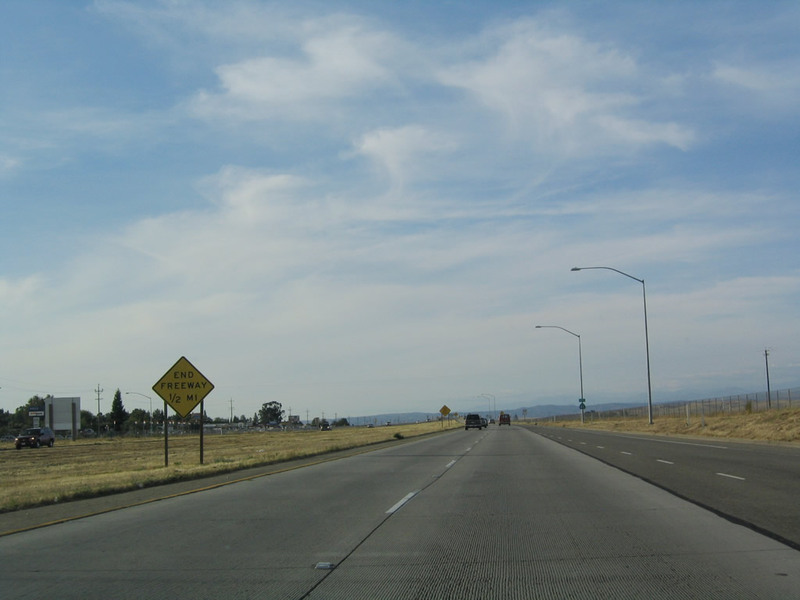 To Fresno International Airport, motorists are advised to use California 180 east according to this sign on northbound California 41. 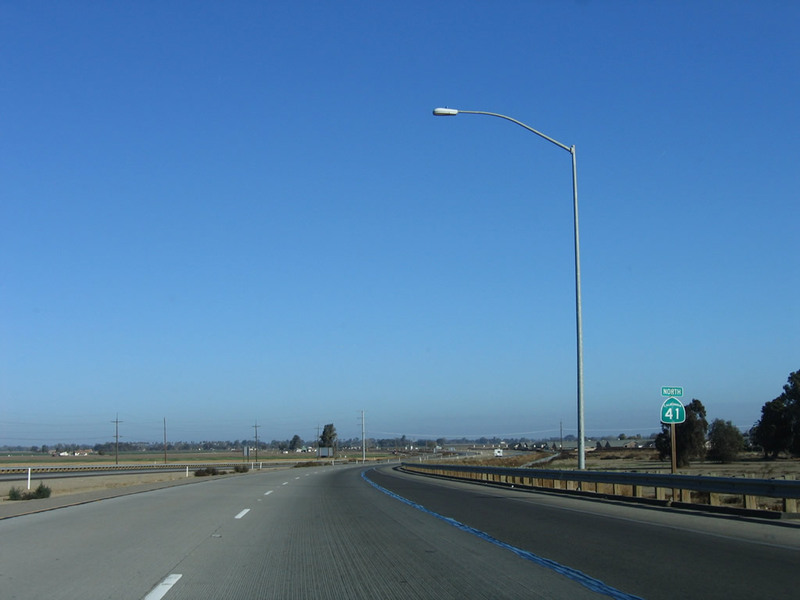 California 180 is a major east-west freeway that crosses the city of Fresno; the interchange between California 41 and California 180 was built in 1974. Photo taken 11/23/06. 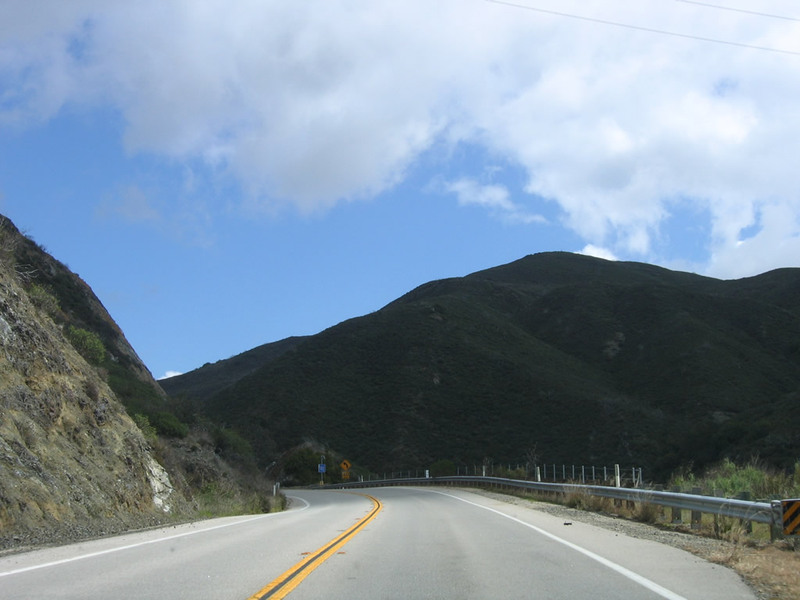 The next four exits from California 41 north are Exit 128A, California 180 (Sequoia-Kings Canyon Freeway) east to Kings Canyon National Park; Exit 128B, California 180 (Kings Canyon Freeway) west to Mendota; Exit 129, McKinley Avenue; and Exit 130, Shields Avenue. Photo taken 11/23/06. 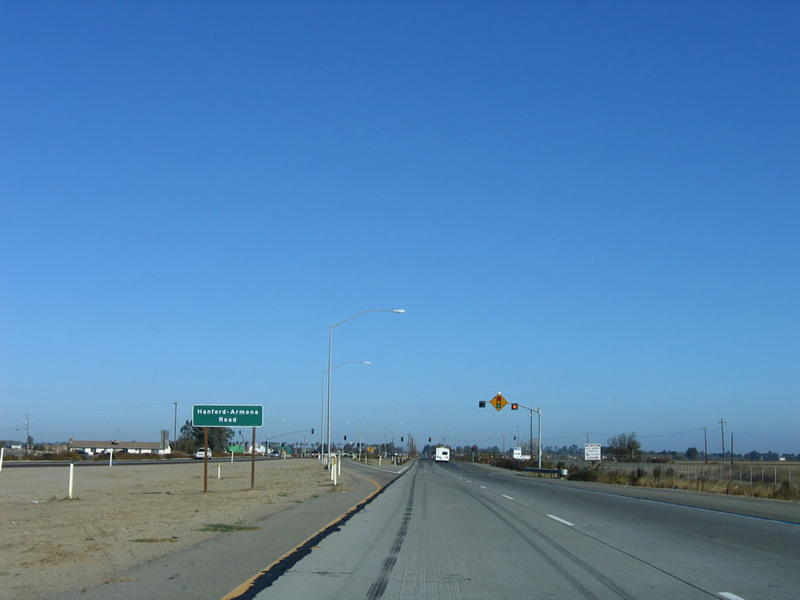 The right two lanes connect to California 180 east and west, while the left three lanes continue north on California 41 north to Yosemite National Park. 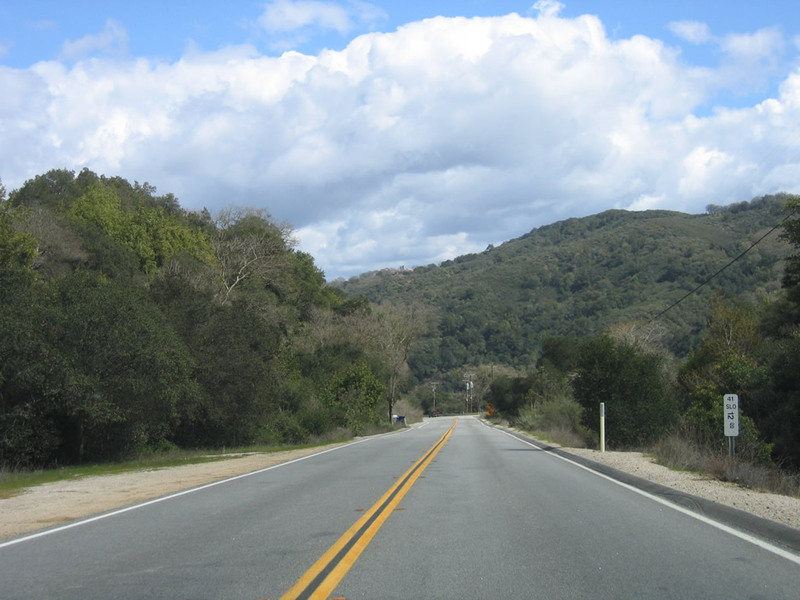 California 180 travels east to Kings Canyon National Park (Exit 128A) and west to Mendota (Exit 128B). 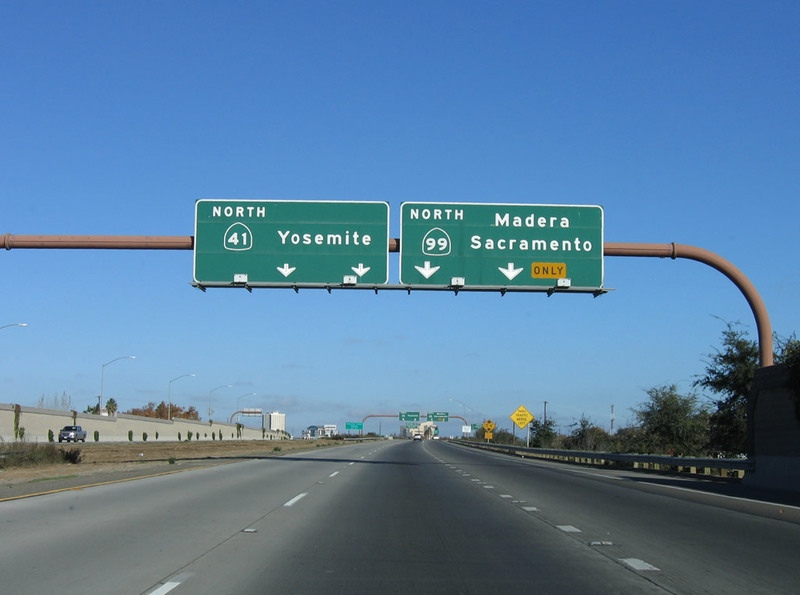 The control city for northbound California 41 (Eisenhower / Yosemite Freeway) is now Yosemite National Park. Photo taken 11/23/06. Northbound California 41 (Eisenhower / Yosemite Freeway) reaches Exit 128A, California 180 (Sequoia-Kings Canyon Freeway) east to Kings Canyon National Park. 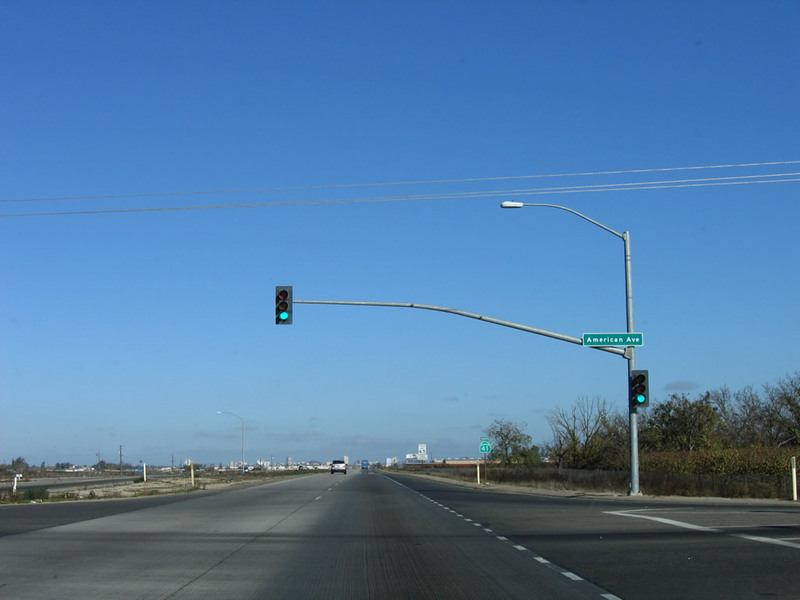 Use California 180 east to California 168 northeast to California State University at Fresno (CSUF). 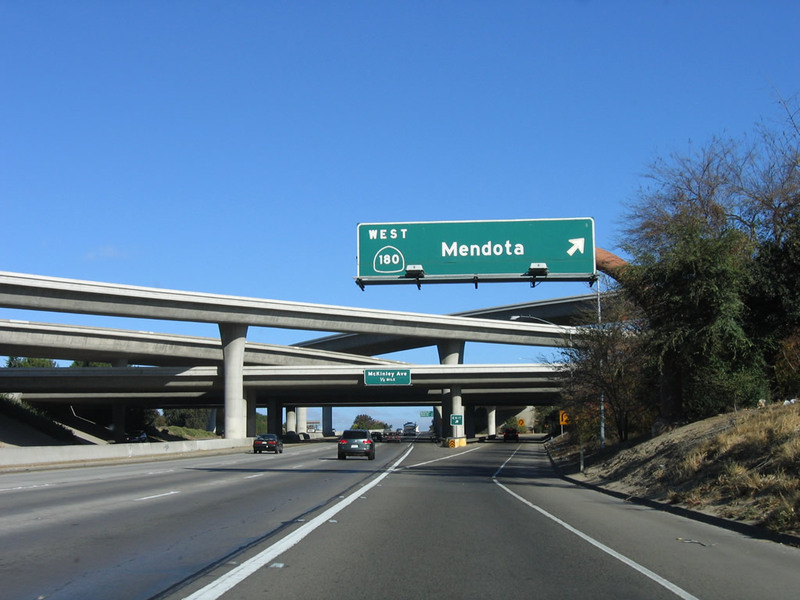 The next exit is for Exit 128B, California 180 (Kings Canyon Freeway) east to Mendota. 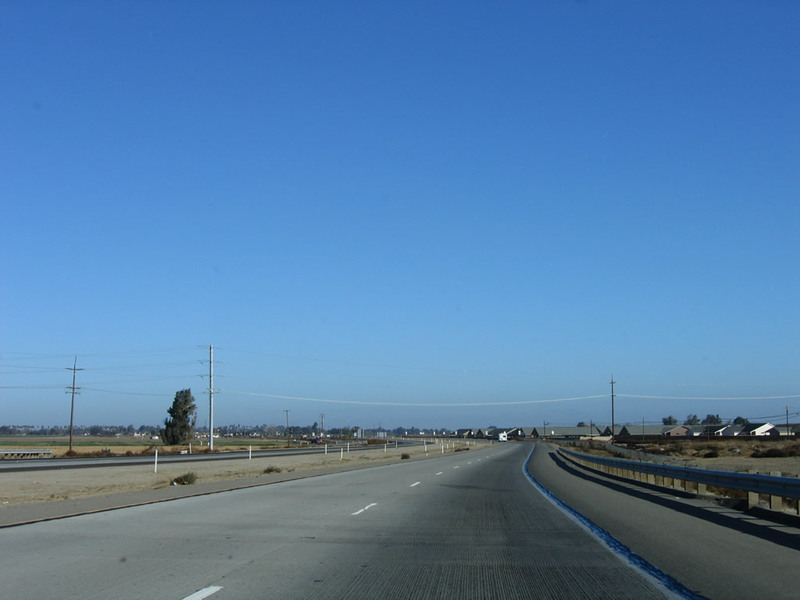 The California 180 freeway east of here was opened in the early 2000s and is slated for further extension east as development and traffic needs warrant. Photo taken 11/23/06. 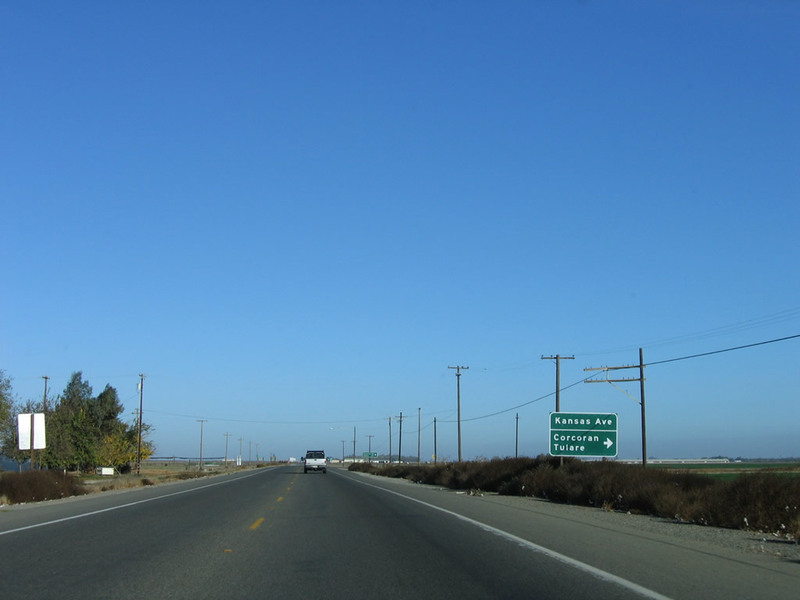 Immediately thereafter, northbound California 41 meets Exit 128B, California 180 (Sequoia-Kings Canyon Freeway) west to Mendota. 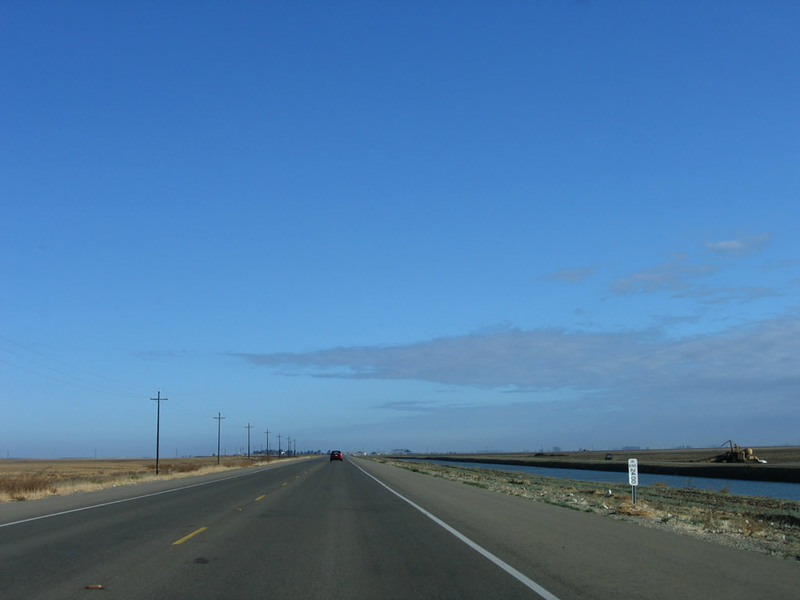 California 180 links with California 99 west of here, then eventually reverts to a conventional two-lane highway to Mendota. 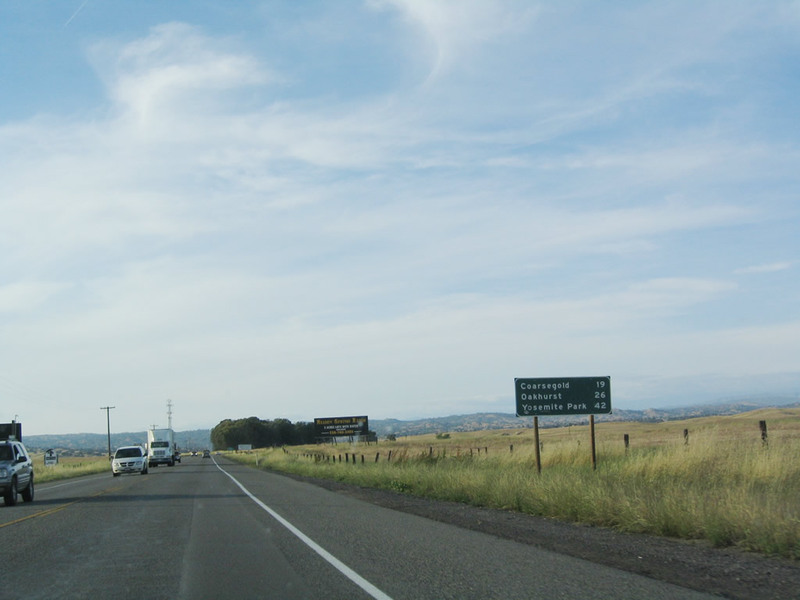 Plans call for an eventual extension of California 180 east to link with Interstate 5 in the future, perhaps as a two-lane facility or as an expressway. Photo taken 11/23/06. 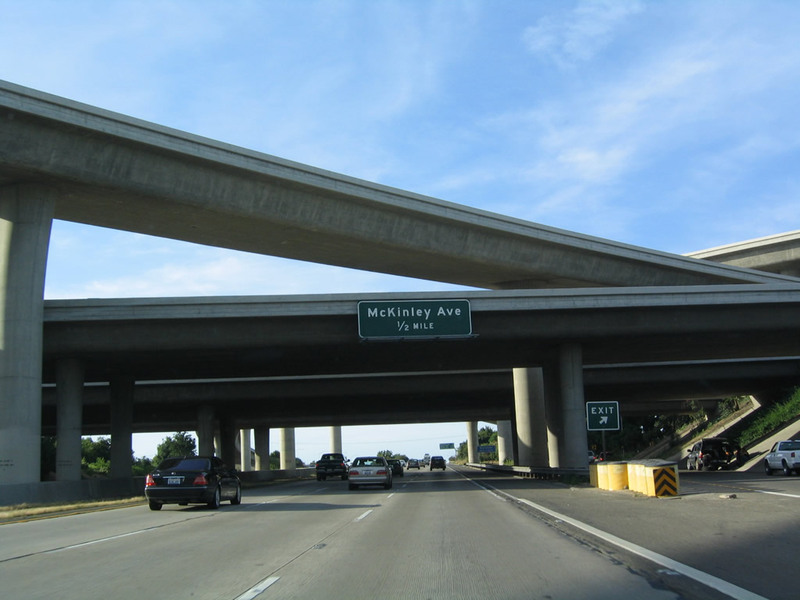 The next interchange along California 41 (Yosemite Freeway) is Exit 129, McKinley Avenue (one-half mile). 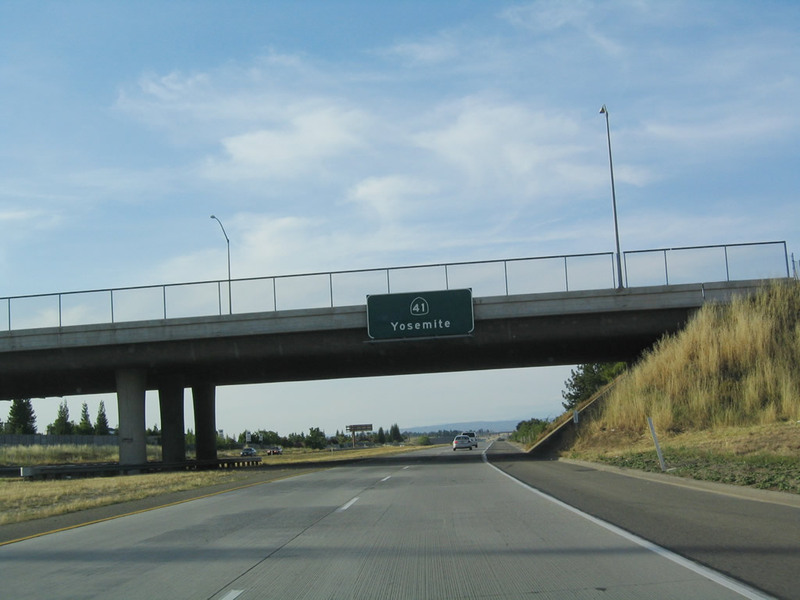 The freeway passes under the California 180 stack interchange. 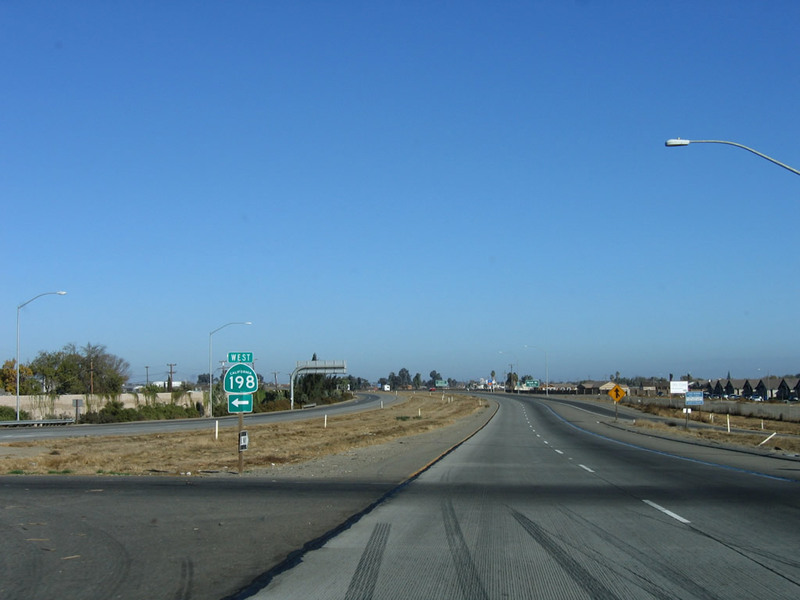 The section of California 41 north between California 180 and Herndon Avenue was constructed in 1982. Photo taken 05/13/05. 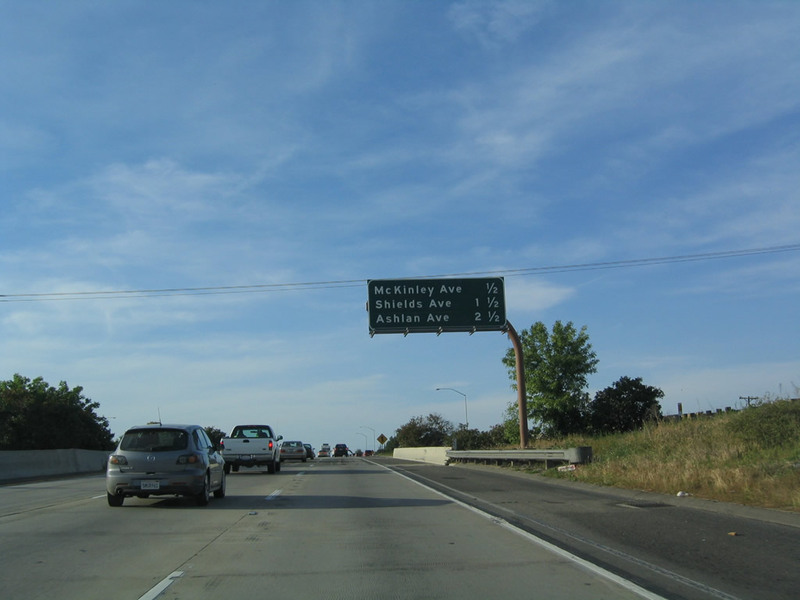 This mileage sign provides the distance to the next three interchanges along California 41 (Eisenhower / Yosemite Freeway): Exit 129, McKinley Avenue; Exit 130, Shields Avenue; and Exit 131, Ashlan Avenue. Photo taken 05/13/05. 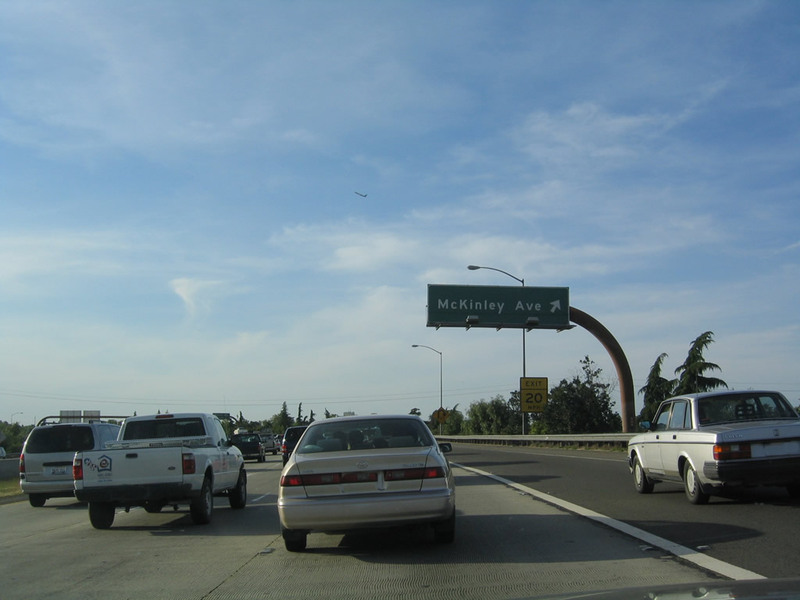 The right lane of northbound California 41 (Eisenhower / Yosemite Freeway) becomes exit only for Exit 129, McKinley Avenue. Photo taken 05/13/05. 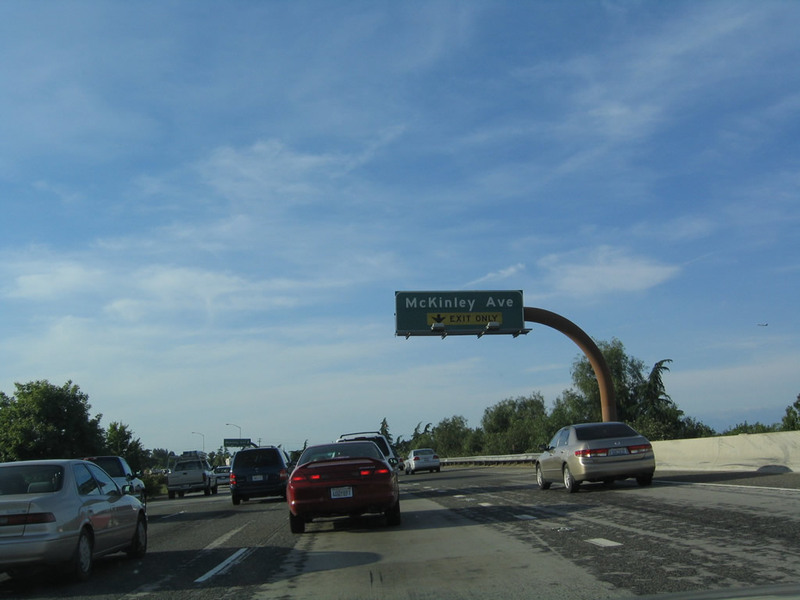 Northbound California 41 (Eisenhower / Yosemite Freeway) reaches Exit 129, McKinley Avenue. Photo taken 05/13/05. 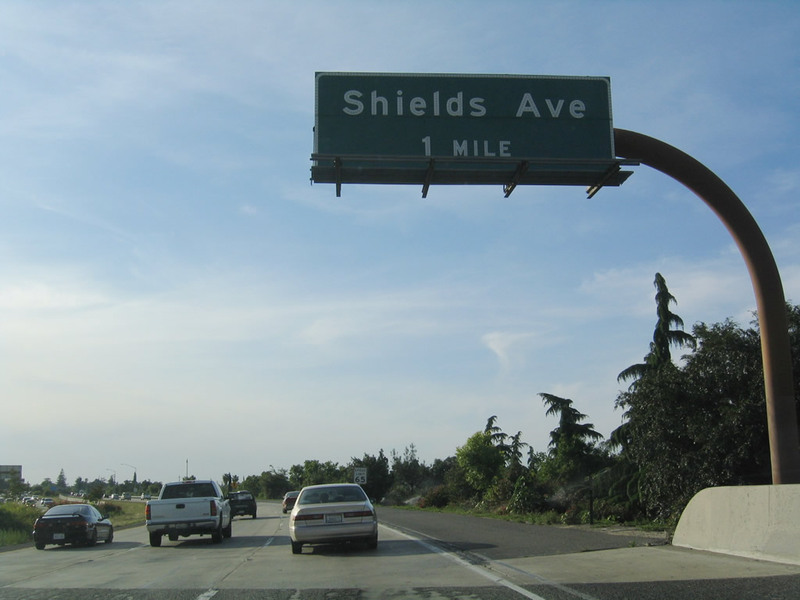 The next interchange along California 41 (Yosemite Freeway) is Exit 130, Shields Avenue (one mile). Photo taken 05/13/05. 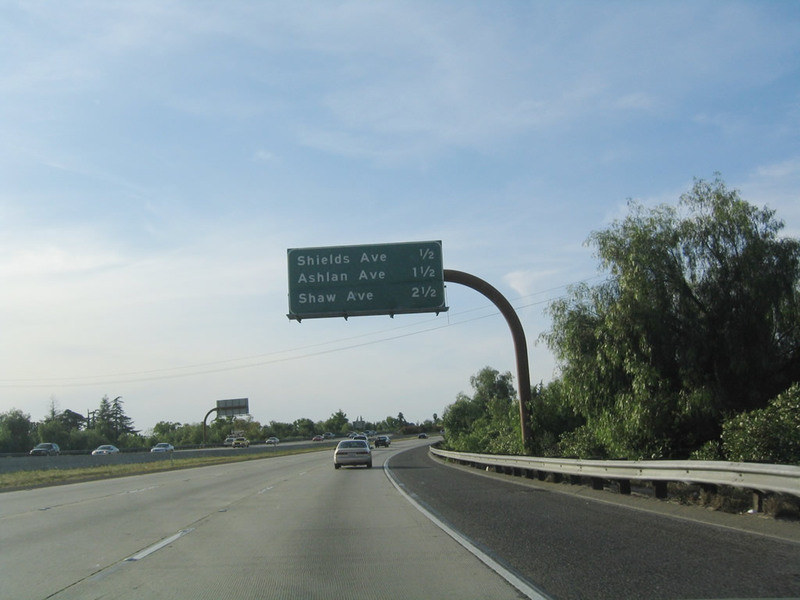 This mileage sign provides the distance to the next three interchanges along California 41 (Eisenhower / Yosemite Freeway): Exit 130, Shields Avenue; Exit 131, Ashlan Avenue; and Exit 132, Shaw Avenue (former California 168). Photo taken 05/13/05. 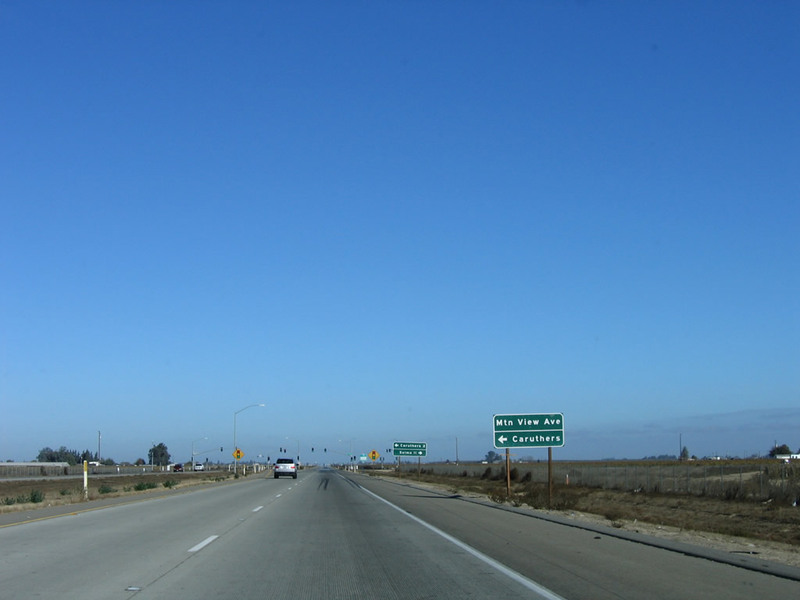 Northbound California 41 (Eisenhower / Yosemite Freeway) reaches Exit 130, Shields Avenue. Photo taken 05/13/05. 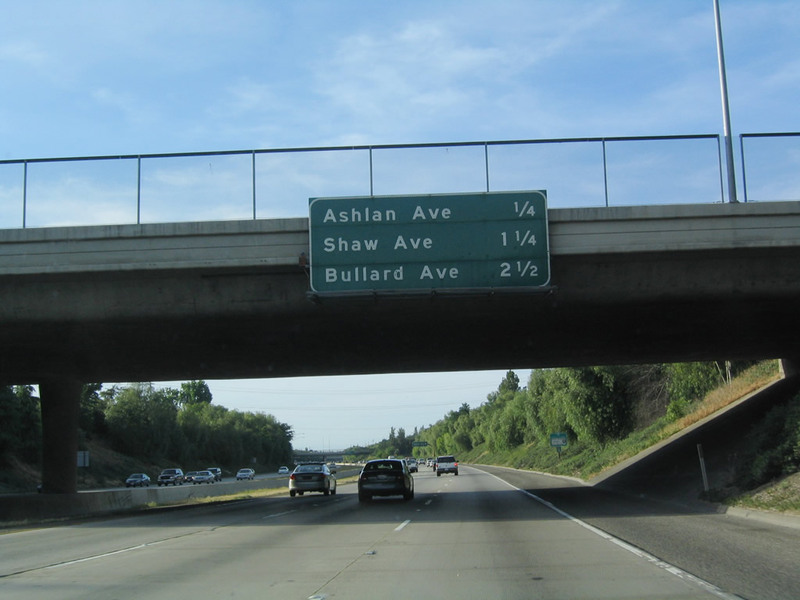 This mileage sign provides the distance to the next three interchanges along California 41 (Eisenhower / Yosemite Freeway): Exit 131, Ashlan Avenue; Exit 132, Shaw Avenue (former California 168); and Exit 133, Bullard Avenue. Photo taken 05/13/05. 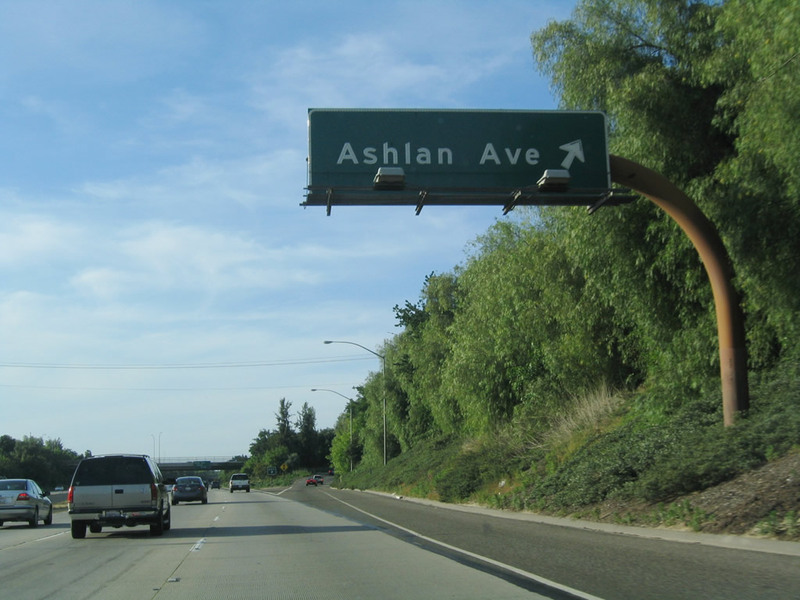 Northbound California 41 (Eisenhower / Yosemite Freeway) reaches Exit 131, Ashlan Avenue. Photo taken 05/13/05. 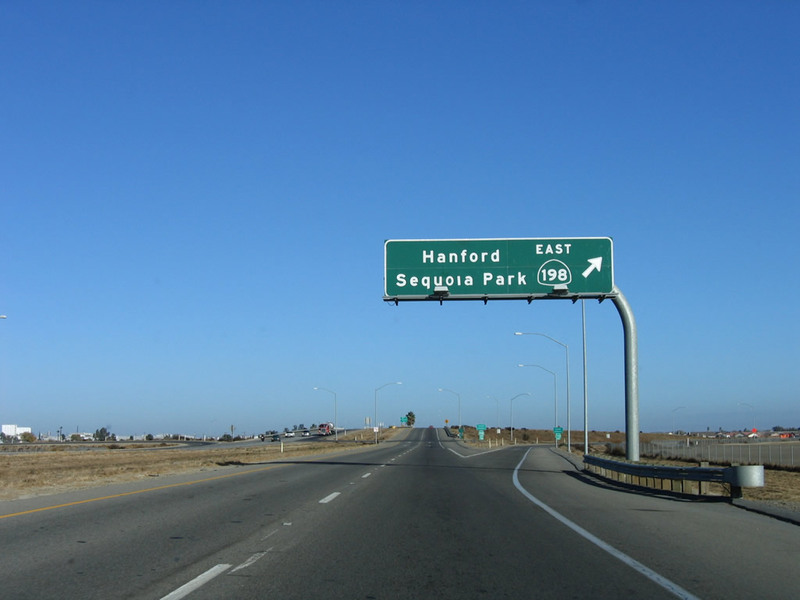 The next interchange along California 41 (Yosemite Freeway) is Exit 132, Shaw Avenue (former California 168). Use Shaw Avenue east to California State University at Fresno and Clovis. Photo taken 05/13/05. 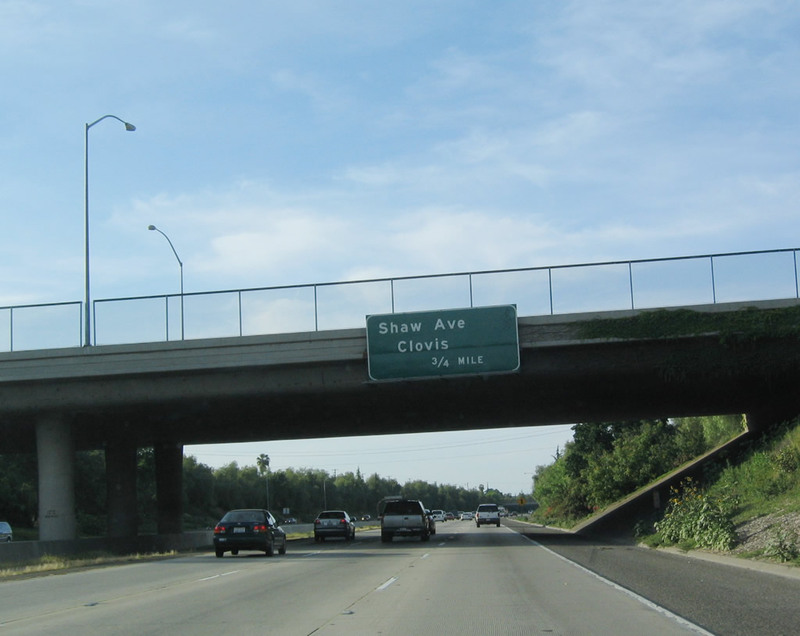 Northbound California 41 (Eisenhower / Yosemite Freeway) reaches Exit 132, Shaw Avenue east to Clovis. 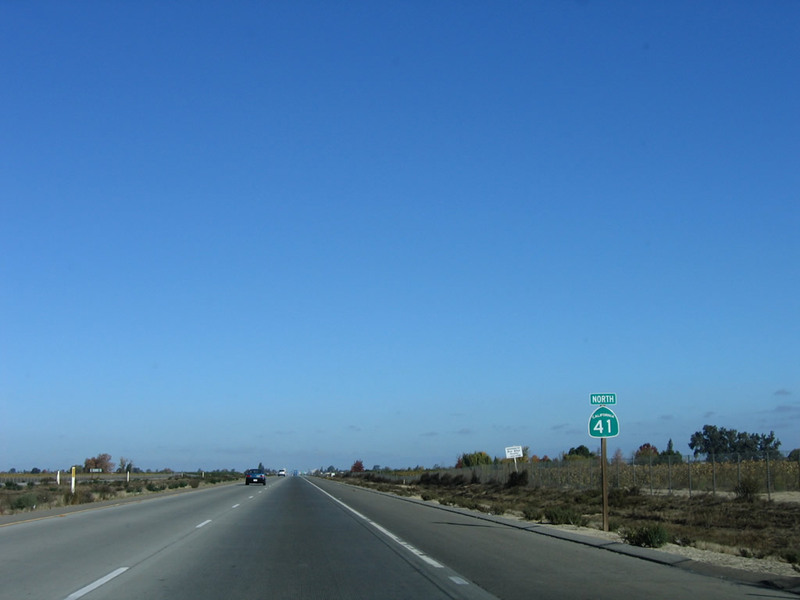 With the construction of the Sierra Freeway, California 168 now begins at California 180 near the airport and travels northeast as a freeway to the California State University at Fresno. Photo taken 05/13/05. 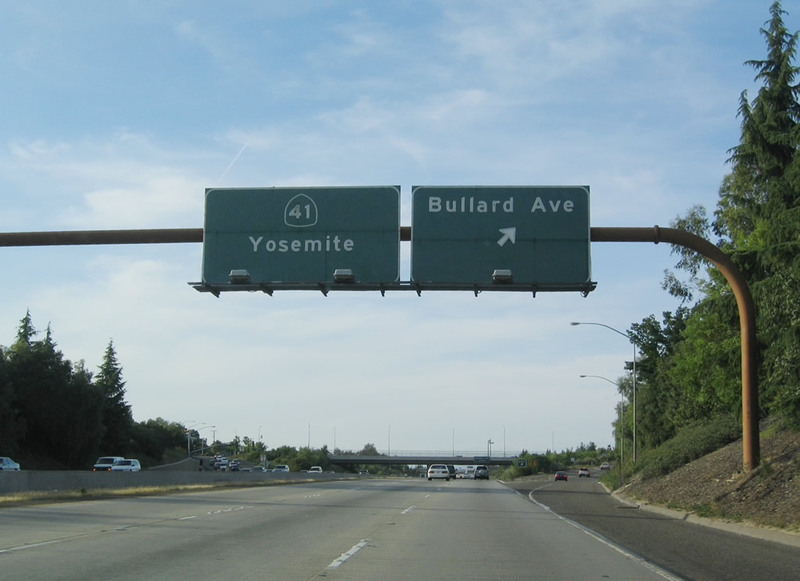 The next interchange along California 41 (Yosemite Freeway) is Exit 133, Bullard Avenue (one mile). Photo taken 05/13/05. 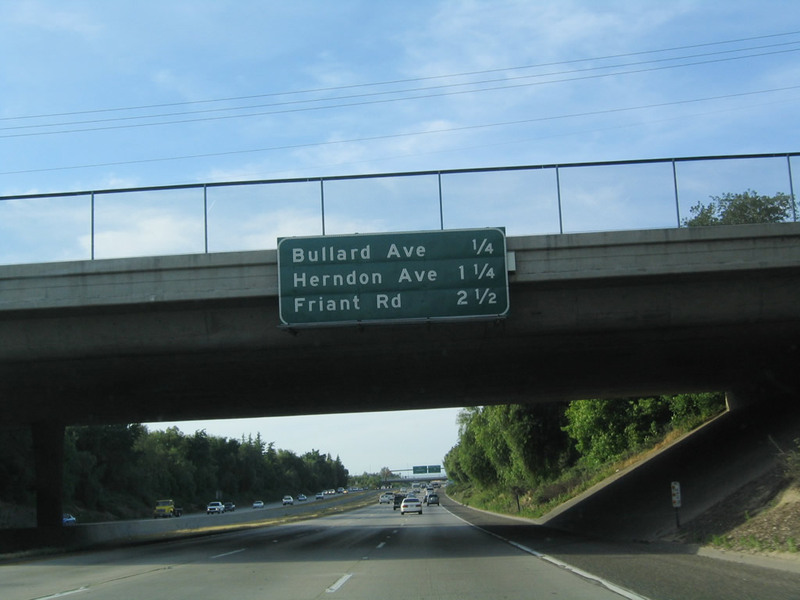 This mileage sign provides the distance to the next three interchanges along California 41 (Eisenhower / Yosemite Freeway): Exit 133, Bullard Avenue; Exit 134, Herndon Avenue; and Exit 135, Friant Road. Photo taken 05/13/05. 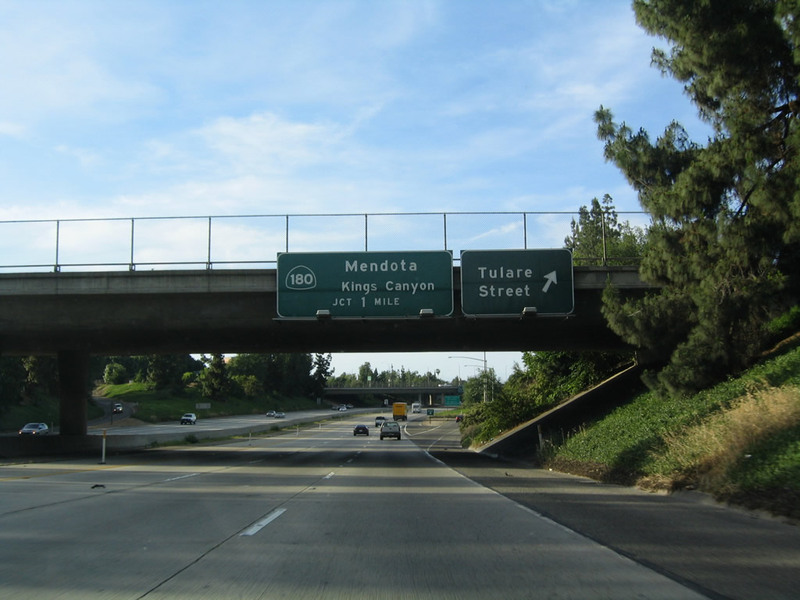 Northbound California 41 (Eisenhower / Yosemite Freeway) reaches Exit 133, Bullard Avenue. Photo taken 05/13/05. 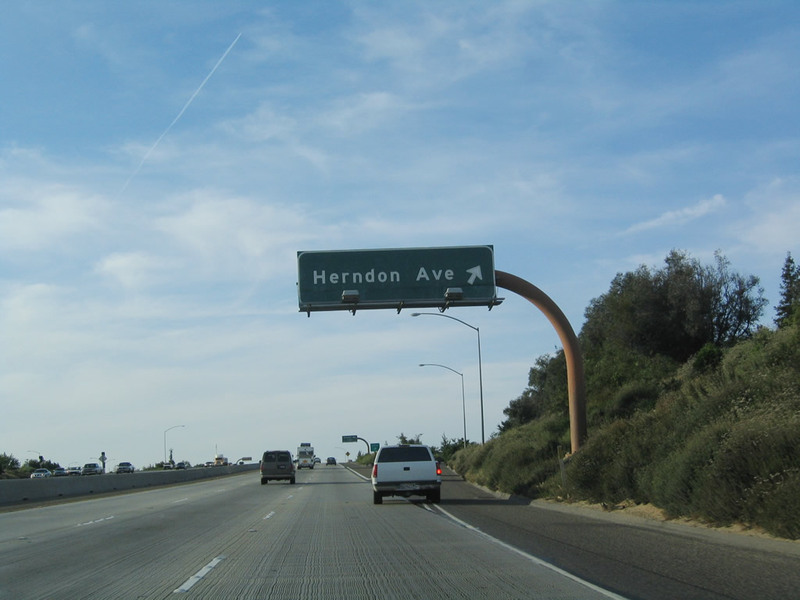 The next interchange along California 41 (Yosemite Freeway) is Exit 134, Herndon Avenue (0.75 mile). Photo taken 05/13/05. 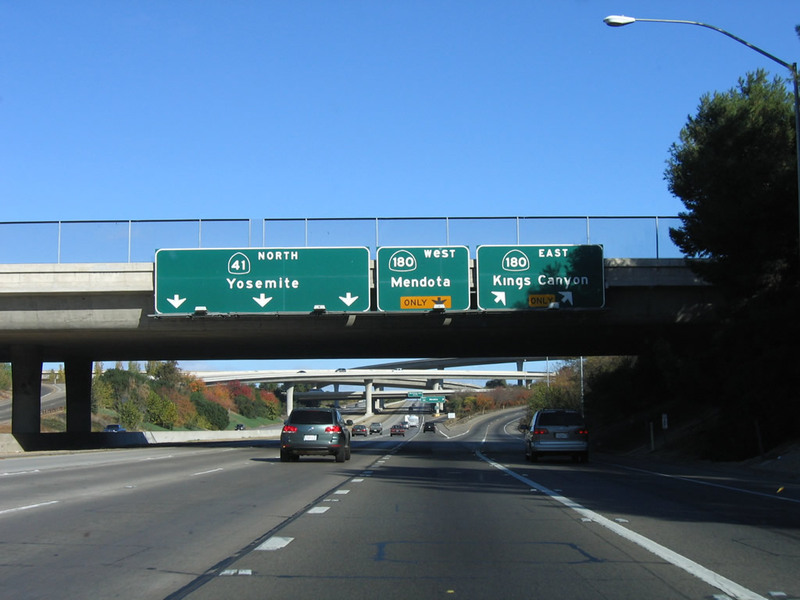 Northbound California 41 (Eisenhower / Yosemite Freeway) reaches Exit 134, Herndon Avenue. 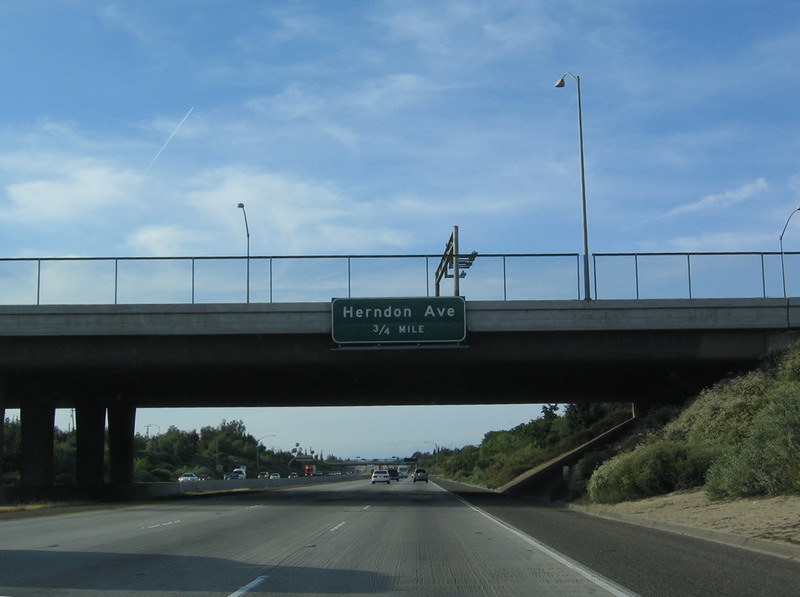 Ahead, the section of California 41 freeway between Herndon Avenue and Audubon Drive was built in 1988-1989. Photo taken 05/13/05. 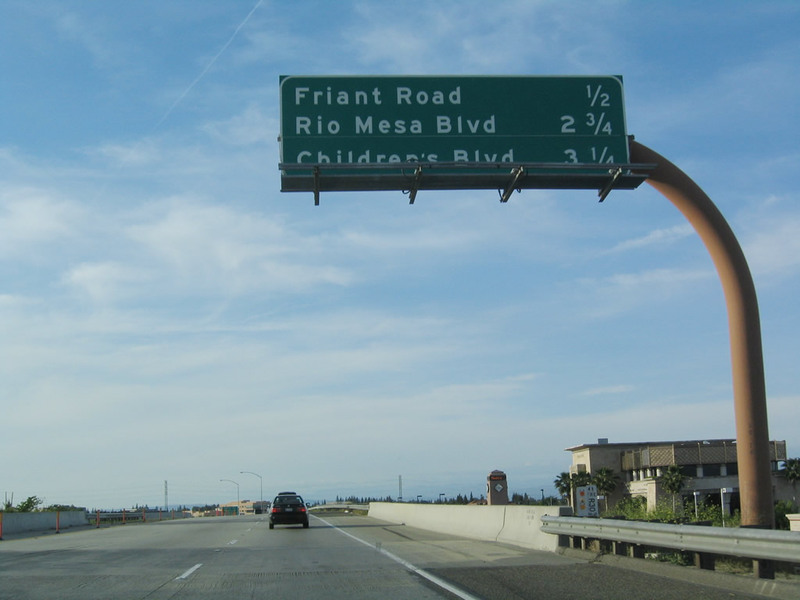 This mileage sign provides the distance to the next three interchanges along California 41 (Eisenhower / Yosemite Freeway): Exit 135, Friant Road and Blackstone Avenue; Exit 138A, Rio Mesa Boulevard; and Exit 138B, Children&apos; Boulevard. Photo taken 05/13/05. 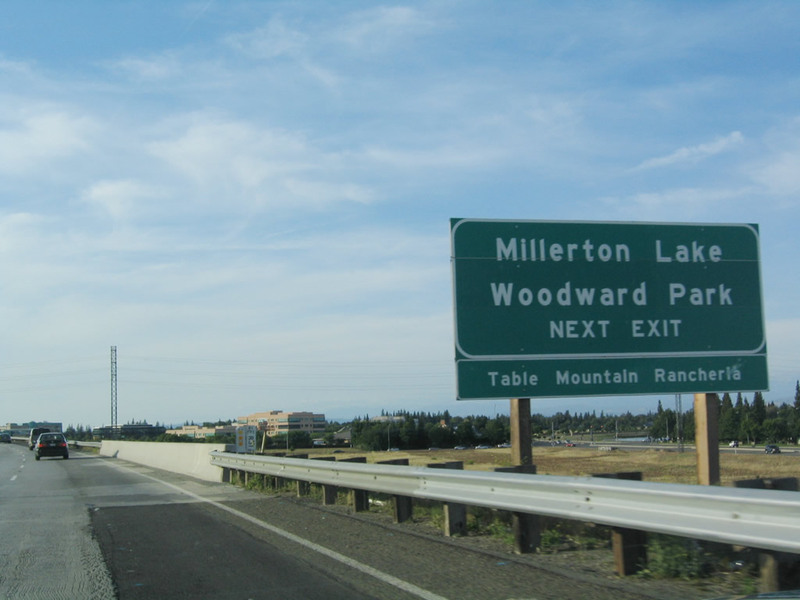 Use Exit 135 to Friant Road north to Millerton Lake and Woodward Park. Photo taken 05/13/05. 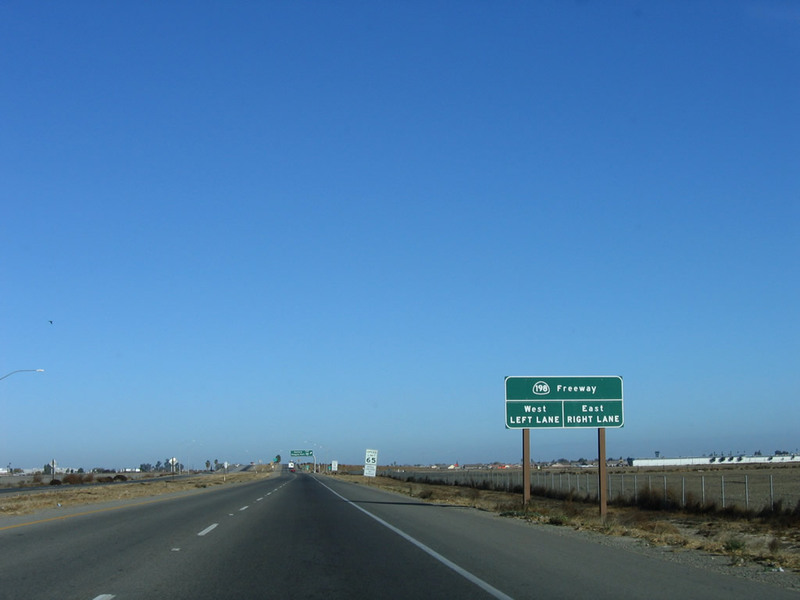 Northbound California 41 (Eisenhower / Yosemite Freeway) reaches Exit 135, Friant Road north and Blackstone Avenue south. 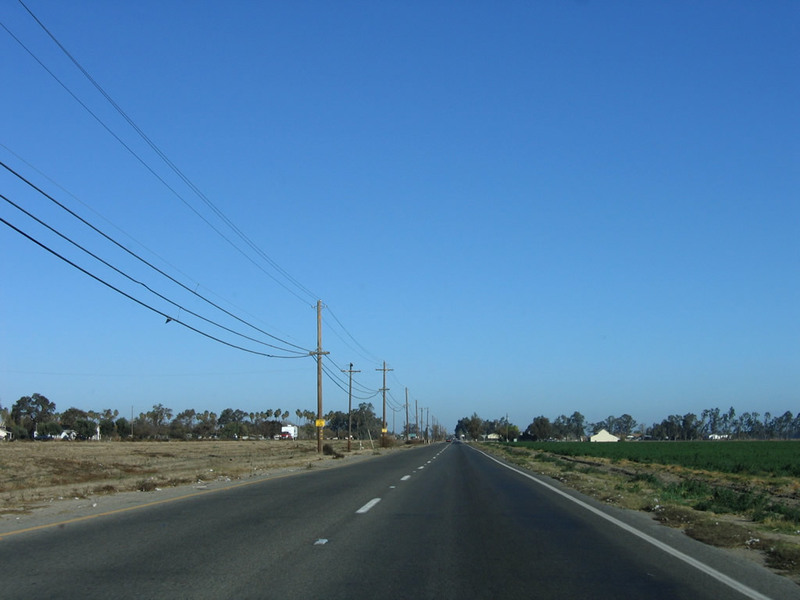 Blackstone Avenue is the old alignment of California 41 leading into Fresno from the north. Photo taken 05/13/05. 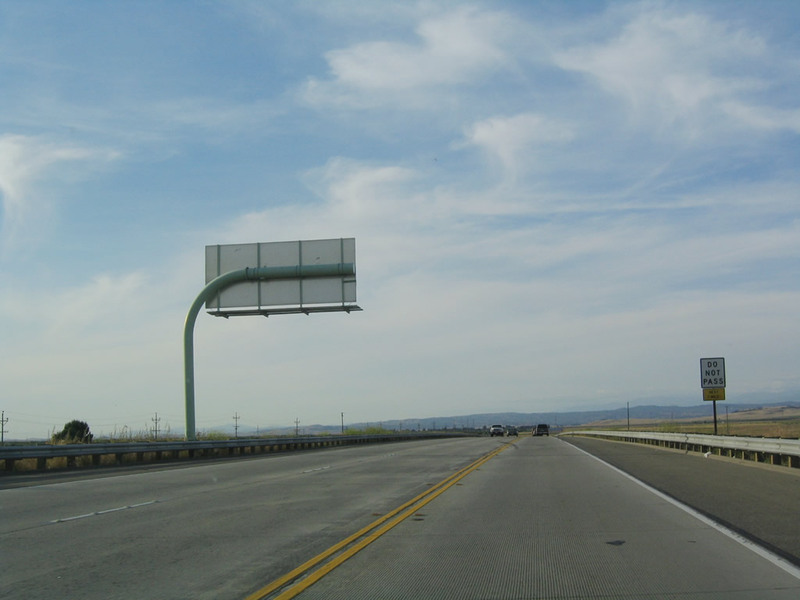 An overhead pull-through sign for California 41 (Eisenhower / Yosemite Freeway) north is posted on the Audubon Drive overpass. The control city remains "Yosemite." 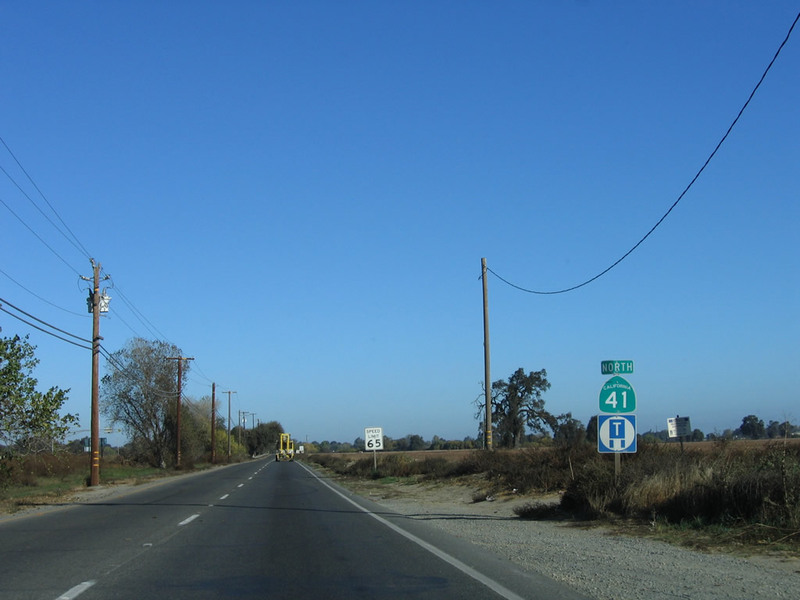 Soon thereafter, California 41 crosses the San Joaquin River, leaves the city and county of Fresno and enters Madera County. Photo taken 05/13/05. 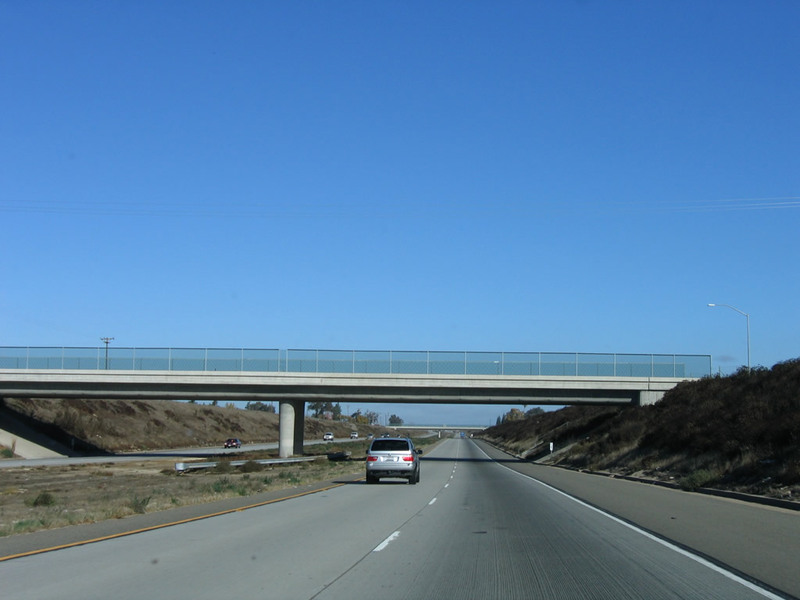 California 41 (Eisenhower / Yosemite Freeway) reduces to two northbound lanes. Photo taken 05/13/05. 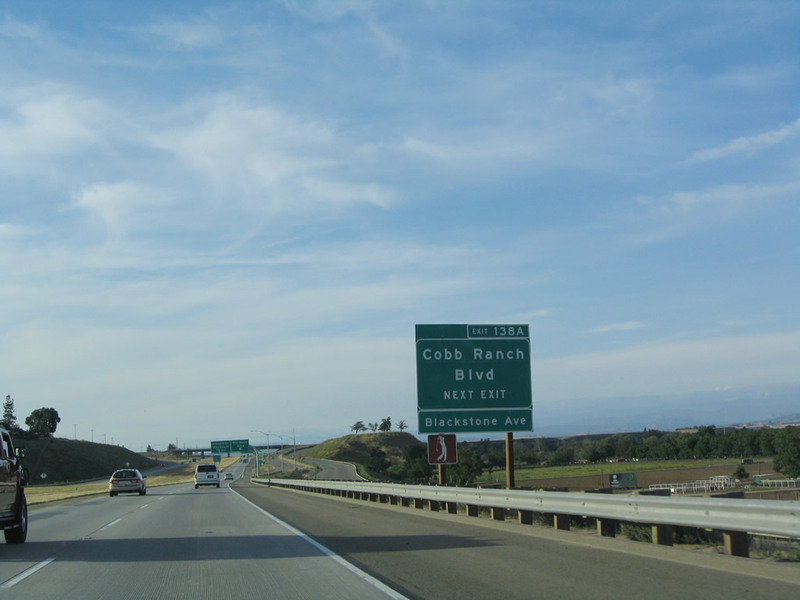 The next exit along California 41 (Yosemite Freeway) north is Exit 138A, Rio Mesa Boulevard and Cobb Ranch Boulevard. 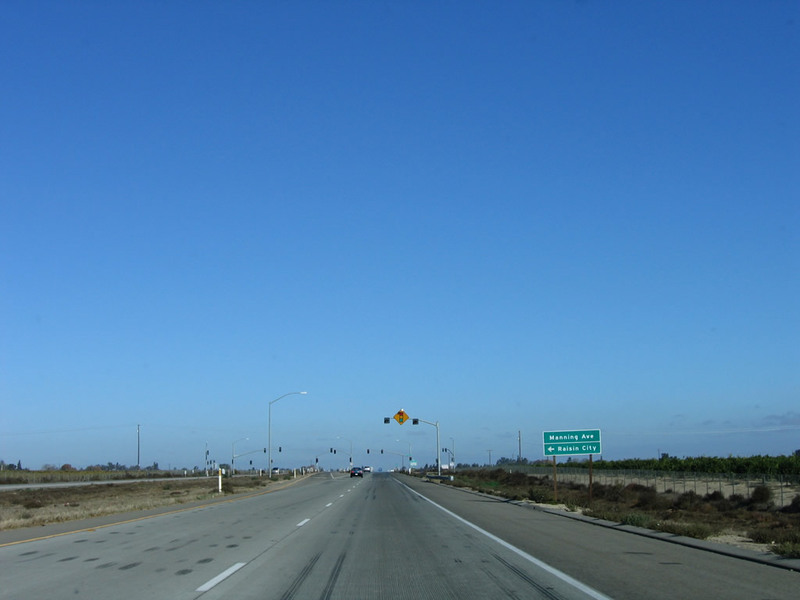 This interchange was built in 1999 and is the last interchange along northbound California 41, pending future development and traffic needs. Photo taken 05/13/05. 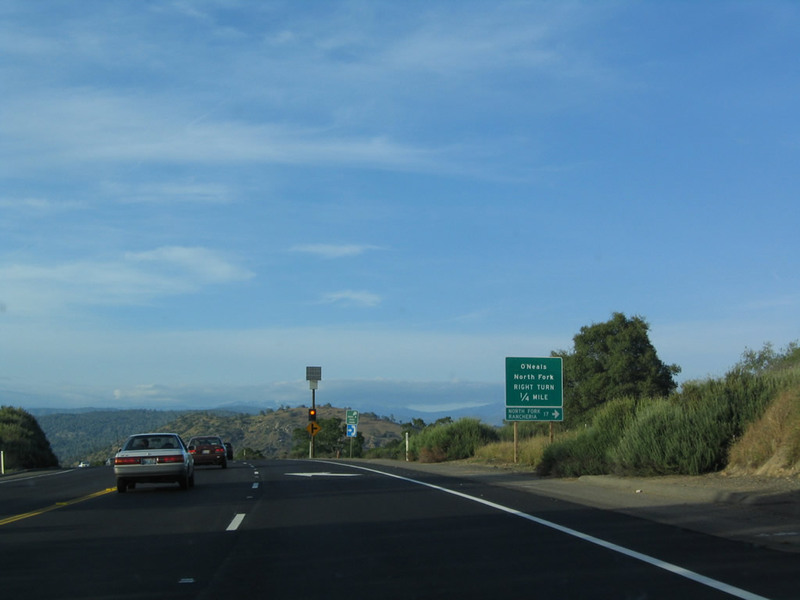 Northbound California 41 (Yosemite Freeway) reaches Exit 138A, Rio Mesa Boulevard and Cobb Ranch Boulevard. 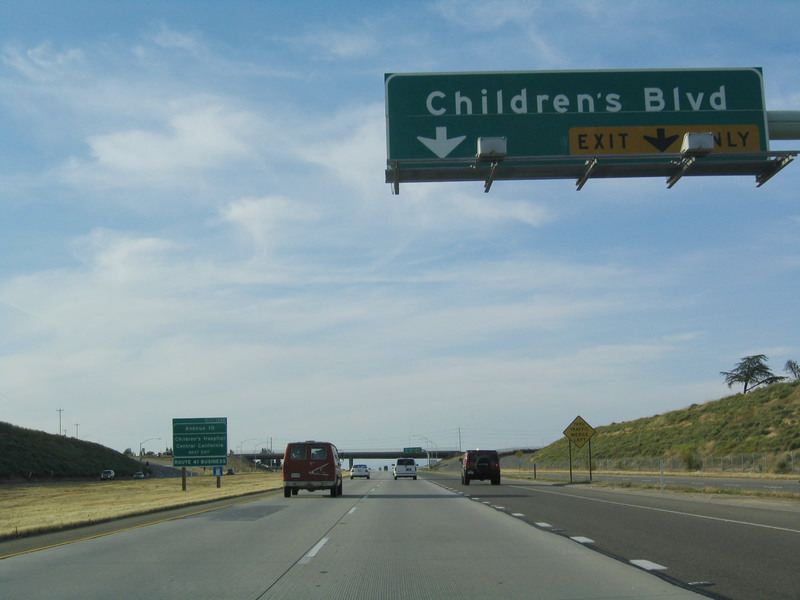 The final northbound exit from California 41 north is with Exit 138B, Children&apos; Boulevard southwest to Children&apos; Hospital of Central California. Photo taken 05/13/05. The right two lanes connect to Exit 138B, Children&apos; Boulevard southwest to the Children&apos; Hospital and Avenue 9 west to Gregg (with a connection to California 99). 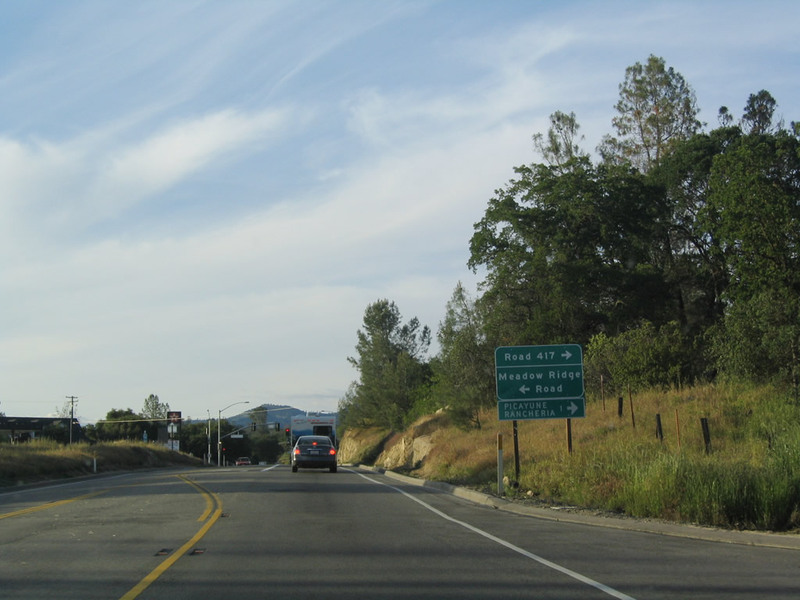 Use Exit 138B, Children&apos; Boulevard west to California 41 Business/Avenue 10 north to Rolling Hills. Photo taken 05/13/05. 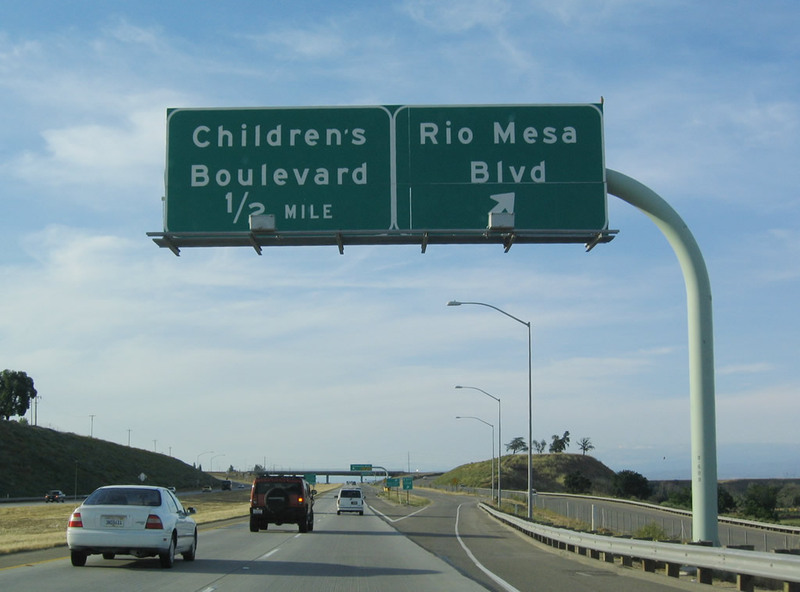 Northbound California 41 reaches Exit 138B, Children&apos; Boulevard west to the Children&apos; Hospital and California 41 Business/Avenue 10 north to Rolling Hills. 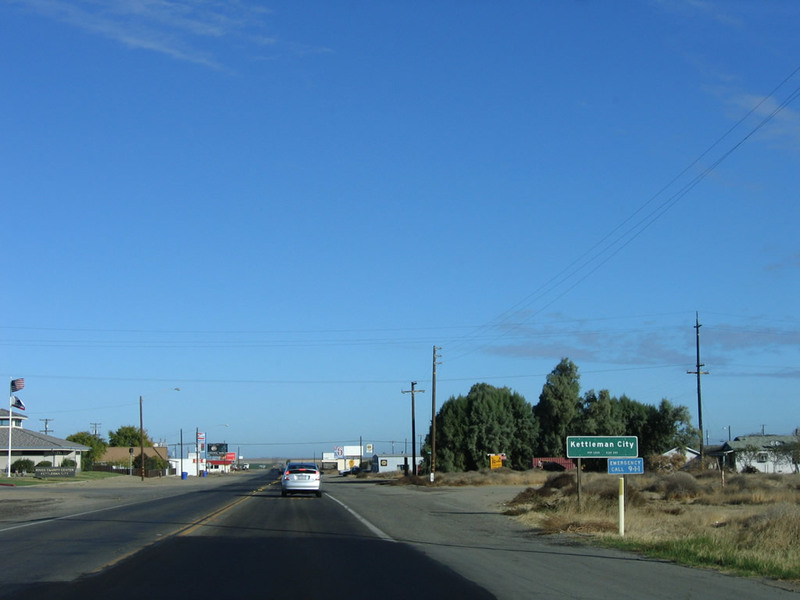 The business route will return to California 41 at the Avenue 12 intersection, about two miles north of here. Photo taken 05/13/05. 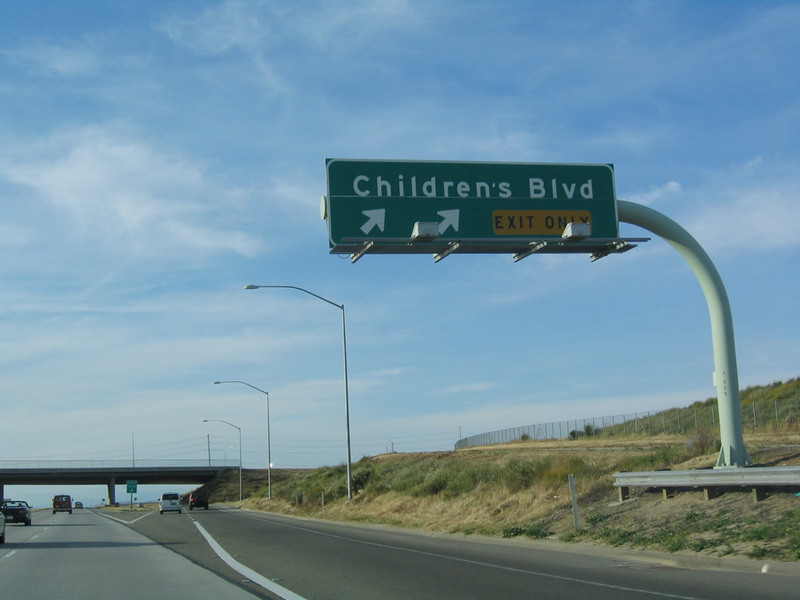 The California 41 freeway finally comes to an end after Children&apos; Boulevard. Photo taken 05/13/05. 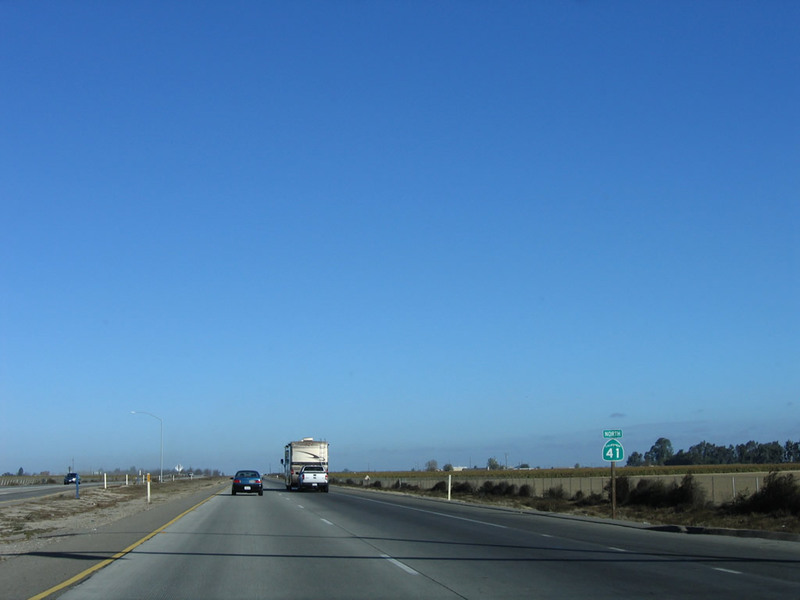 California 41 reverts to a two-lane controlled access freeway (Super Two) with no center median. Photo taken 05/13/05. 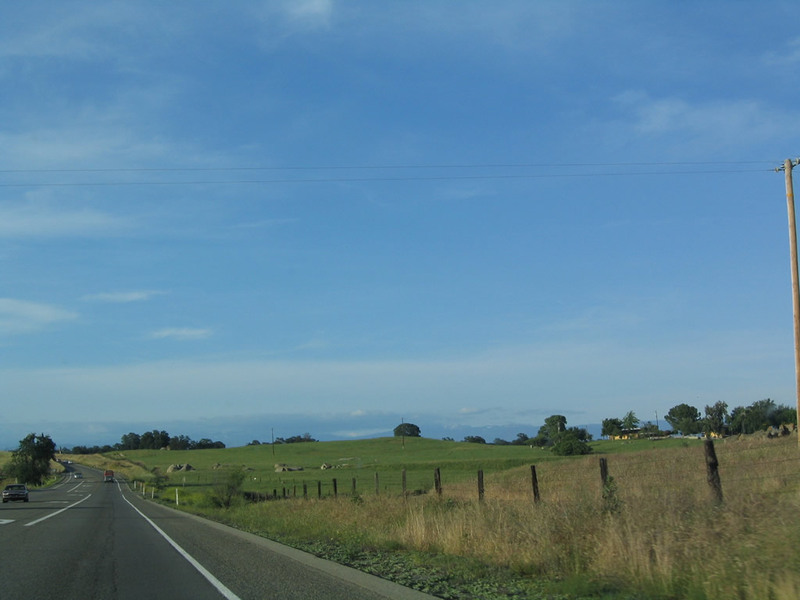 This segment of state highway has no passing lanes but would be easily upgradeable to full freeway standards if needed. Photo taken 05/13/05. 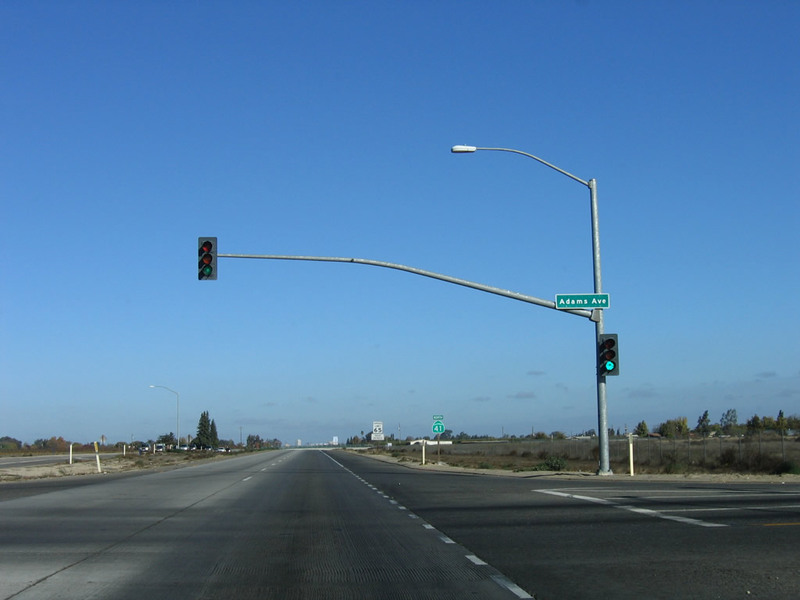 The first traffic signal on this northern stretch of California 41 is with Avenue 12 west to California 41 Business/Avenue 10 south to Rolling Hills. Photo taken 05/13/05. 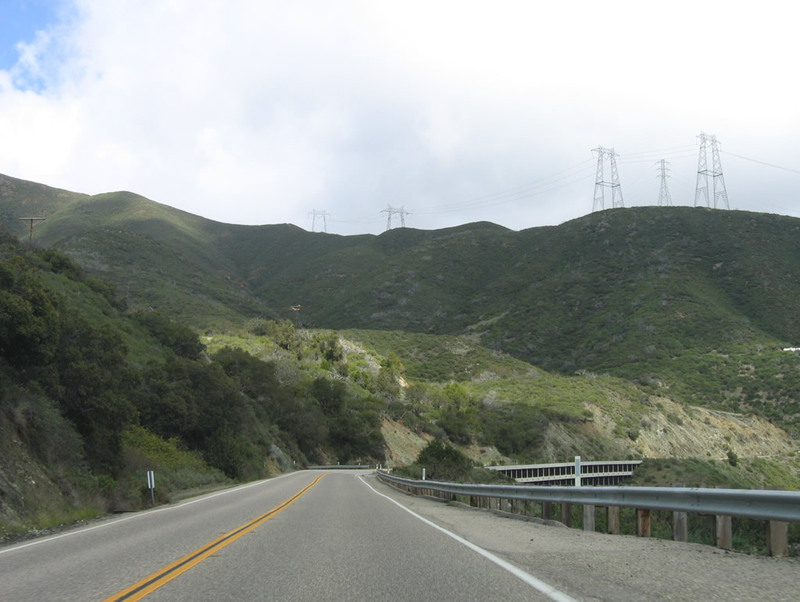 A set of Pacific Gas & Electric power transmission lines pass over California 41 shortly thereafter. Photo taken 05/13/05. 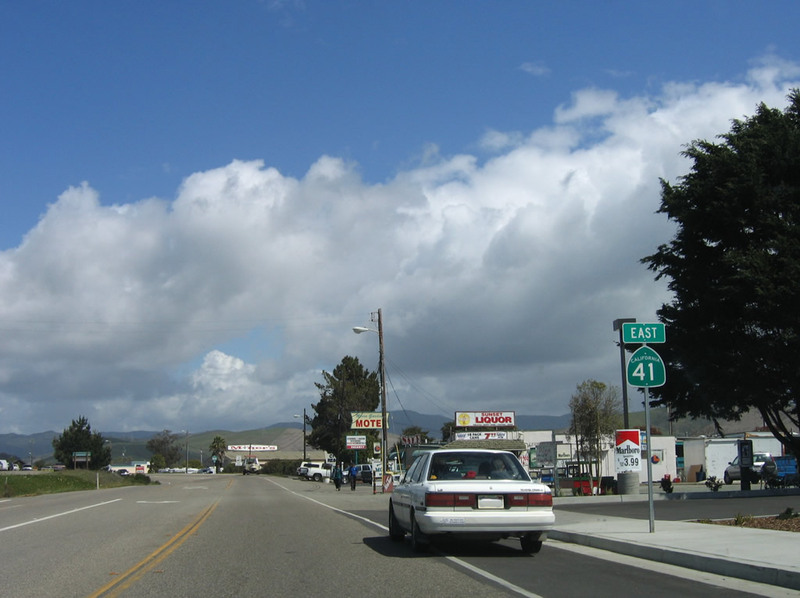 Northbound California 41 approaches Avenue 14. Photo taken 05/13/05. 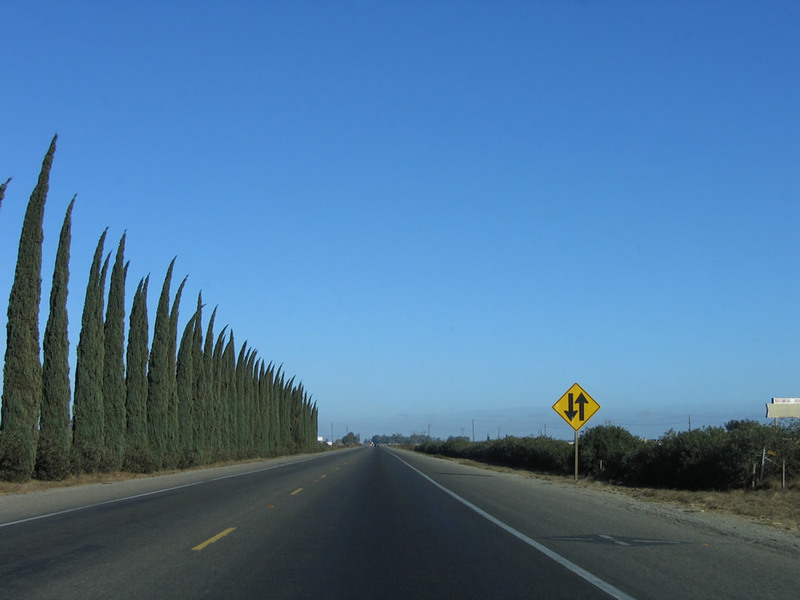 A vineyard lines the east side of California 41, which aims due north toward Yosemite National Park. Photo taken 05/13/05. 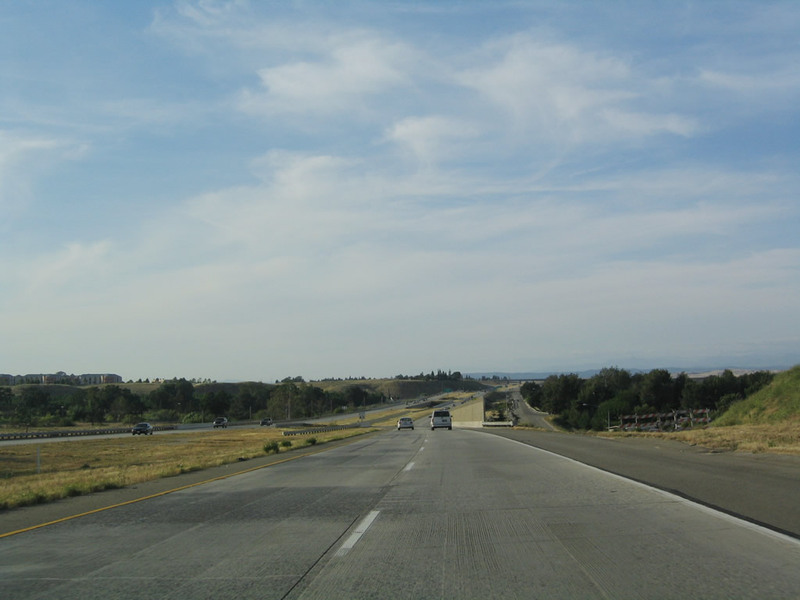 California 41 carries a fair amount of traffic on its two-lane segment. Photo taken 05/13/05. Soon thereafter, California 41 crosses the Madera Canal. Photo taken 05/13/05. 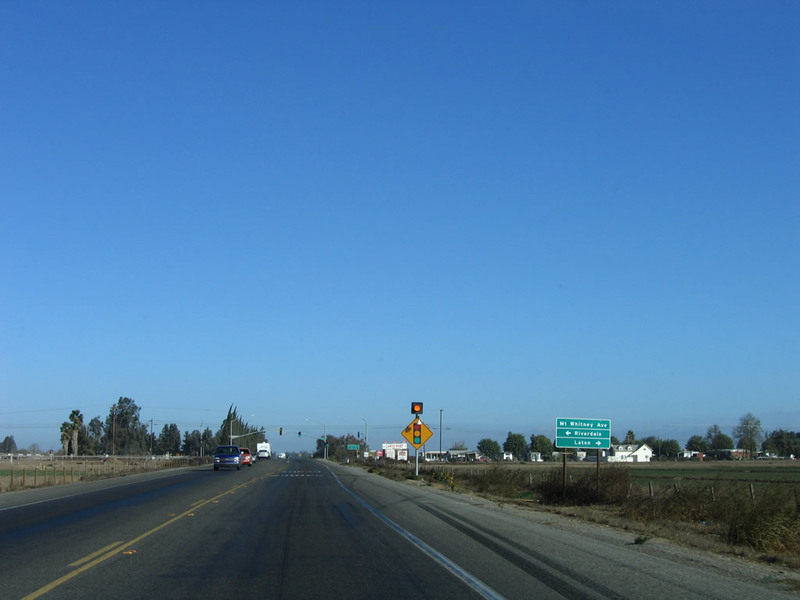 The next signalized intersection along California 41 north is with California 145 west to Madera on the California 99 corridor. Photo taken 05/13/05. 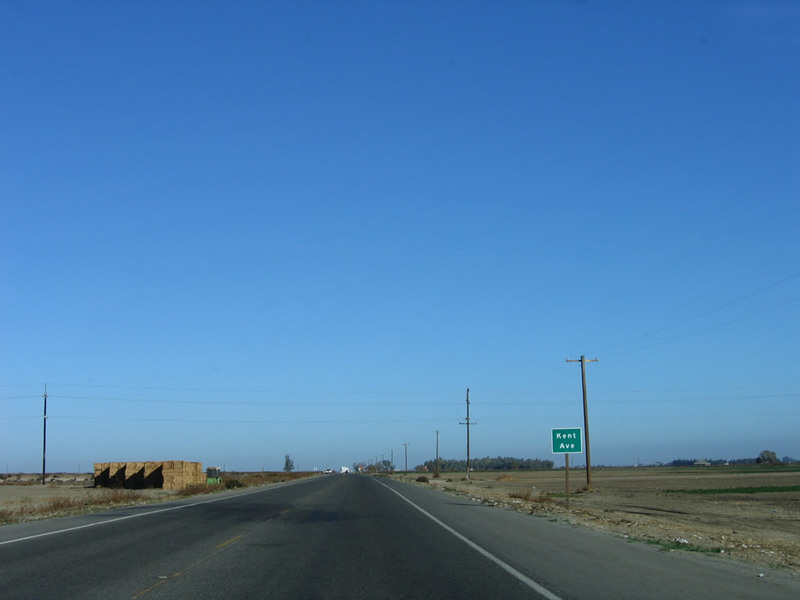 California 145 travels west to Madera, then turns south to Kerman and Huron. Photo taken 05/13/05. 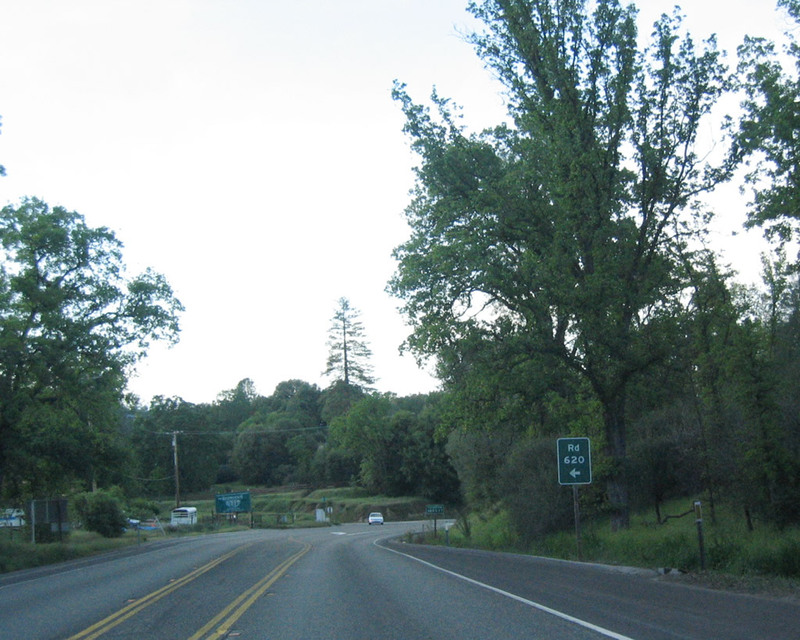 This mileage sign, posted after the California 145 intersection, provides the distance to Coarsegold (19 miles), Oakhurst (26 miles), and Yosemite National Park (42 miles) via California 41 north. Photo taken 05/13/05. 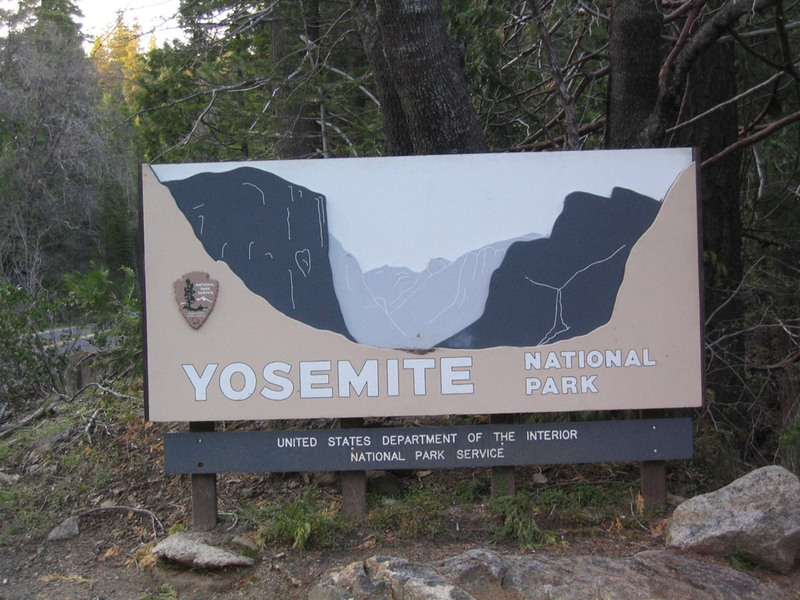 Commercial vehicles are prohibited through Yosemite National Park. Through commercial traffic should bypass the park by way of California 145 west to California 99 north. Photo taken 05/13/05. 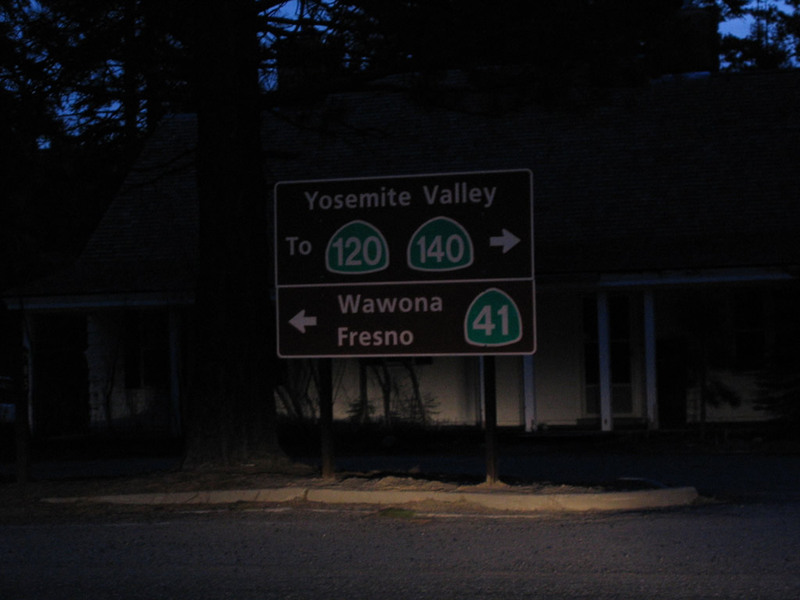 California 41 is the Southern Yosemite Highway. Photo taken 05/13/05. 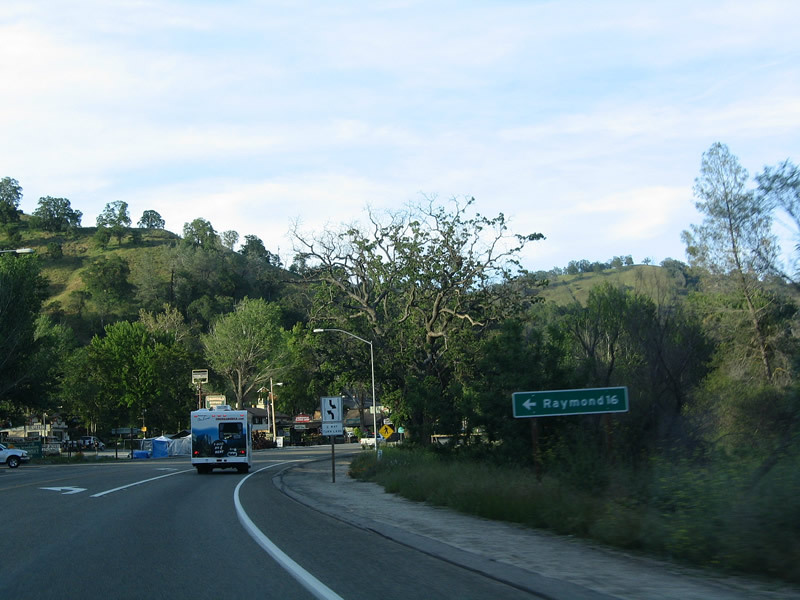 California 41 enters the Sierra Nevada foothills and starts to gain elevation. Occasional passing lanes allow for faster traffic to pass. Photos taken 05/13/05. 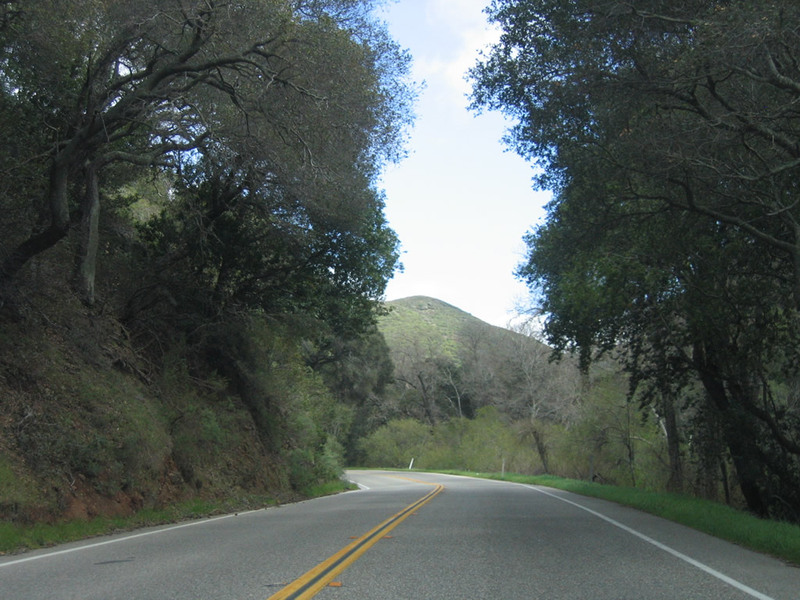 Northbound California 41 approaches Road 200 (North Fork Road) east to the Sierra Vista National Scenic Byway. 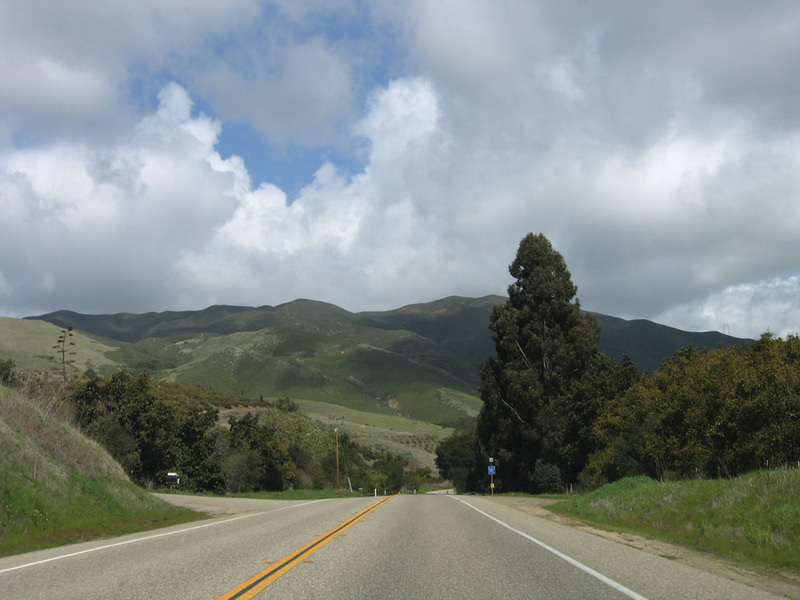 Visit the link to see the map to the scenic byway, which offers stunning views of High Sierra scenery. Photo taken 05/13/05. 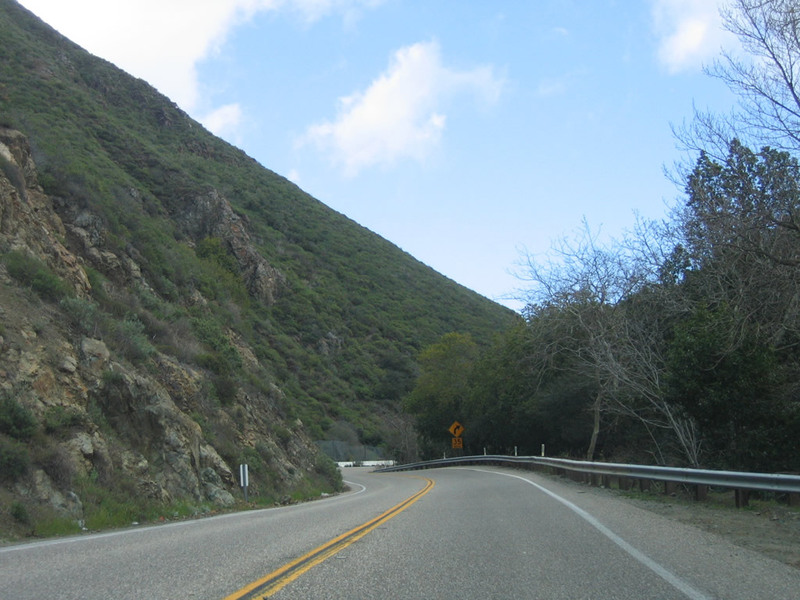 Northbound California 41 meets Road 200 (North Fork Road) east to O&apos;Neals, North Fork, and Sierra Vista National Scenic Byway. Photo taken 05/13/05. Skipping ahead, California 41 approaches Meadow Ridge Road and Road 417 (Picayune Road). Photo taken 05/13/05. 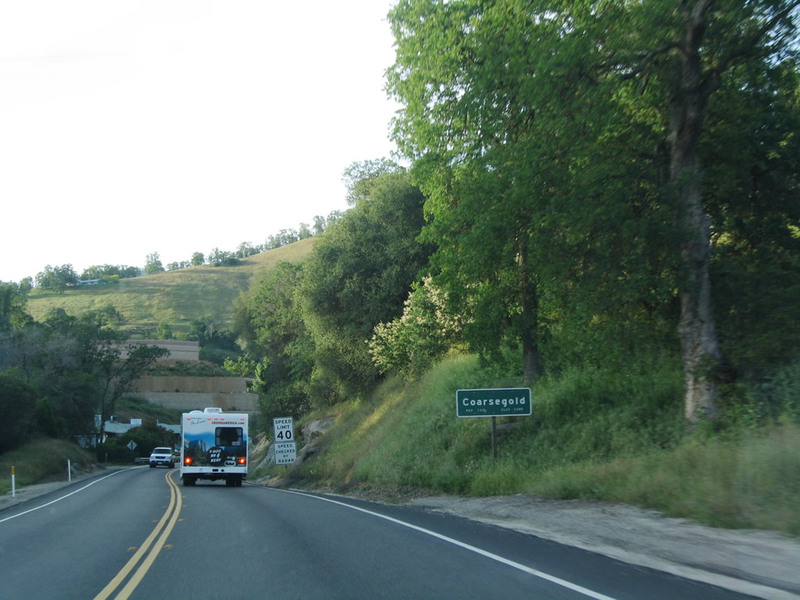 California 41 enters the unincorporated community of Coarsegold (el. 2,218 feet). 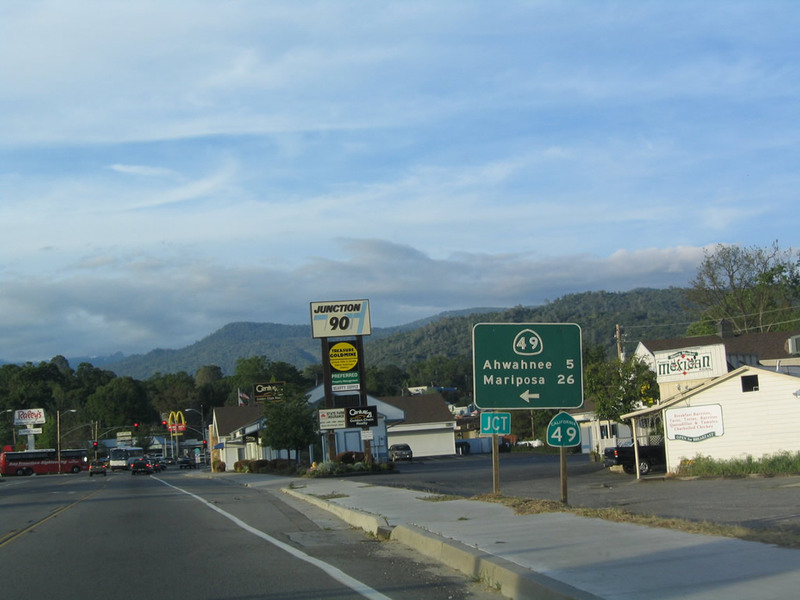 The community had a population of 9,391 as of the 2000 Census and is perhaps best known for its role in the 1849 Gold Rush and Coarsegold Tarantula Festival. Photo taken 05/13/05. 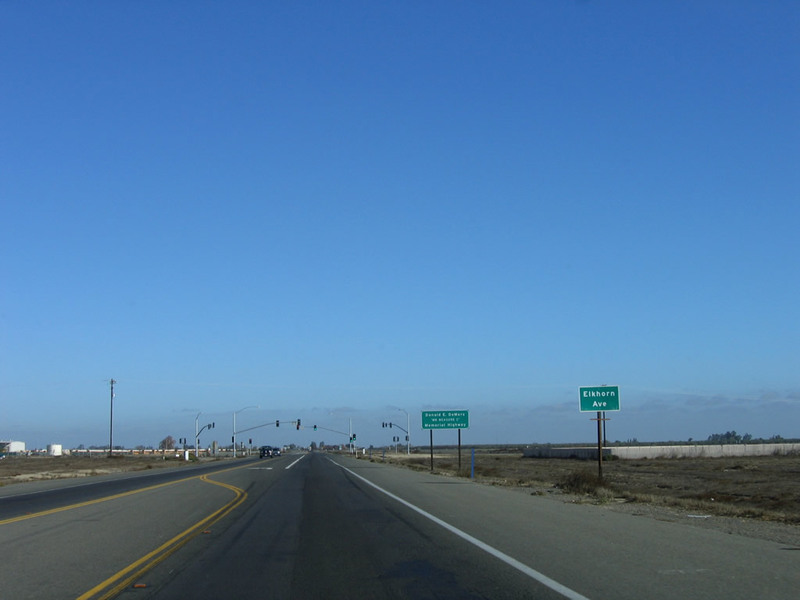 Northbound California 41 meets Road 415 (Raymond Road), which travels west to Raymond. Photo taken 05/13/05. 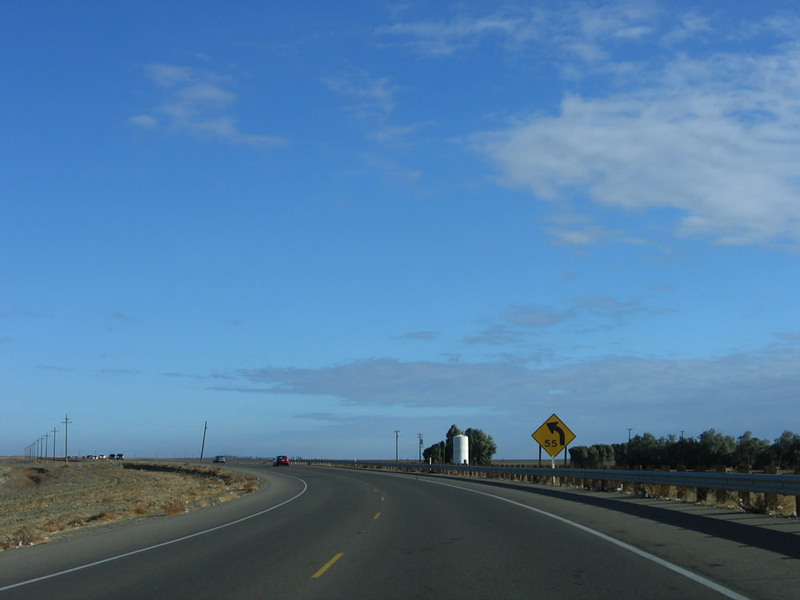 A California 41 north reassurance shield is posted after the Road 415 intersection. Photo taken 05/13/05. Passing through downtown Coarsegold, most motorist services (food, gas, shopping) are available. Photo taken 05/13/05. 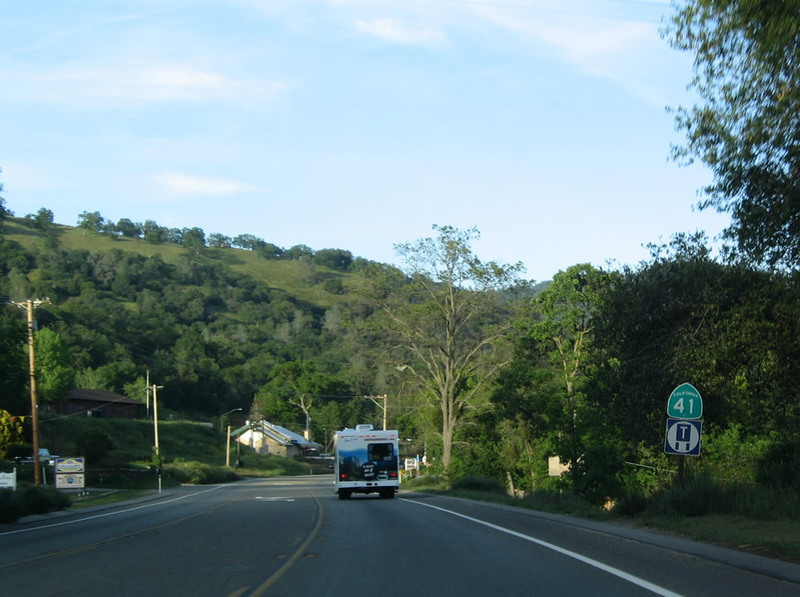 Leaving downtown Coarsegold, another California 41 north reassurance shield is posted. Photo taken 05/13/05. 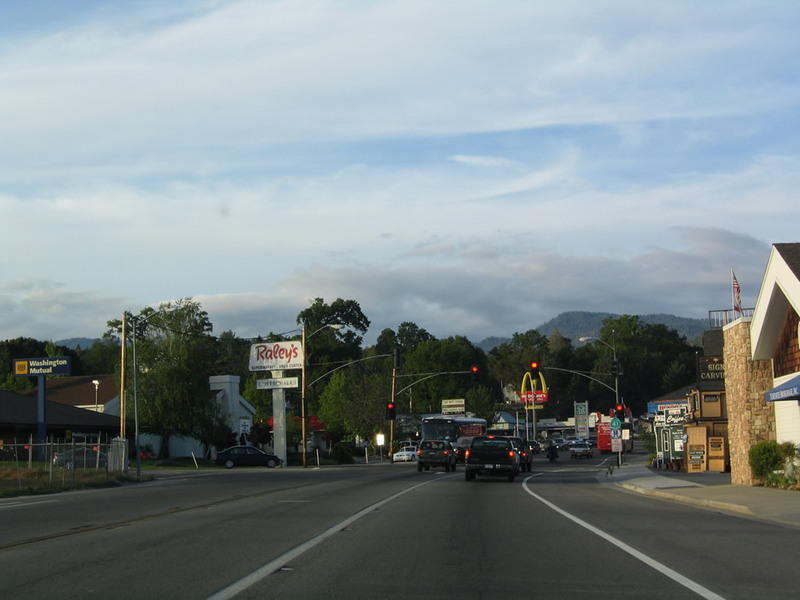 California 41 enters the unincorporated community of Oakhurst (el. 2,274 feet). 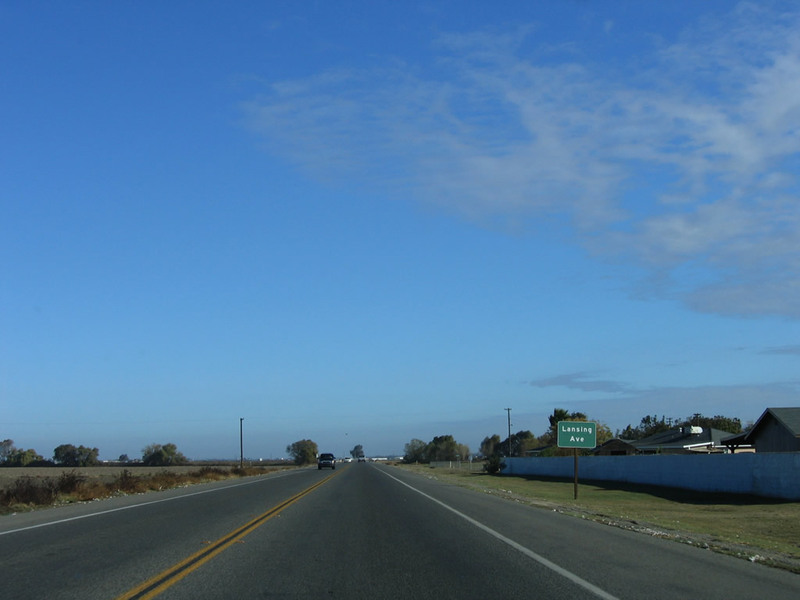 The community had a population of 2,868 as of the 2000 Census and is located at the southern end of California 49, the Gold Country (Mother Lode) Highway. Photo taken 05/13/05. 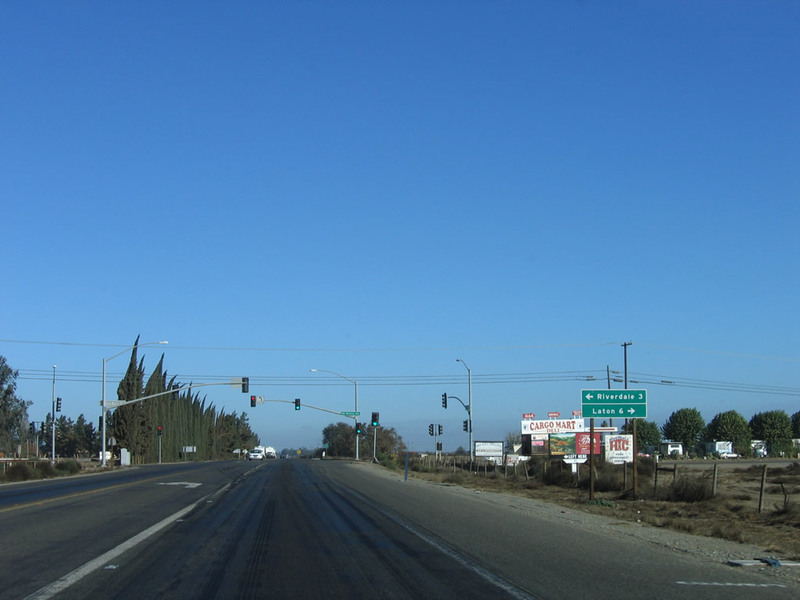 The next signalized intersection along California 41 north is with California 49 northwest to Ahwahnee (six miles) and Mariposa (26 miles), where the highway meets California 140. A large shopping center is located at the southwestern corner of this intersection. Photo taken 05/13/05. California 49 travels through the foothills of the Sierra Nevada from Oakhurst northwest to Mariposa, Coulterville, Sonora, Angels Camp, Jackson, San Andreas, Placerville, and Auburn. 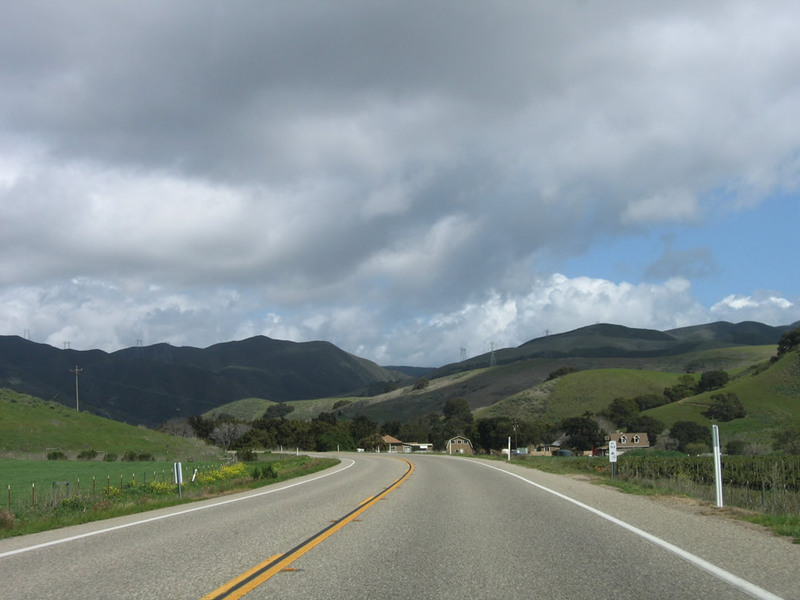 Each of these communities have their connection with the Gold Rush of 1848-1849, and California 49 links them all together. Photo taken 05/13/05. 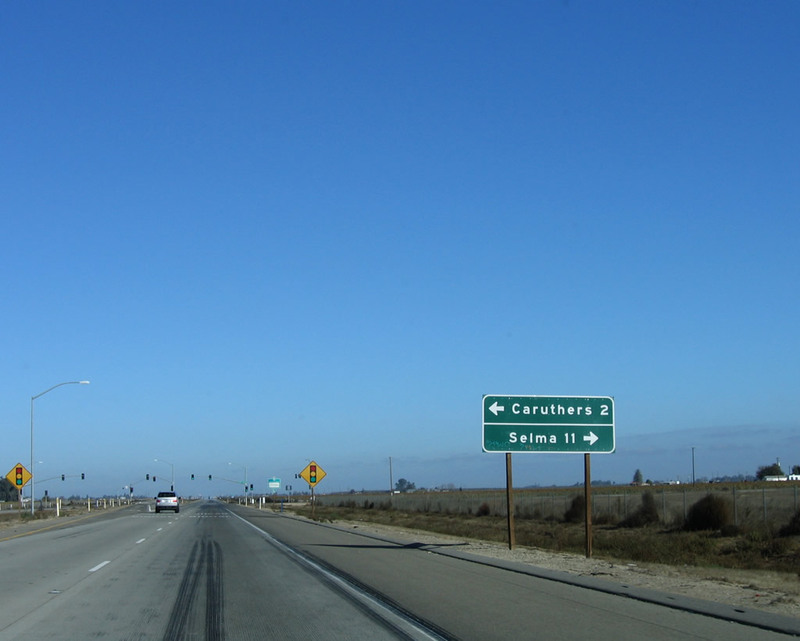 A California 41 reassurance shield is posted at the intersection with California 49. 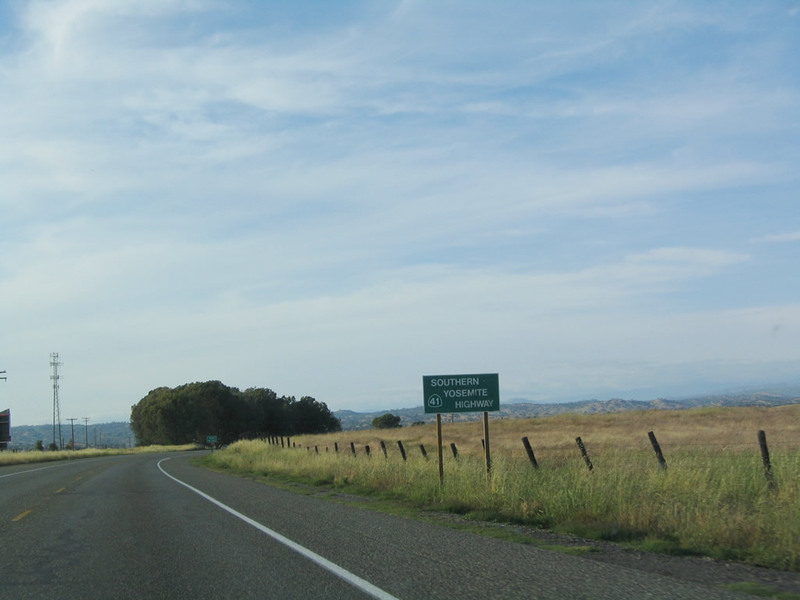 California 41 continues north into the southern entrance to Yosemite National Park. Photo taken 05/13/05. 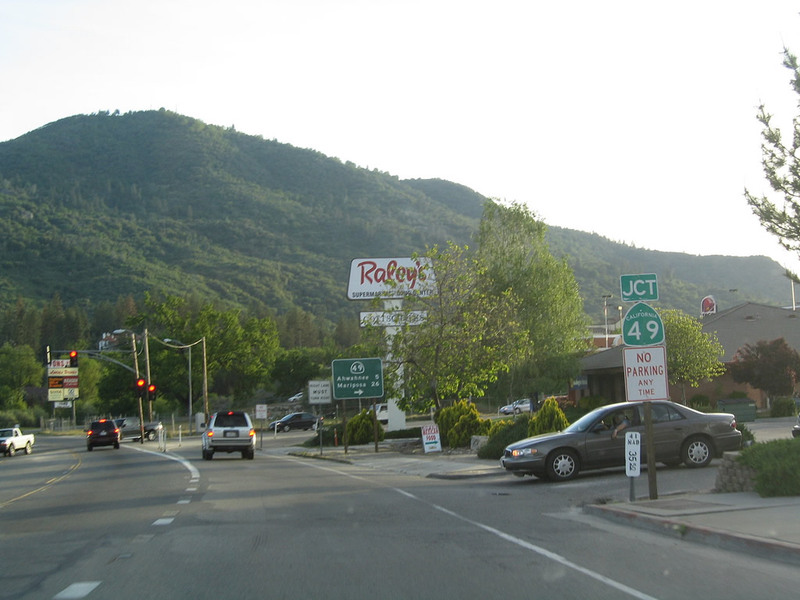 Leaving Oakhurst, northbound California 41 approaches a tourist information center. 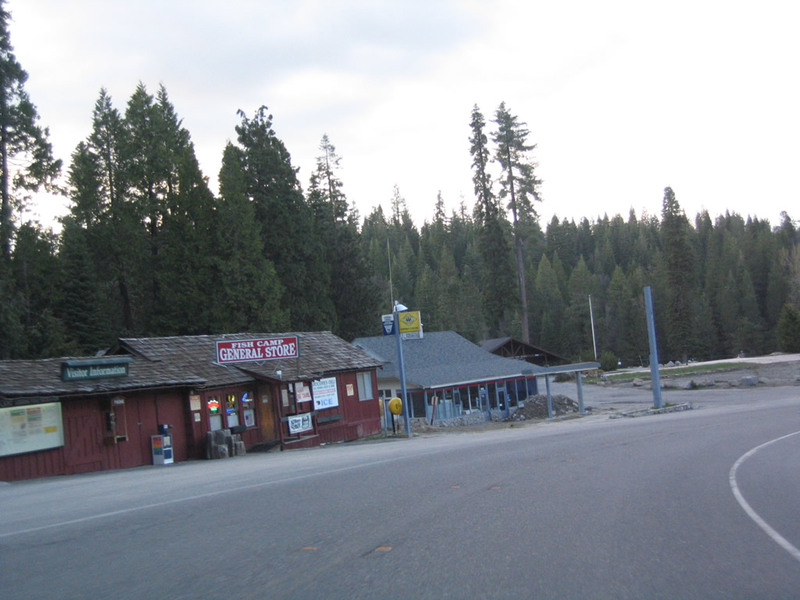 It is worth stopping here to learn about attractions along the state route leading through Sierra National Forest into Yosemite National Park. Photo taken 05/13/05. 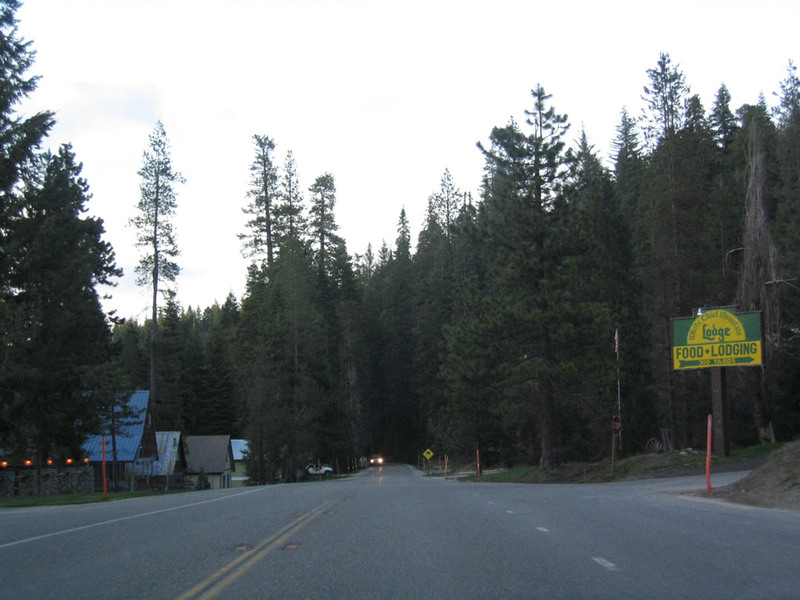 Northbound California 41 approaches Road 222 / Bass Lake Road east to Bass Lake in Sierra National Forest. Photo taken 05/13/05. 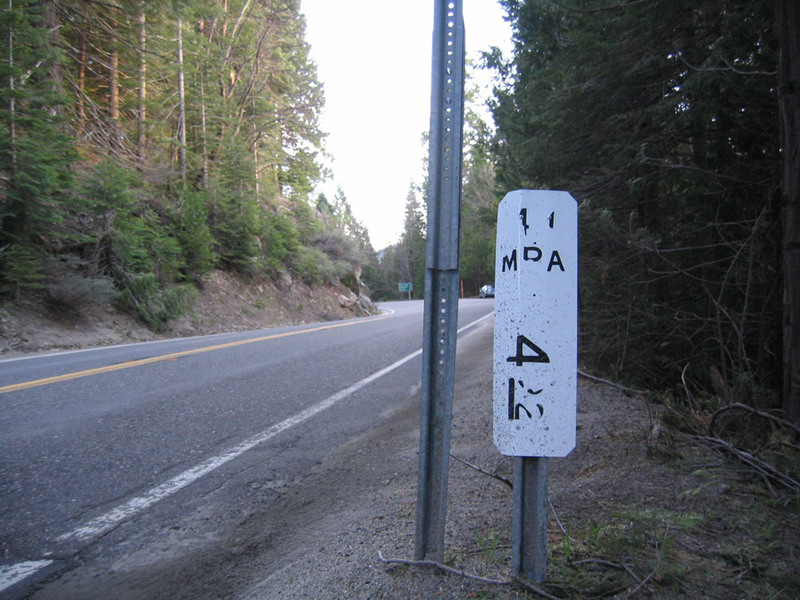 This mileage sign provides the distance to Fish Camp (12 miles), Yosemite National Park southern entrance (13 miles), and Yosemite Valley (45 miles). Photo taken 05/13/05. 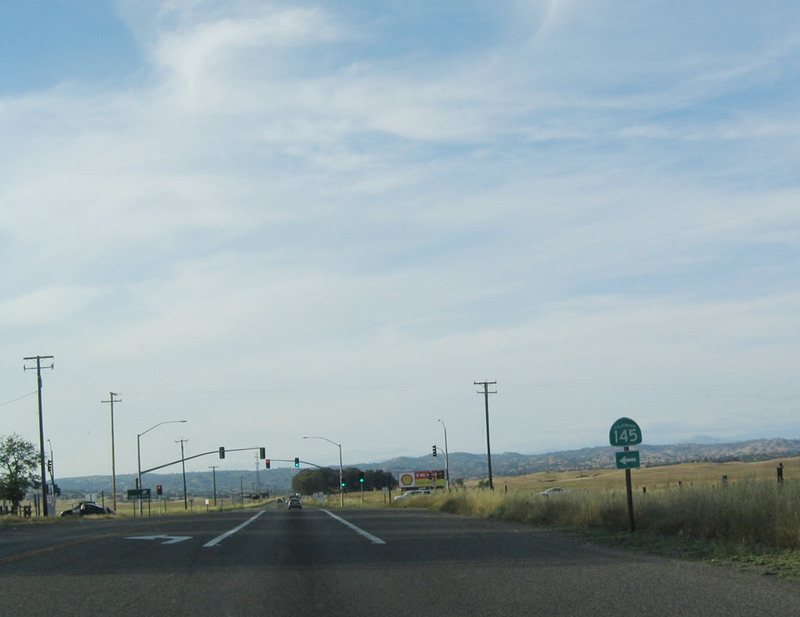 Northbound California 41 approaches Road 620 / Bassett Station Road west. Photo taken 05/13/05. 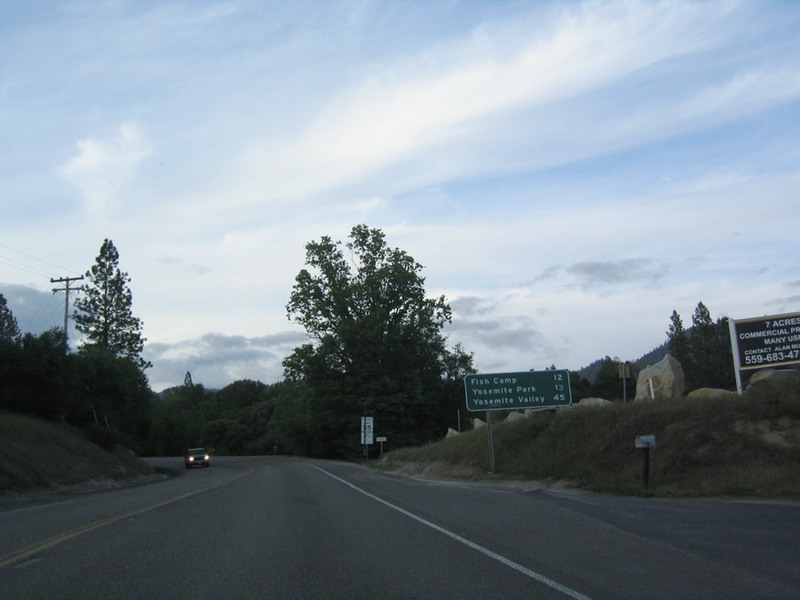 California 41 enters Sierra National Forest. Photo taken 05/13/05. 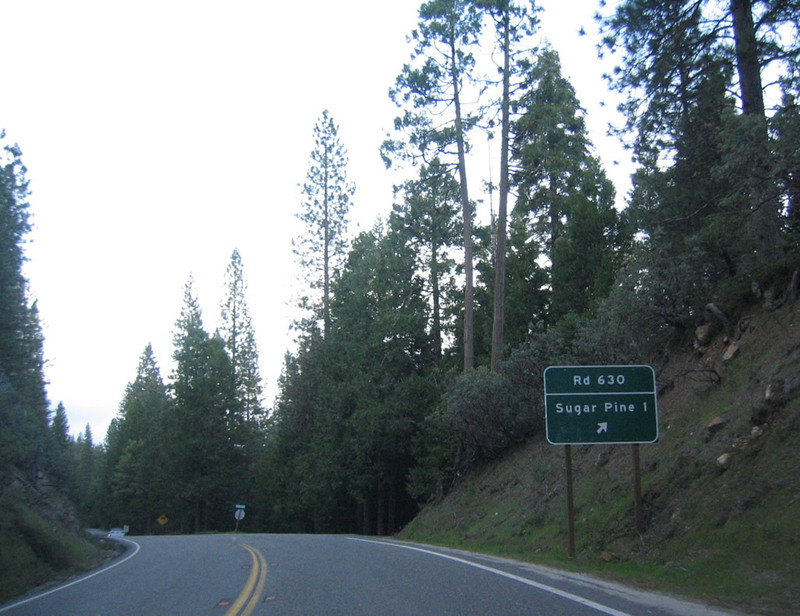 Northbound California 41 approaches Road 630 northeast to Sugar Pine (one mile). Photo taken 05/13/05. 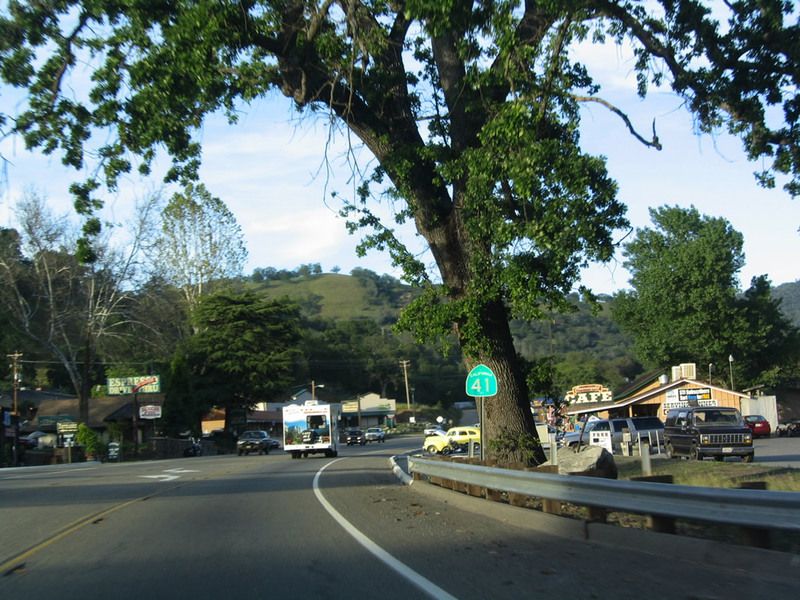 California 41 leaves Madera County and enters Mariposa County. Photo taken 05/13/05. 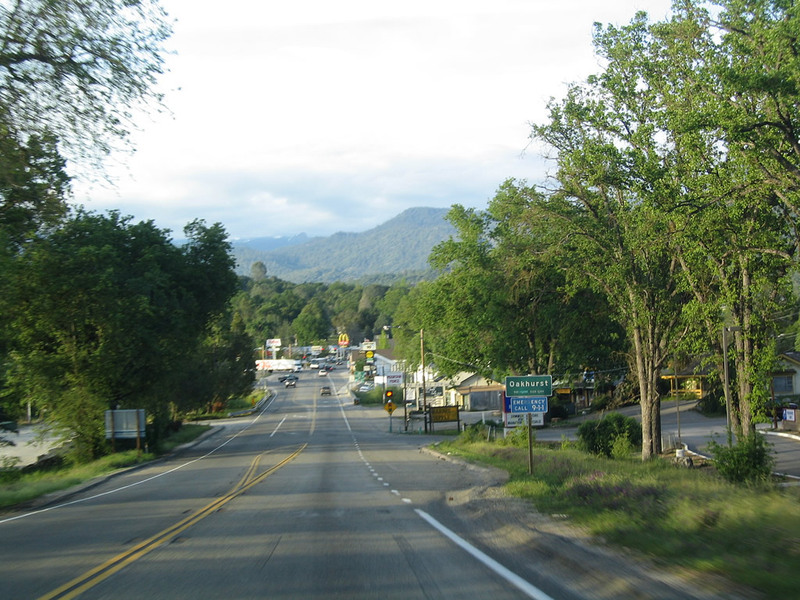 Northbound California 41 enters the unincorporated community of Fish Camp, elevation 5,062 feet. Photo taken 05/13/05. California 41 crosses over Big Creek. Photo taken 05/13/05. 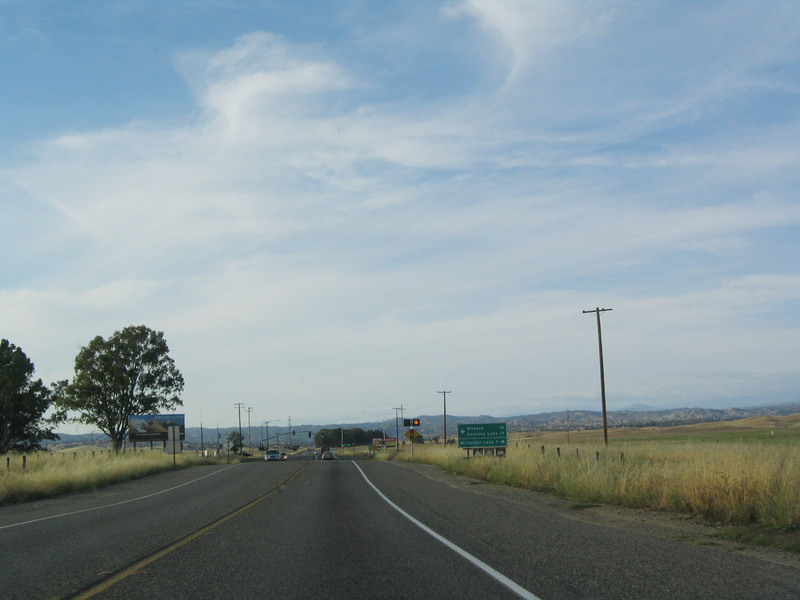 Northbound California 41 approaches the turnoff to White Chief Mountain Lodge. We are almost to the northern end of the state highway as we leave Fish Camp. Photo taken 05/13/05. 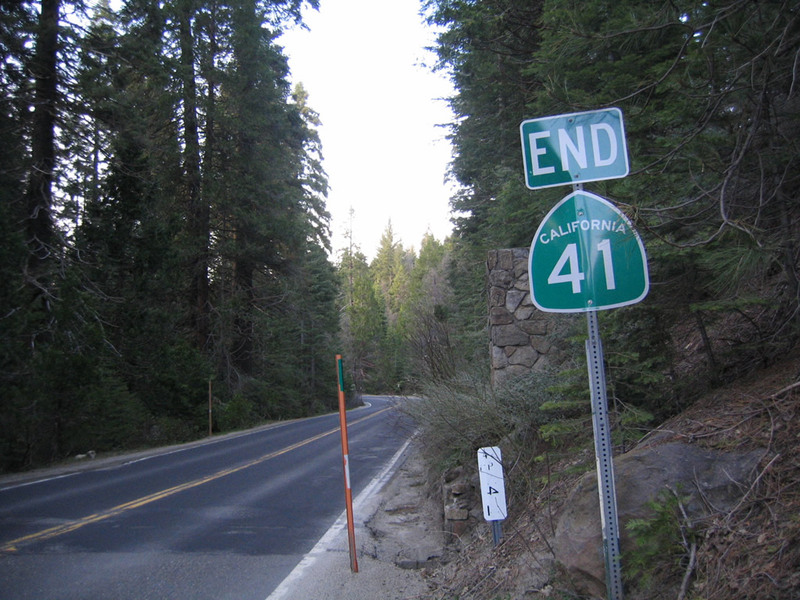 After leaving Fish Camp, California 41 reaches its northern end as it enters Yosemite National Park. 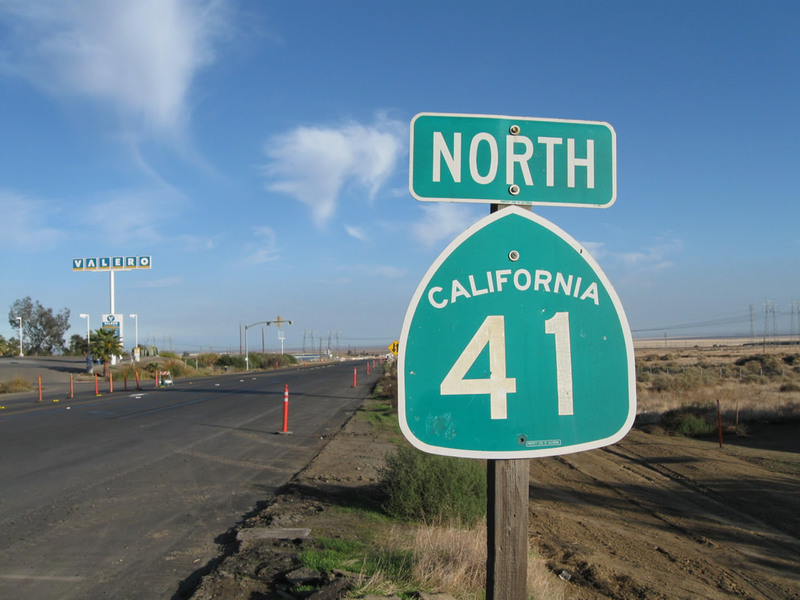 An end shield is posted for California 41. 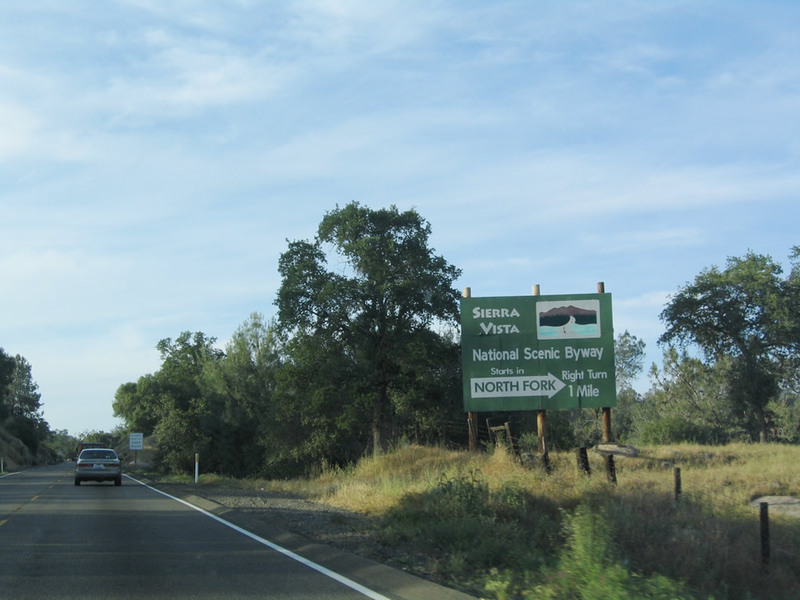 However, the highway continues north as Wawona Road en route to Yosemite Valley. 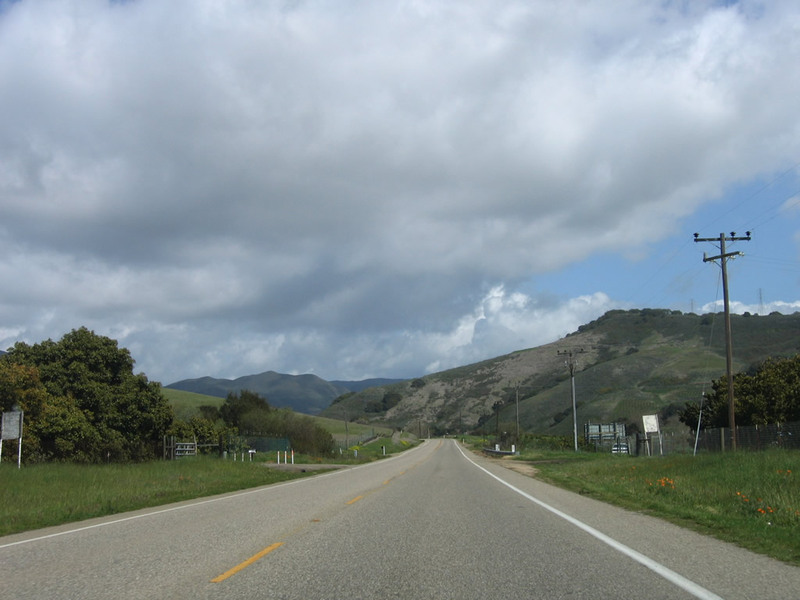 Caltrans maintenance ends and National Park Service maintenance begins. Photo taken 05/13/05. 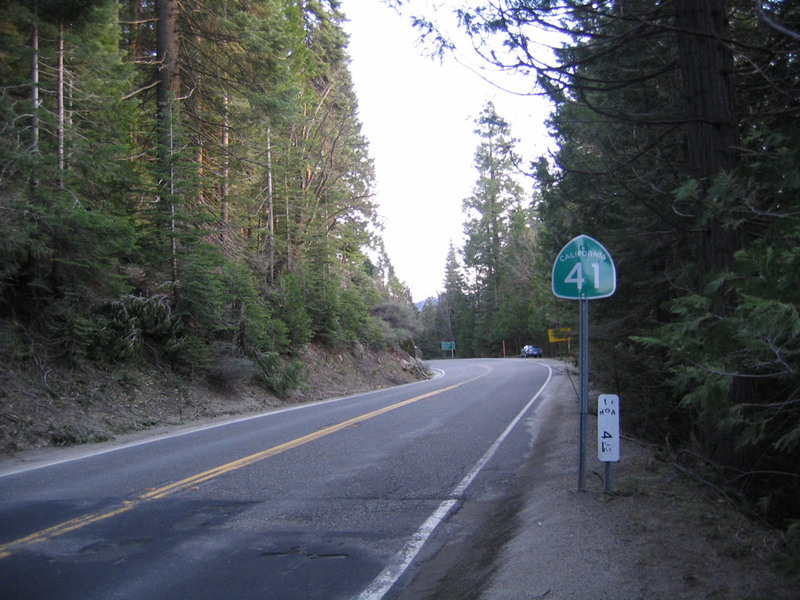 California 41 changes into Wawona Road, which travels into Yosemite National Park from the south. Photo taken 05/13/05. 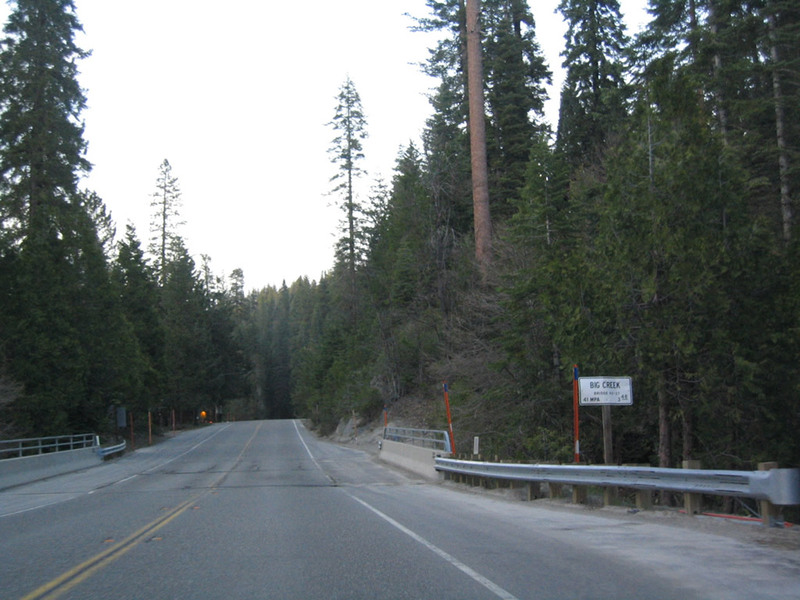 Wawona Road approaches Mariposa Grove Road. 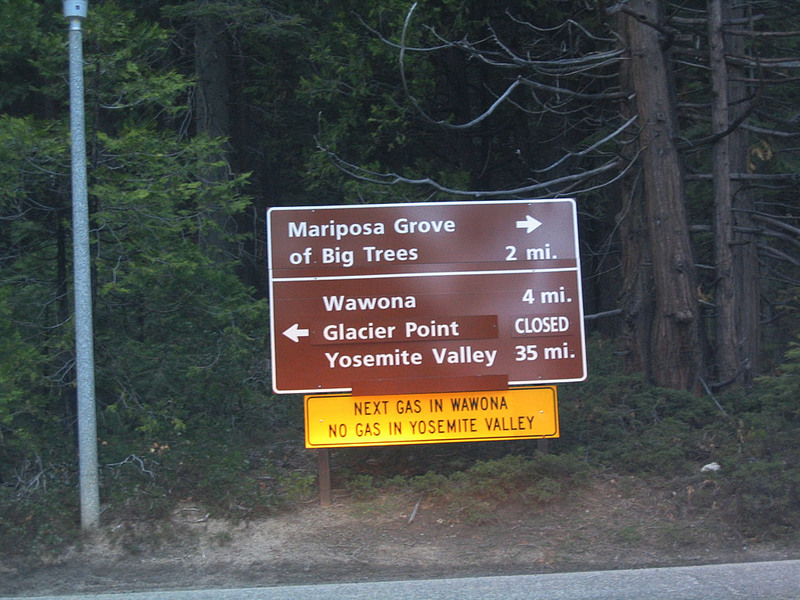 Turn right to the Mariposa Grove of Big Trees or left to follow Wawona Road north to Wawona and Yosemite Valley. Photo taken 05/13/05. 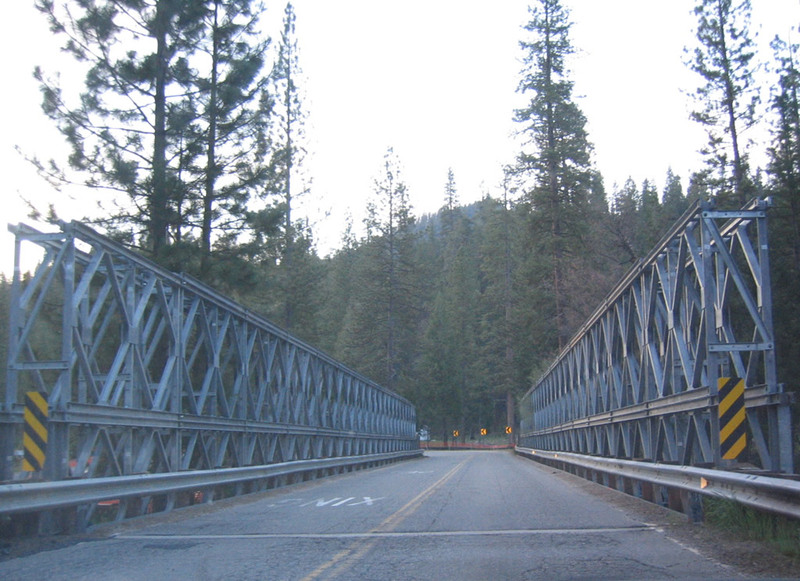 A bridge carries Wawona Road over a river. Photo taken 05/13/05. 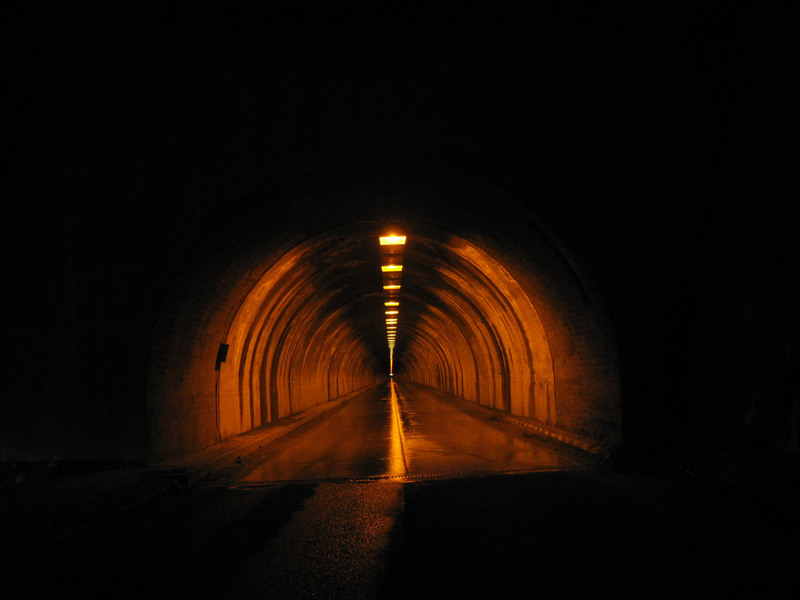 Later that evening, we approach the 4,233-foot Wawona Tunnel. 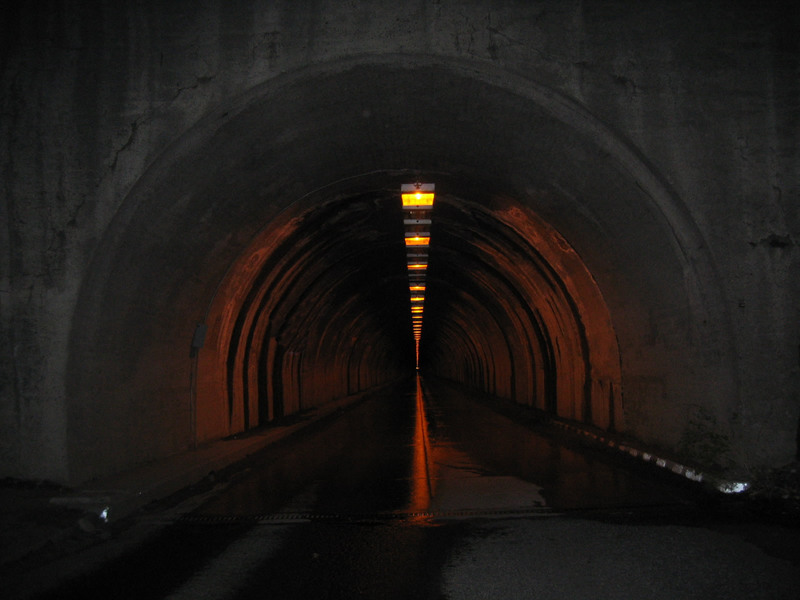 This tunnel was built in 1932 and is the longest highway tunnel in California (as of 2009). Side shafts lead from the tunnel to sheer cliffs above Yosemite Valley, and these shafts serve as ventilation shafts. Photo taken 05/13/05. 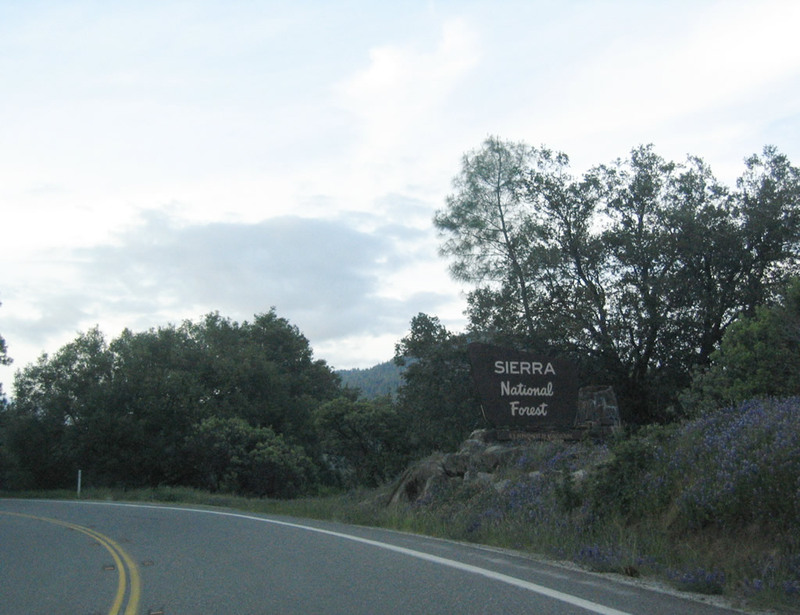 Leaving Yosemite National Park, southbound California 41 sees its first shield where Caltrans takes over maintenance from the National Park Service. Photo taken 05/13/05. 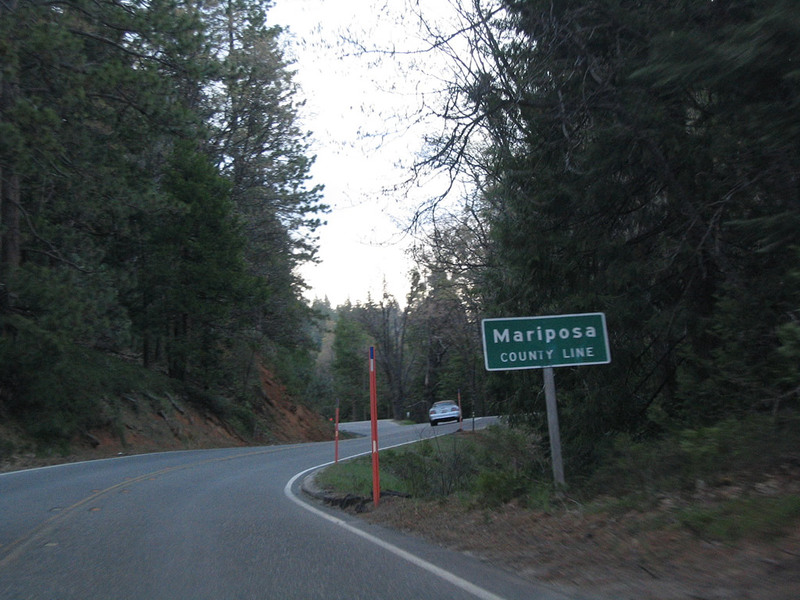 Next to the first reassurance shield for California 41 south is this postmile marker for 4.92 miles in Mariposa County. Photo taken 05/13/05. 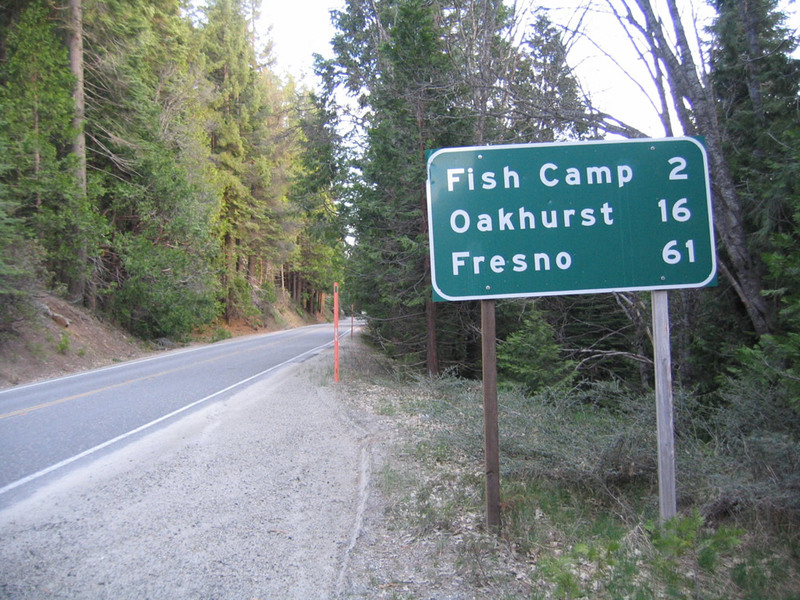 A mileage sign near a turnout provides the distance to Fish Camp (two miles), Oakhurst (16 miles), and Fresno (61 miles). Photo taken 05/13/05. 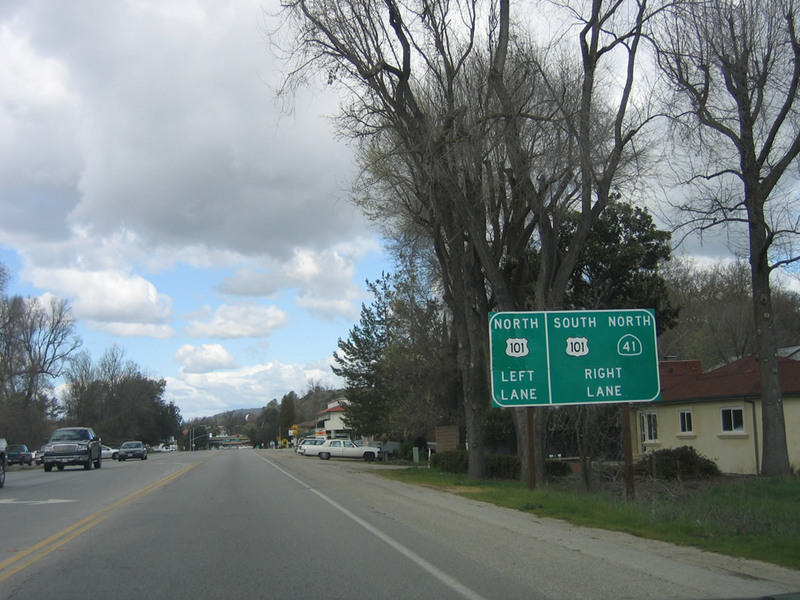 Southbound California 41 approaches California 49 in downtown Oakhurst. Use California 49 northwest to Ahwahnee and Mariposa. 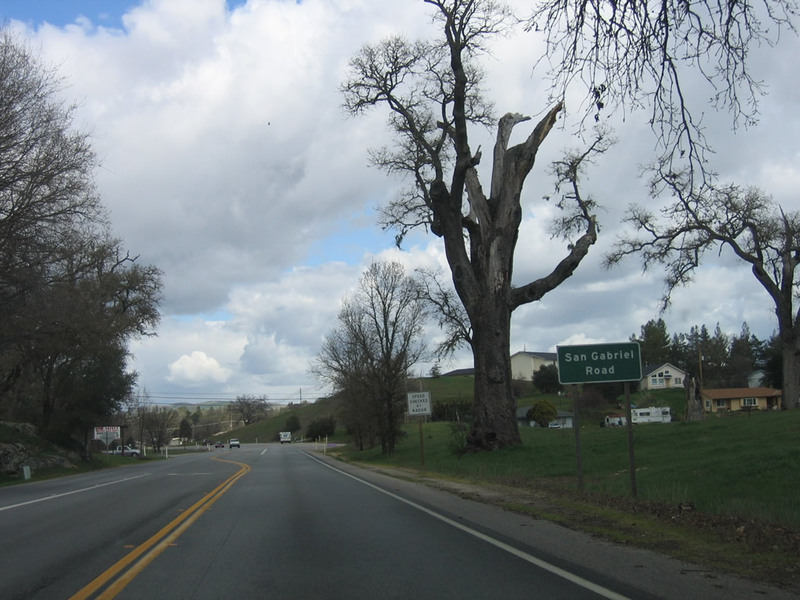 This intersection serves as the southern terminus of this storied state route. Photo taken 05/13/05. Within Yosemite National Park at the south end of Glacier Point Road where it intersects Wawona Road (in Chinqualpin Junction), this sign (placed by the National Park Service) provides directions to Wawona Road south to California 41 south to Fresno or Wawona Road north to Yosemite Valley, California 120/Big Oak Road, and California 140/El Portal Road. Photo taken 05/13/05. Page Updated November 30, 2011.